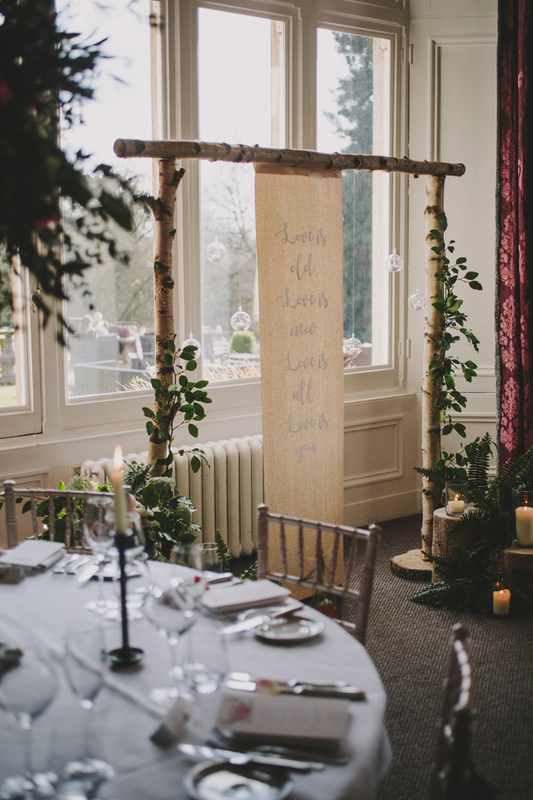 Hampton Manor plays host to many happy events during the year but it is the home of winter weddings. 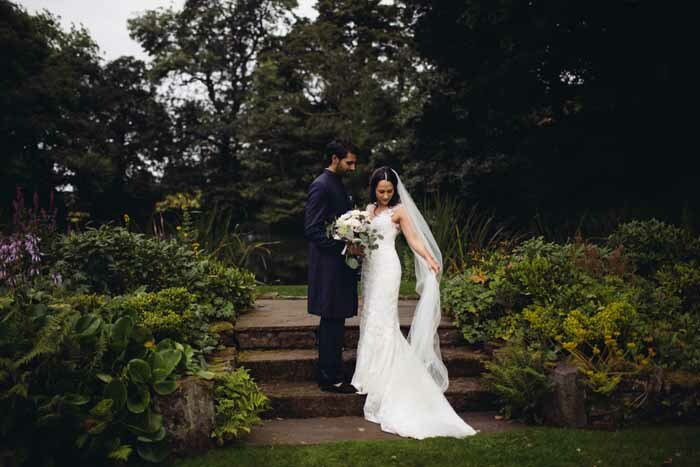 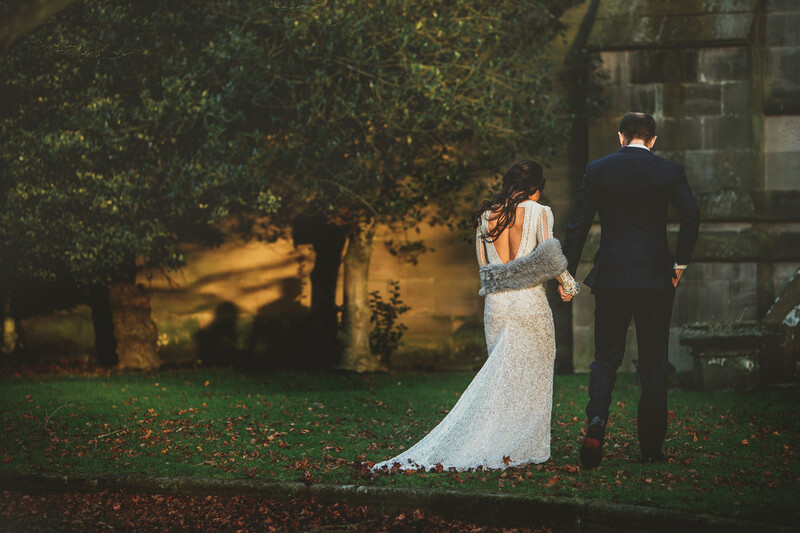 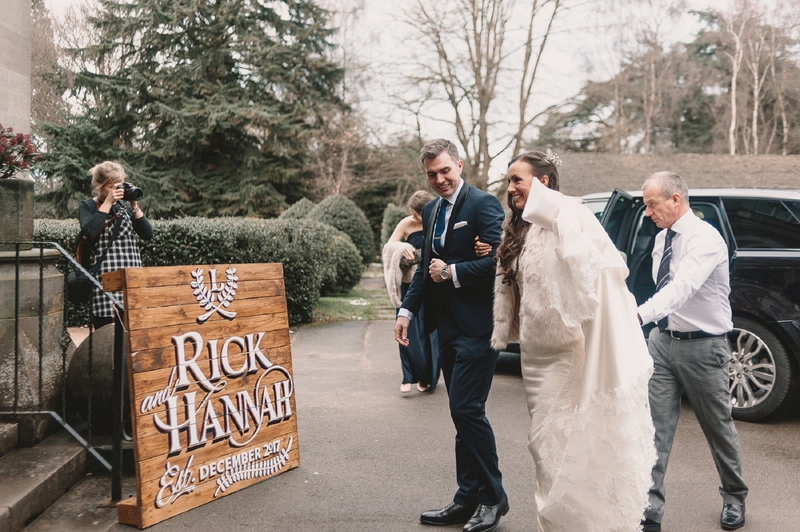 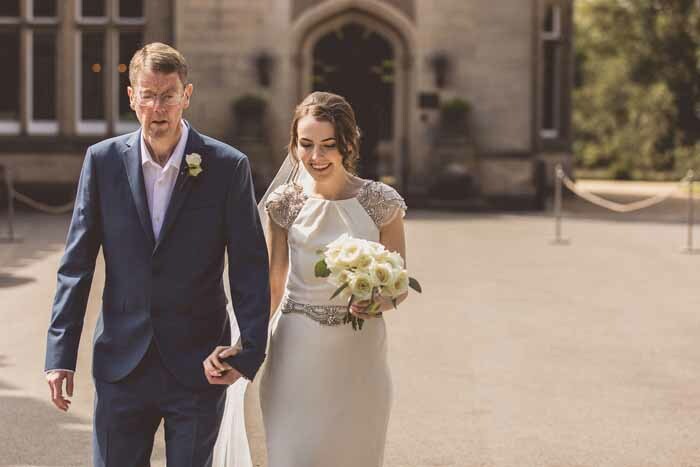 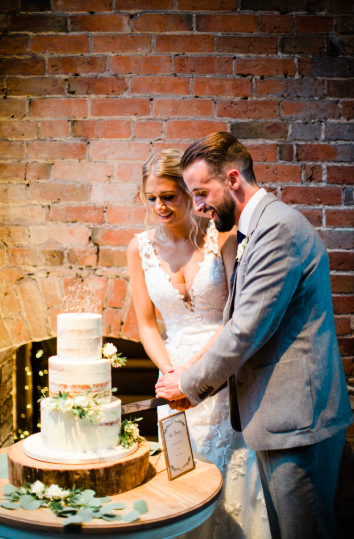 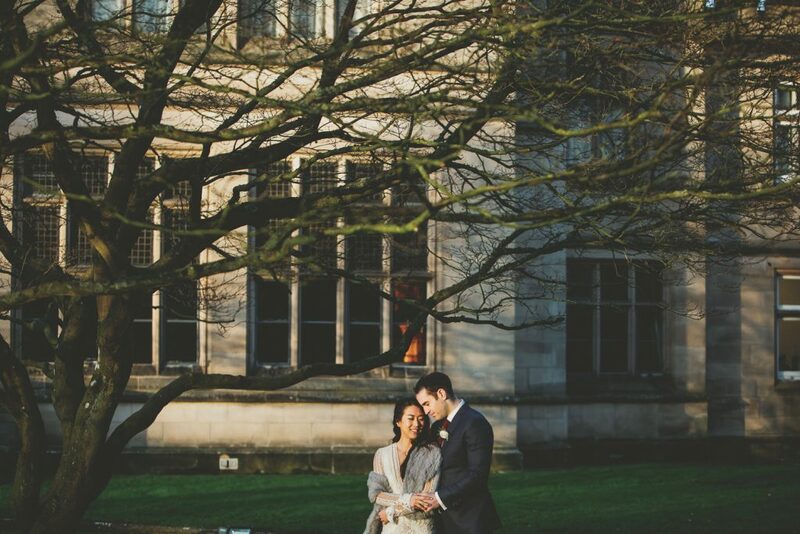 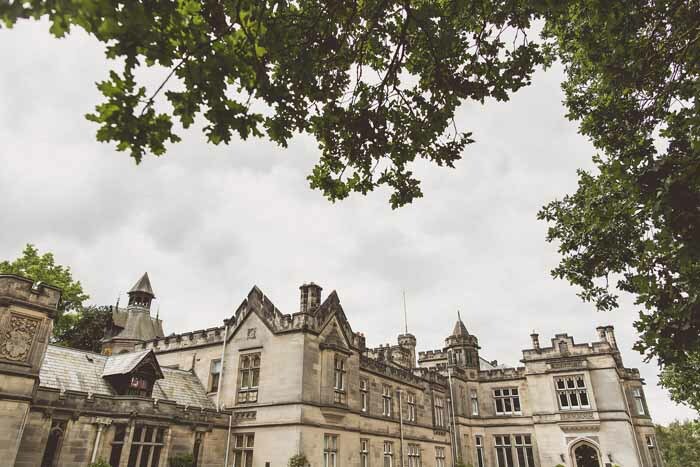 Hannah and Rick chose the Manor as the setting for their elegant romantic wedding in December. 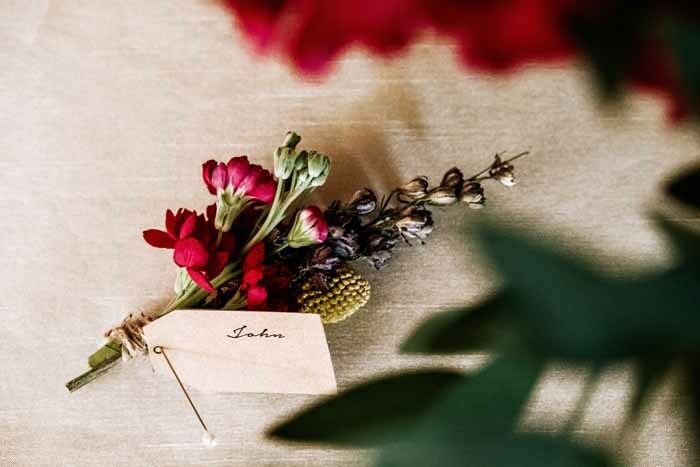 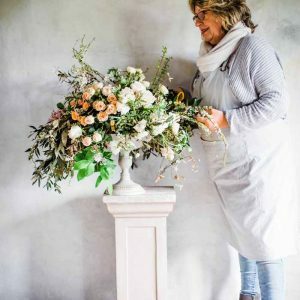 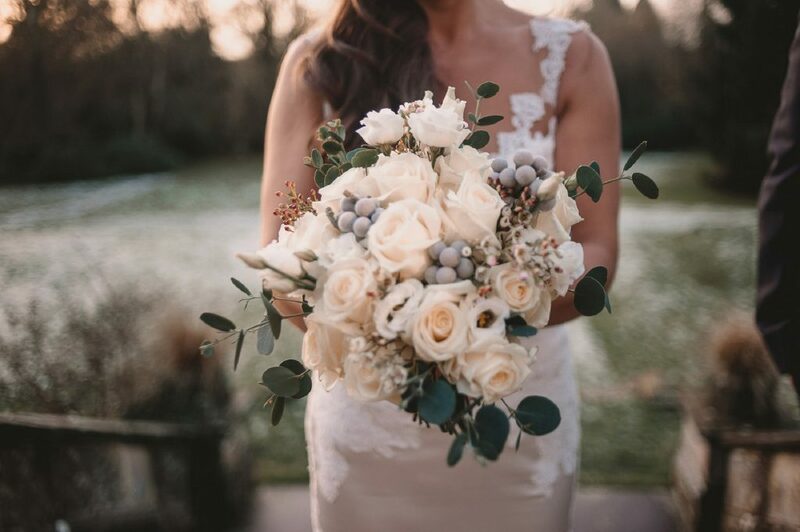 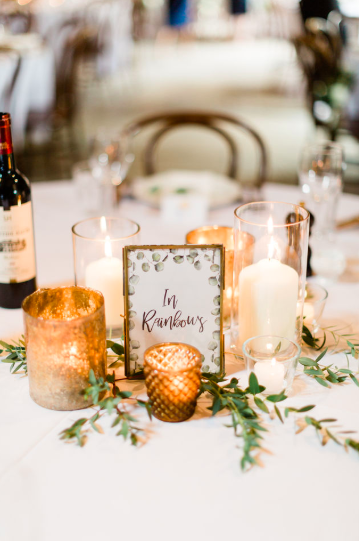 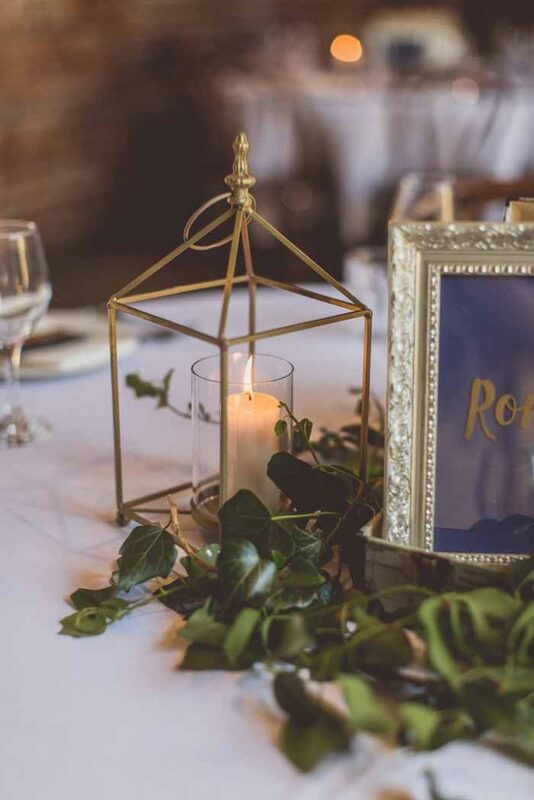 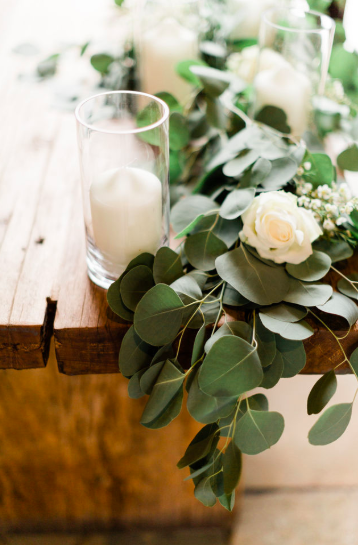 For an elegant winter wedding forgot the strong Christmas vibes of red and green and embrace the season with the softest of roses, brunia berries, wax flowers and lashing of eucalyptus. 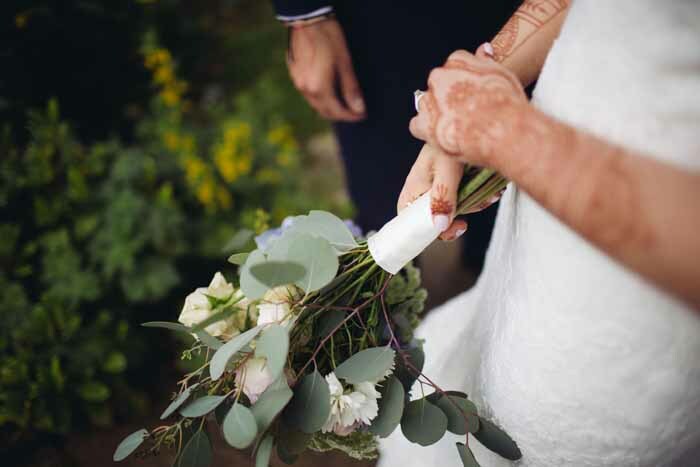 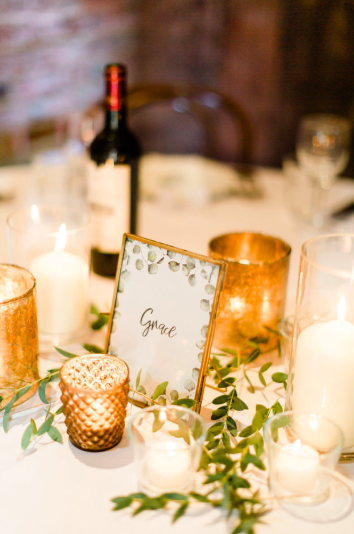 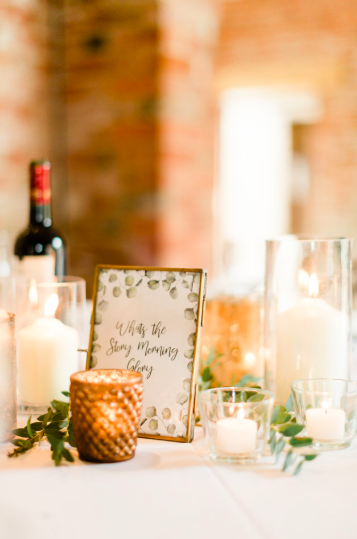 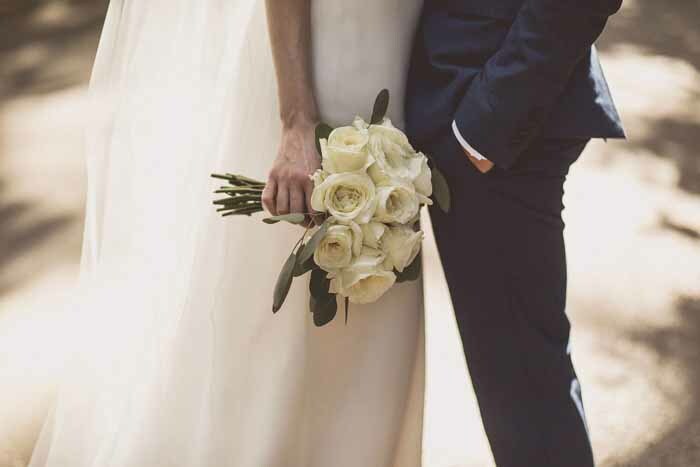 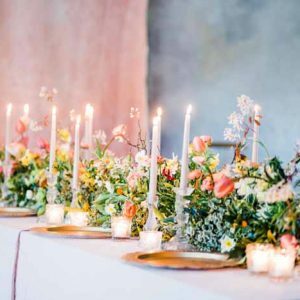 A winter wedding ceremony needs the softest candlelight and petals down the aisle with handfuls of foliage at the end of the rows to bring the outside in. 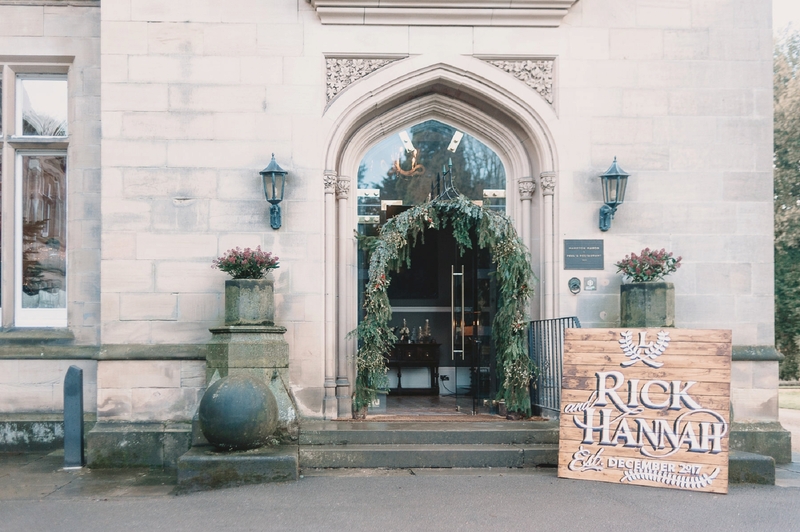 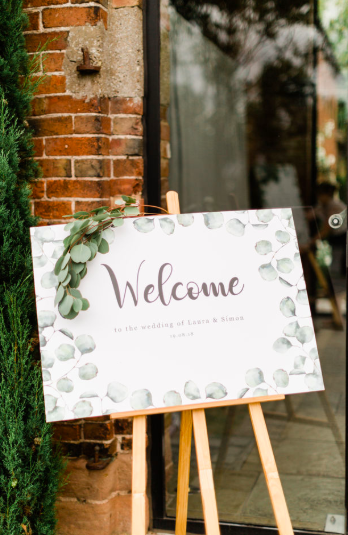 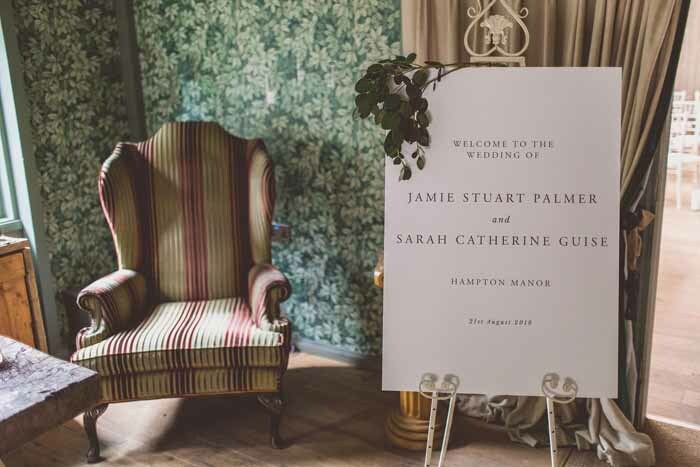 The entrance to the Manor is the perfect place to add an oversized welcome sign. 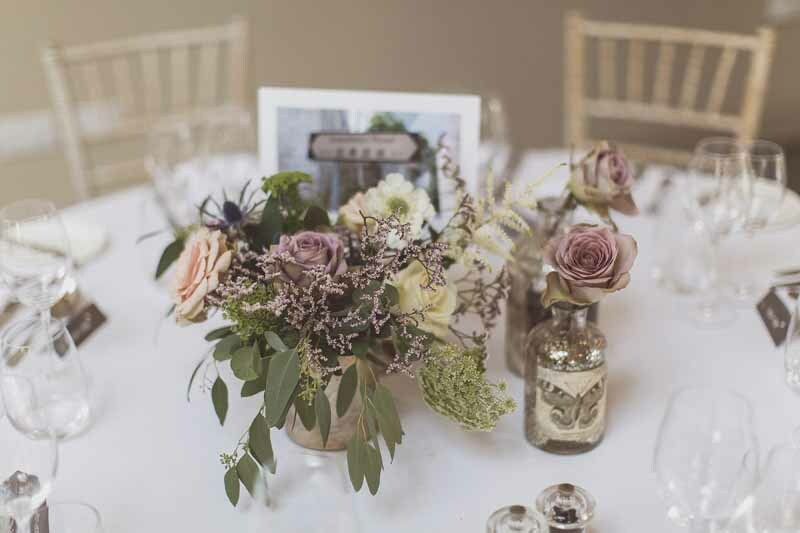 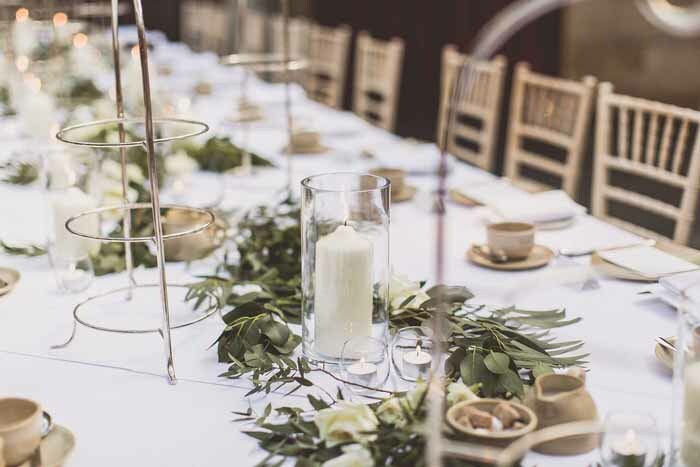 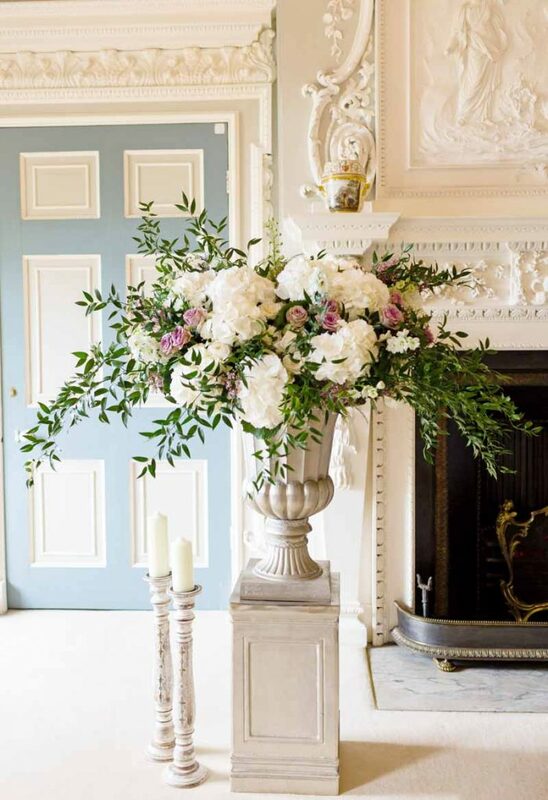 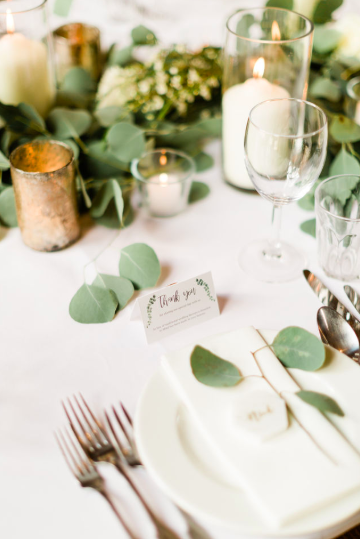 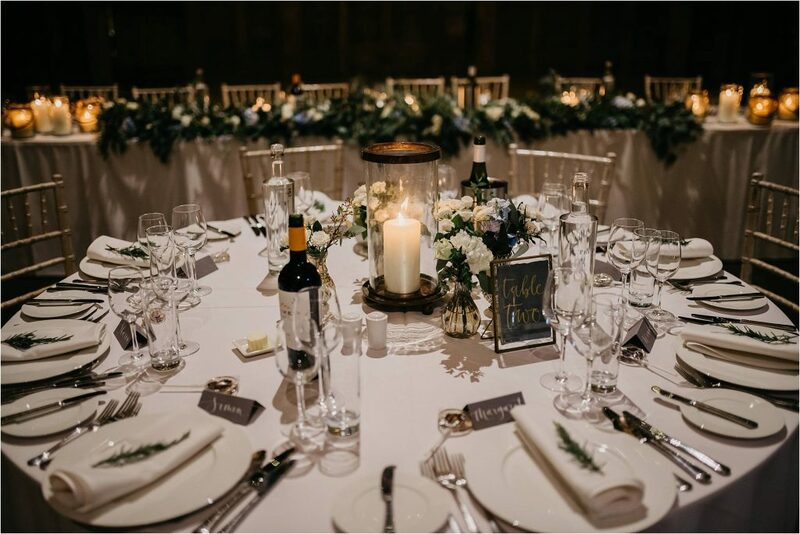 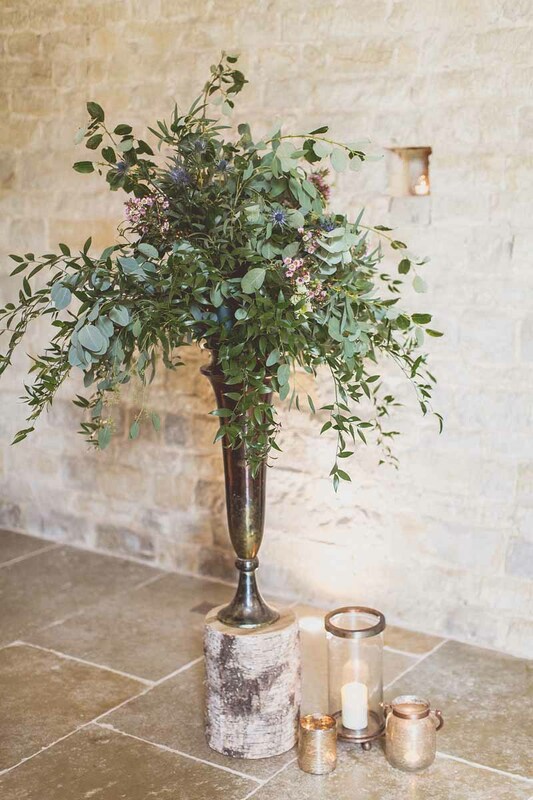 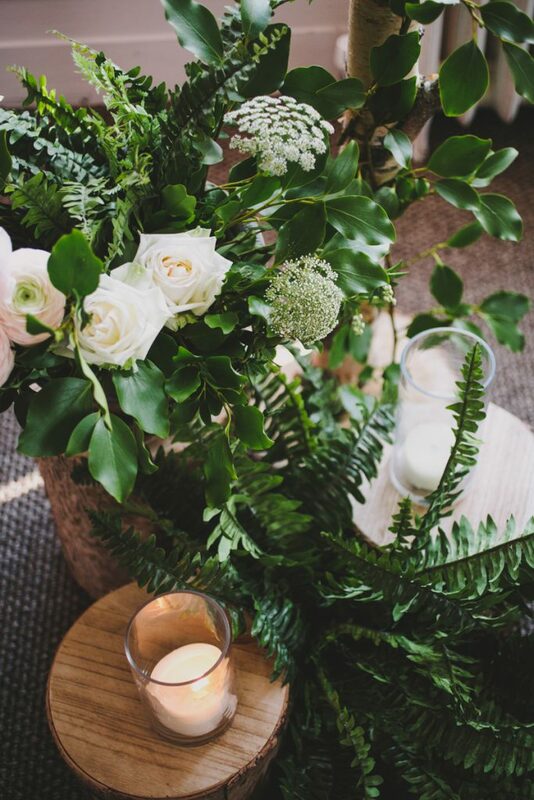 Elegant centrepieces with hurricane vases, church candles and an elegant ring of foliage with the softest blooms continued the winter scheme. 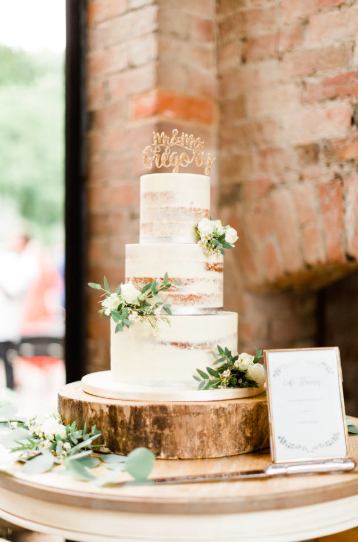 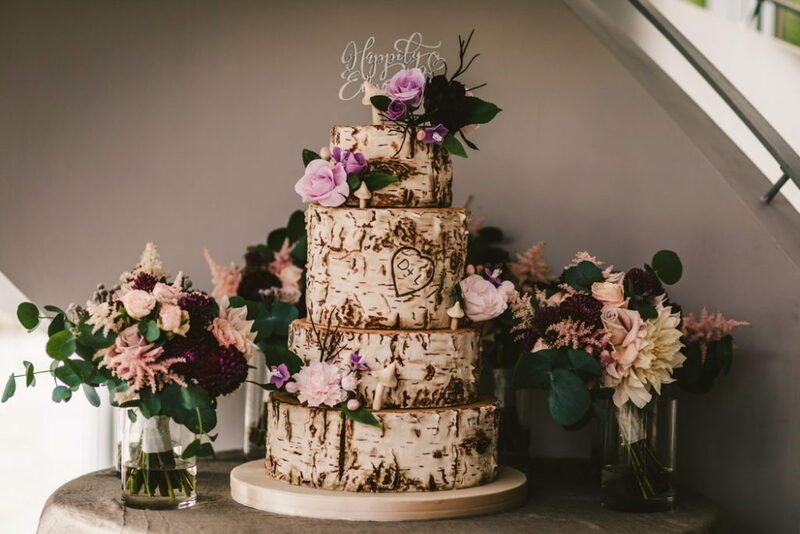 A topper added to the naked cake continues the look of the day. 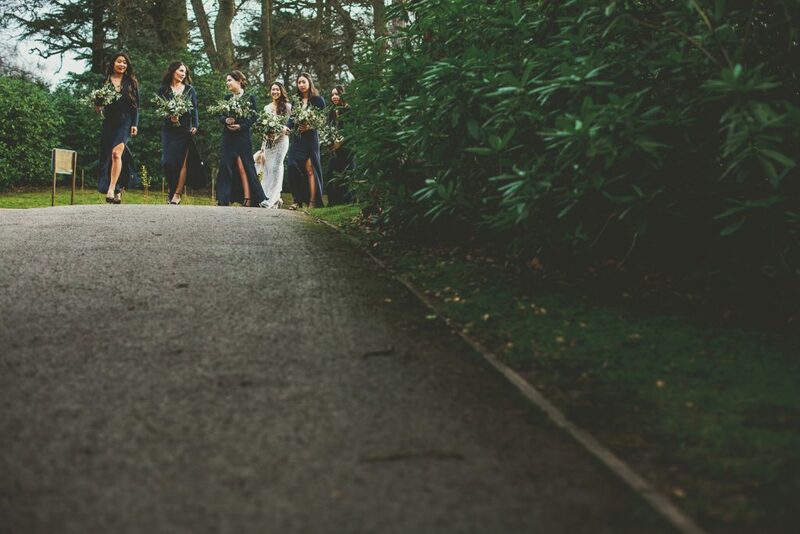 As the days are turning cooler I thought we would share more images of this beautiful wedding at Blackwell Grange. 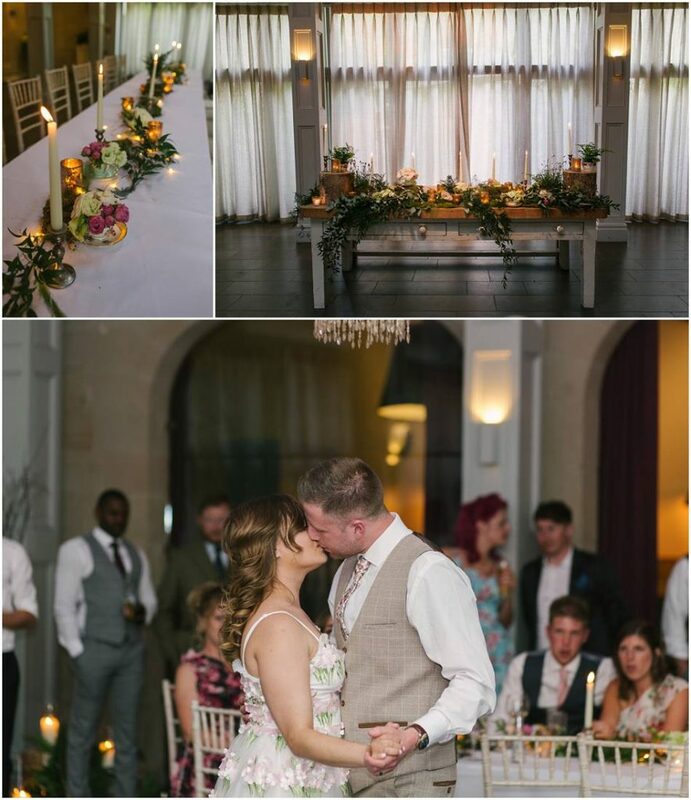 Last September Danielle and Lorance entrusted us to create their flowers and decor and we loved bringing everything together on the day. 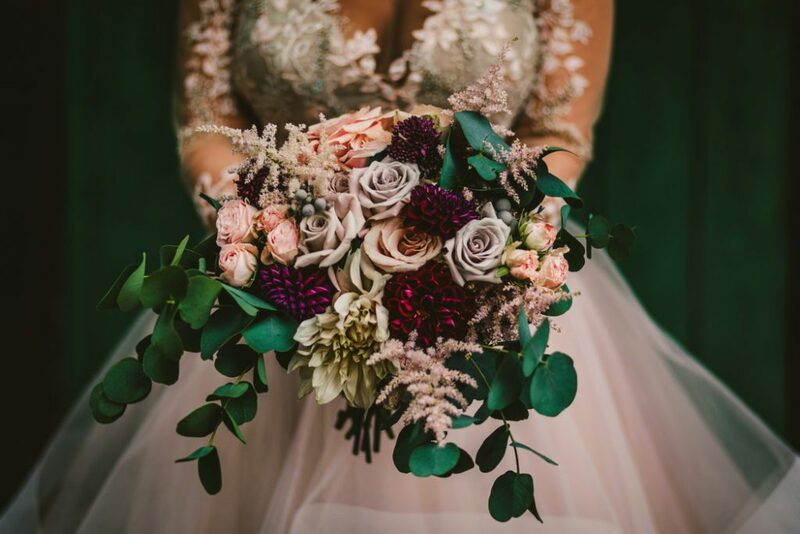 Rich autumn colours were added into the bridal bouquet design for this organic style bouquet with touches of astilbe, dahlia, roses and eucalyptus. 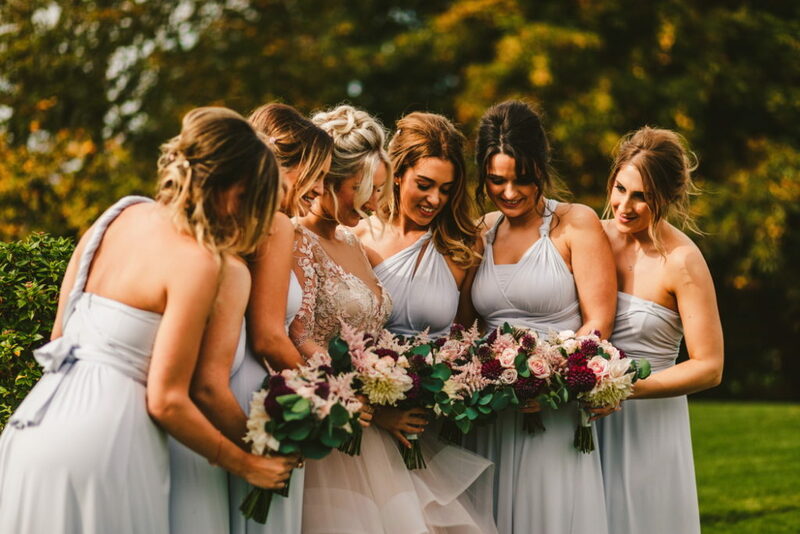 Plenty of foliage and deep burgundy red dahlias carried through into the bridesmaids bouquets. 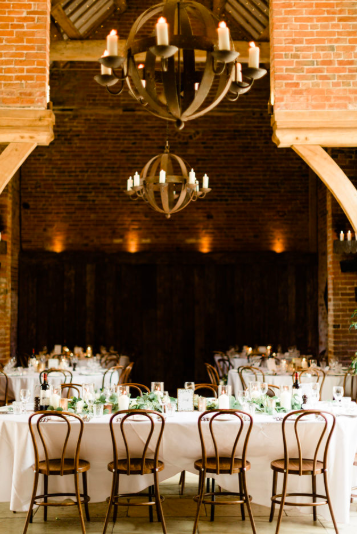 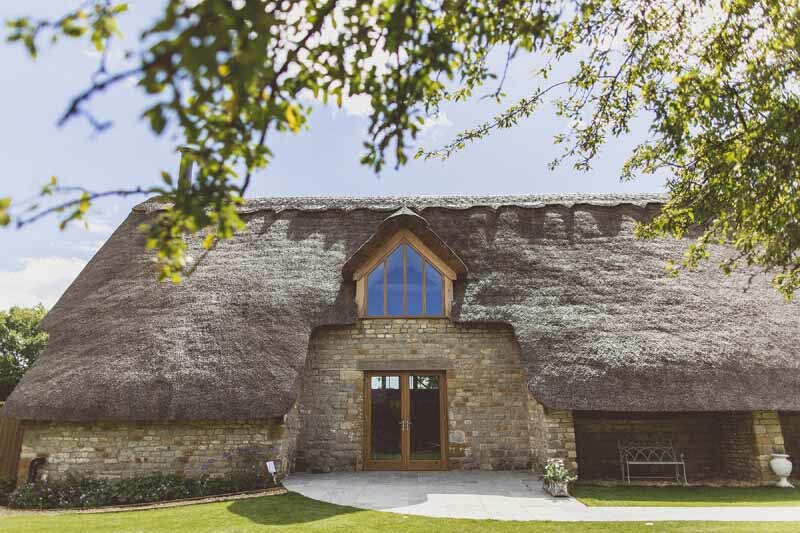 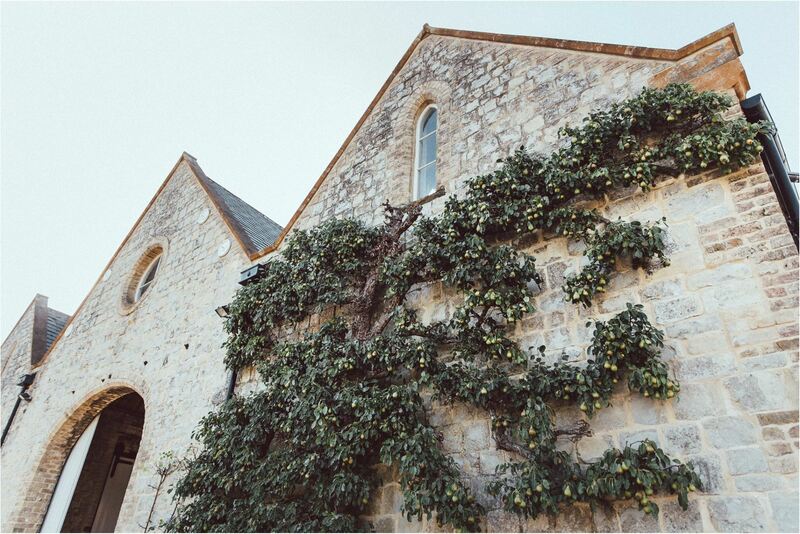 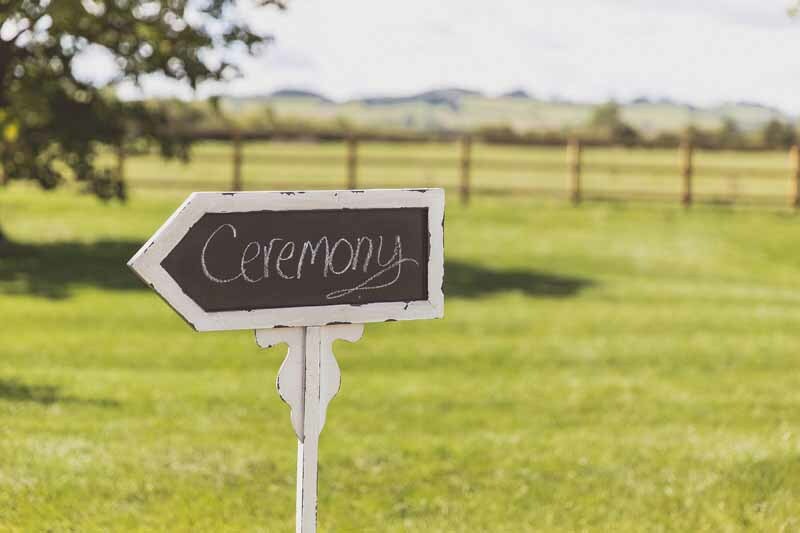 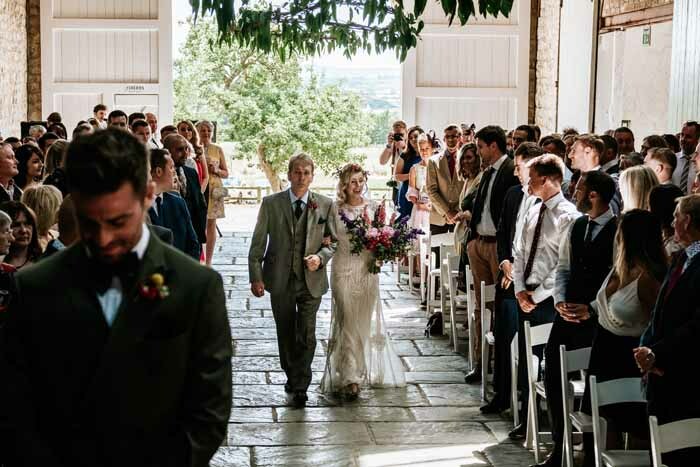 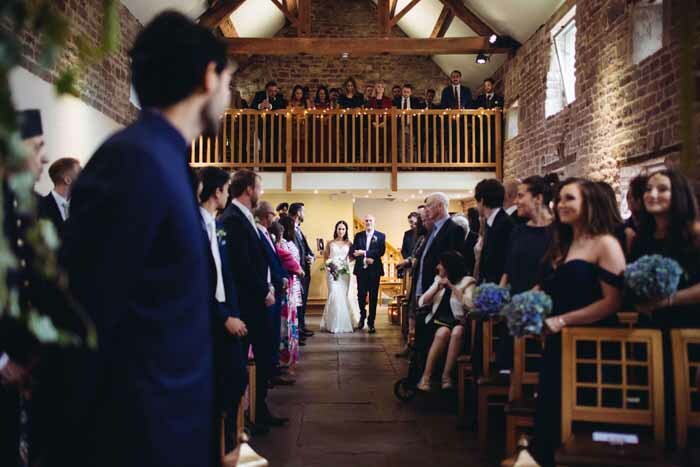 The ceremony barn is a lovely setting for a wedding ceremony nestled into the countryside. 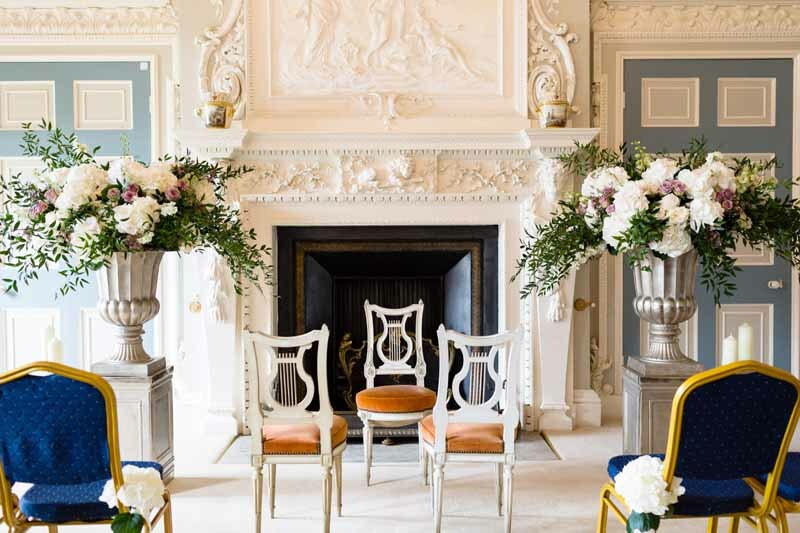 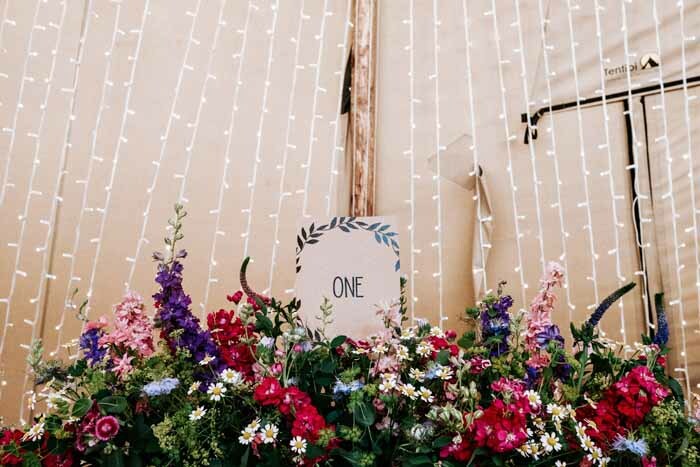 Ceremony decorations included a mix of lanterns, stylish chair flowers and a fireplace decorated in colours of the day. 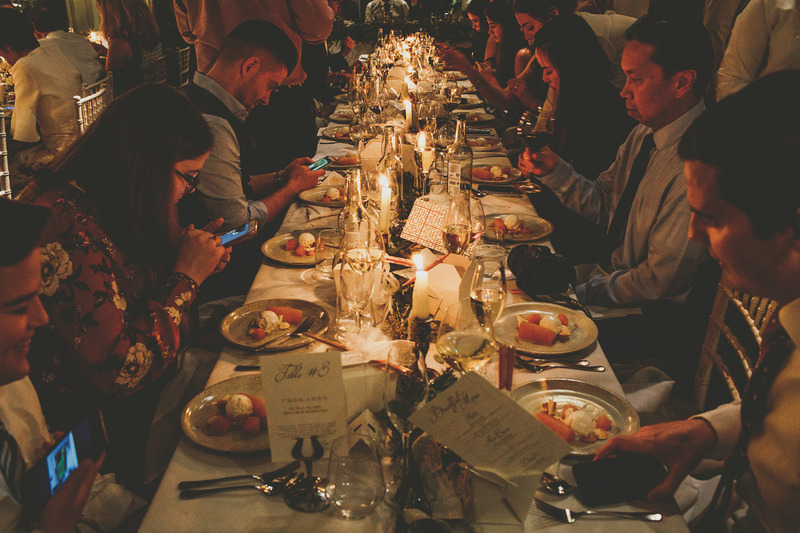 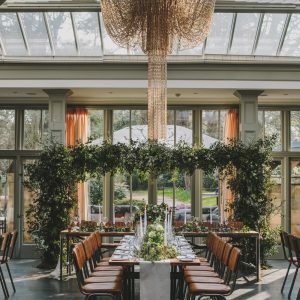 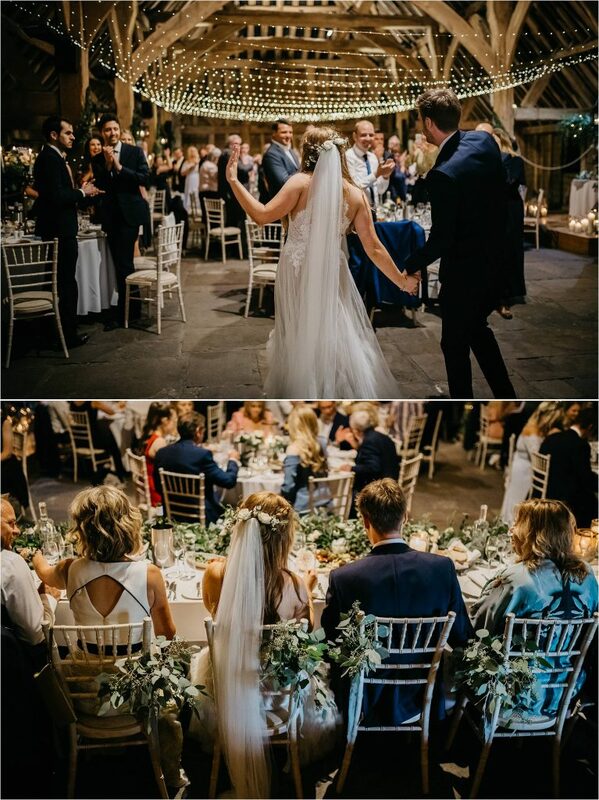 The top table is where all eyes are focused for a large part of the wedding breakfast to a long garland of lush foliage with flowers was a great choice. 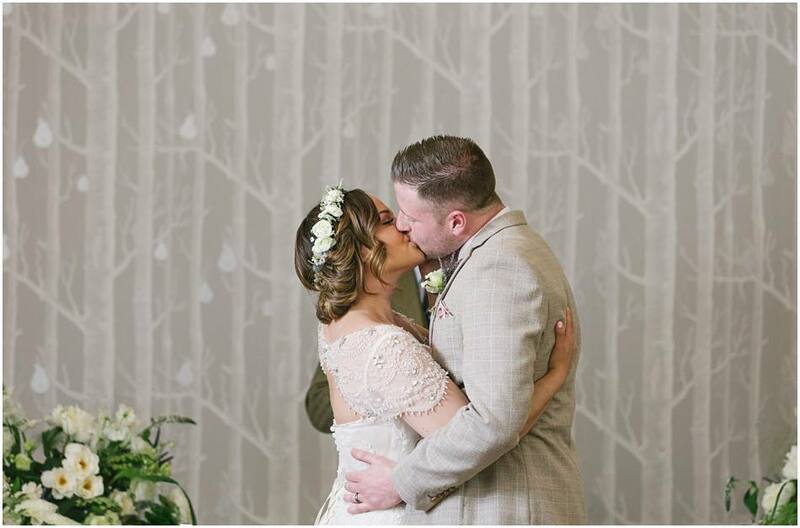 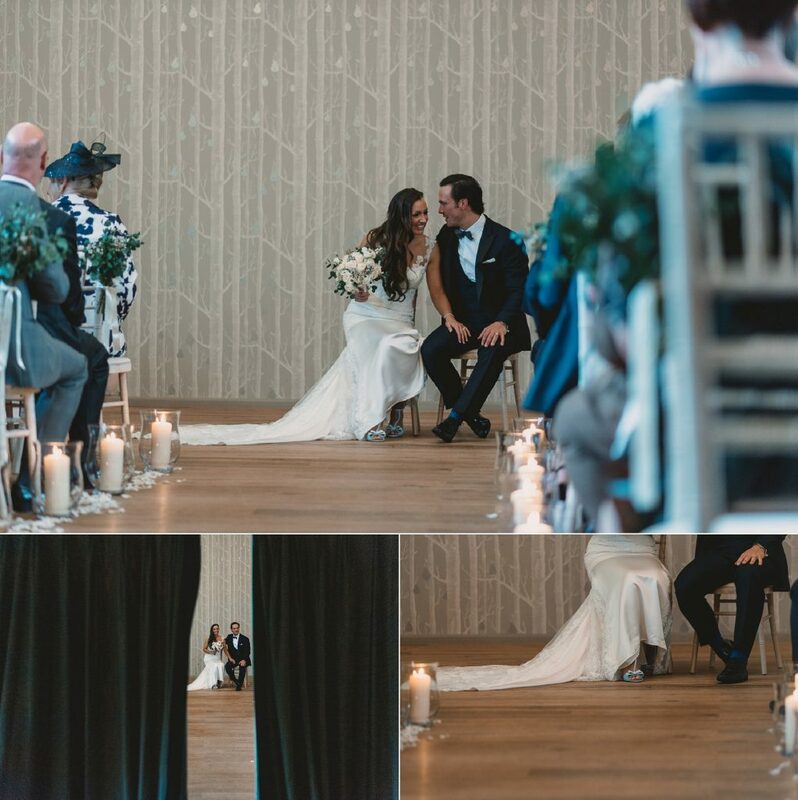 The backdrop was created especially for the couple with a romantic ring of flowers and Dani’s favourite sparkling lights and foliage added in. 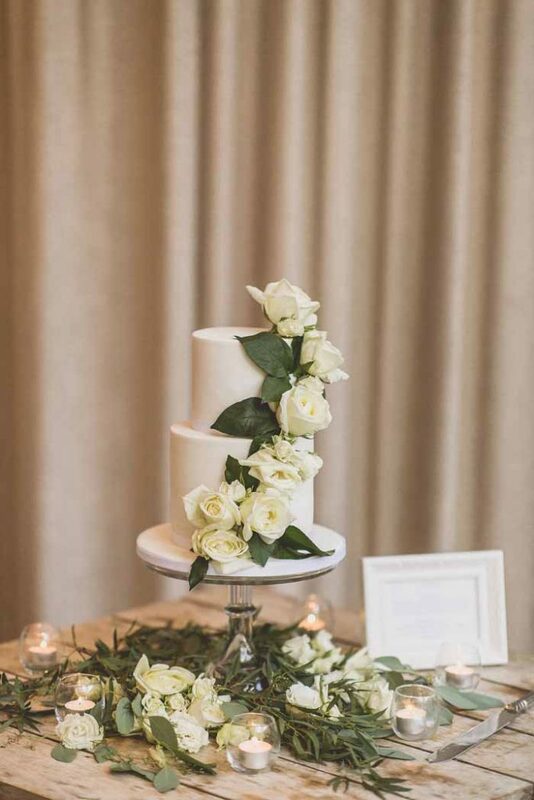 Ask your florist for vases for the bouquets so they can be added to the cake table display. 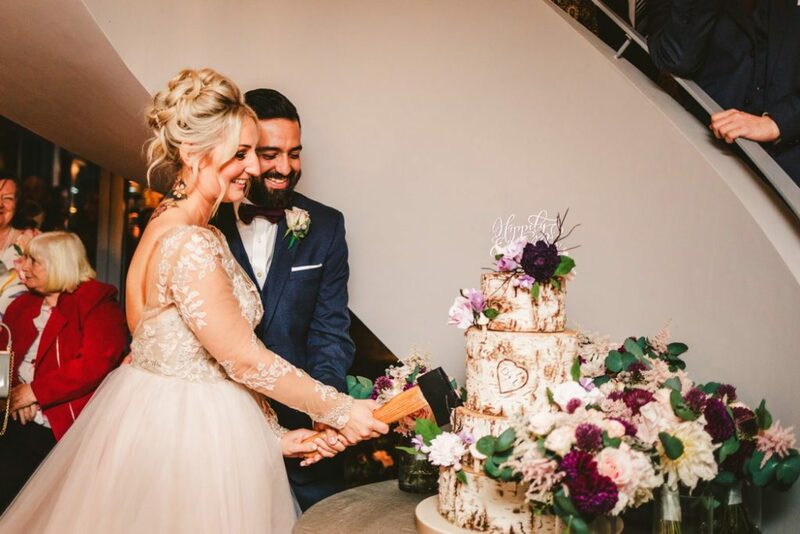 I love the axe for cutting the rustic cake. 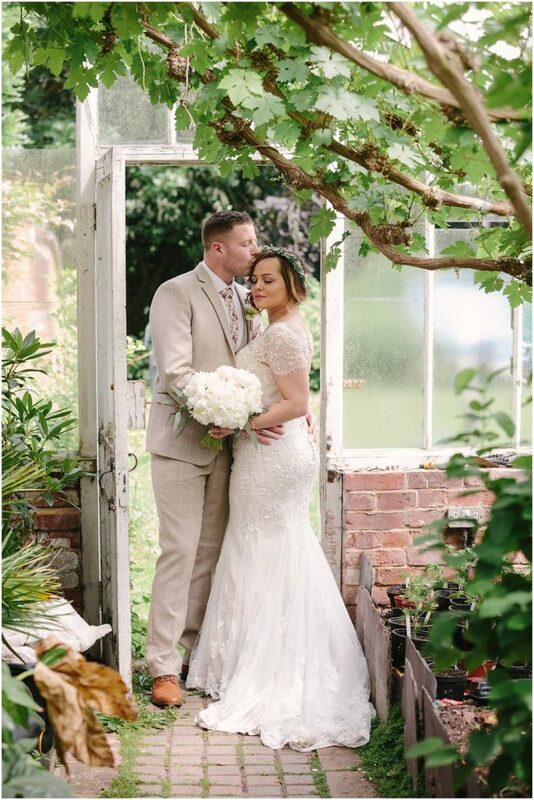 Danielle and Lorance, thank you for your lovely words. 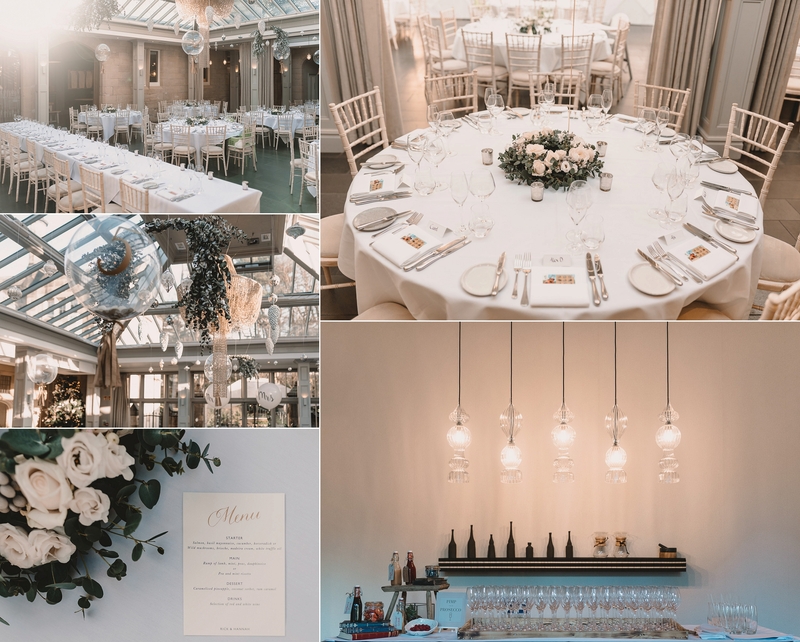 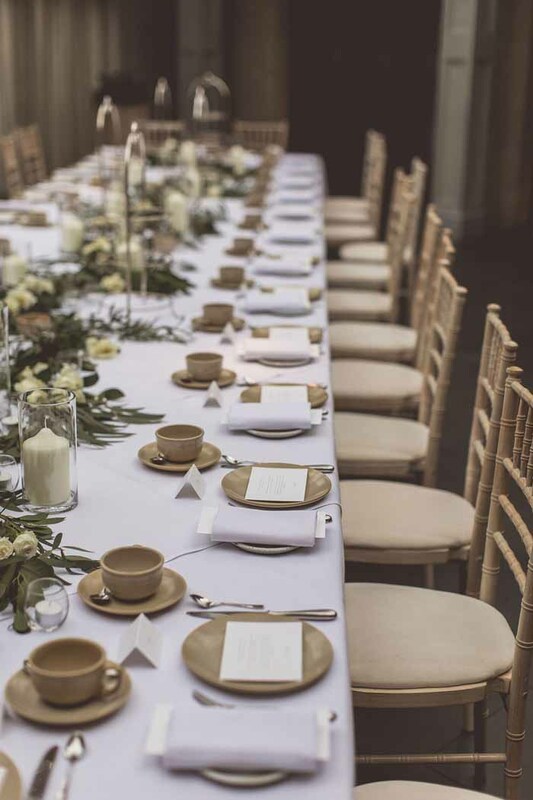 If you are looking for inspiration for your 2019 wedding please get in touch. 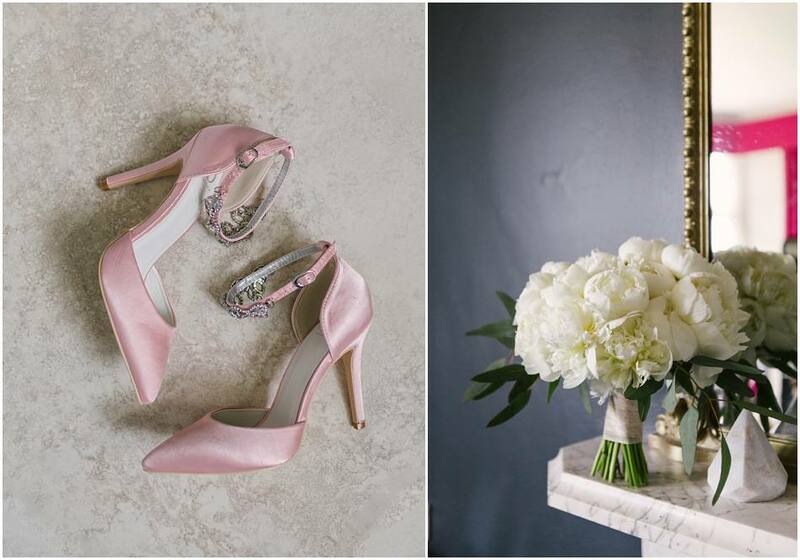 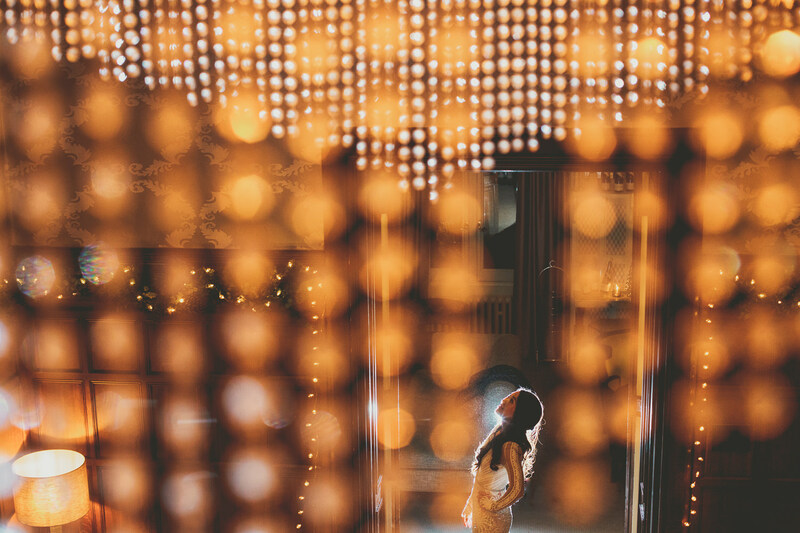 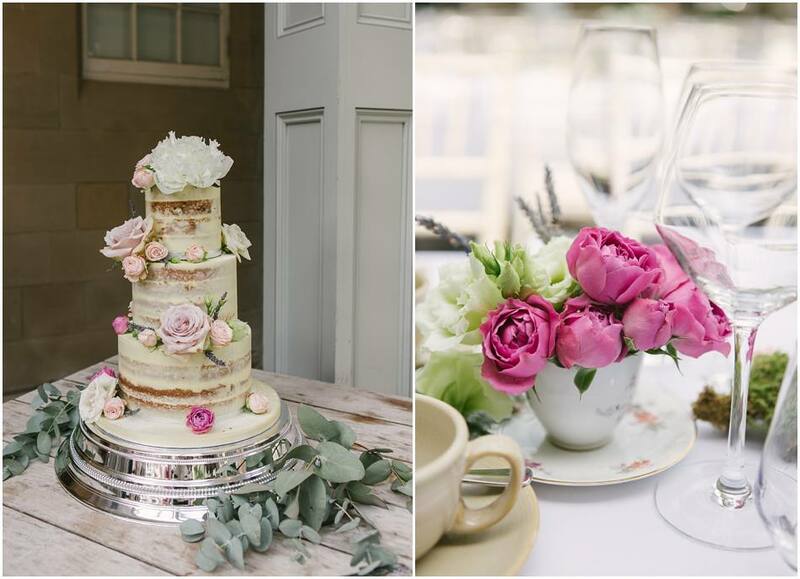 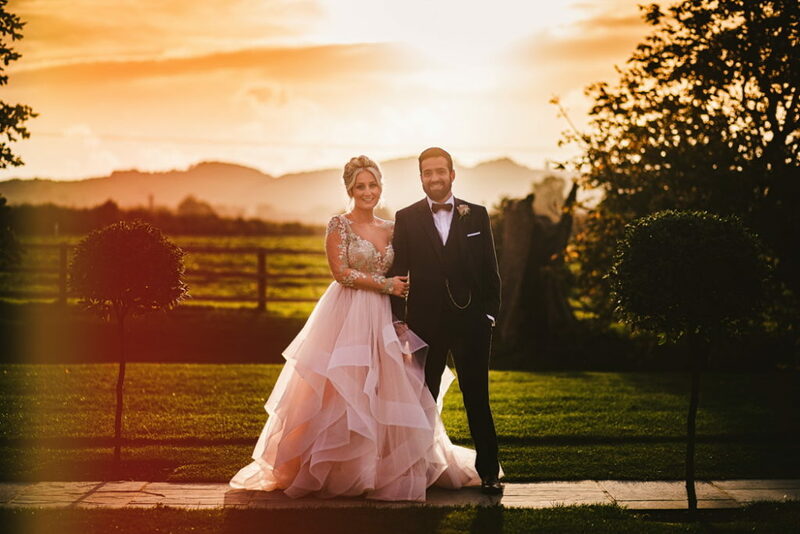 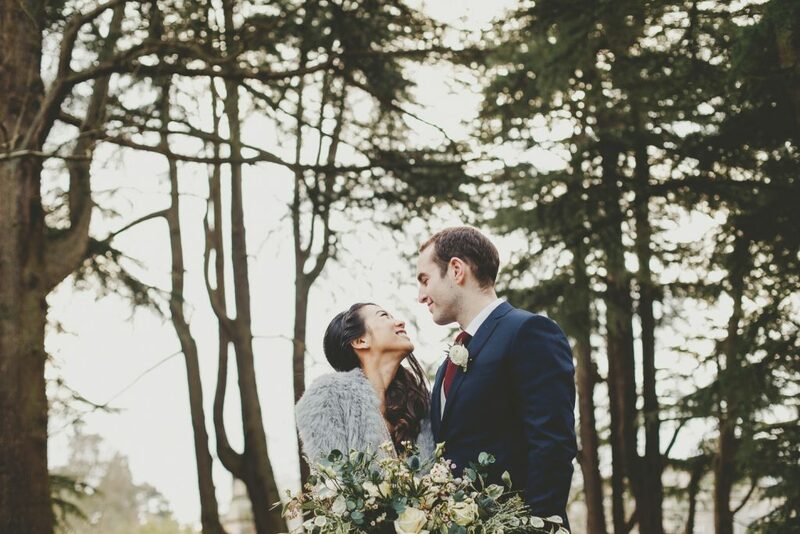 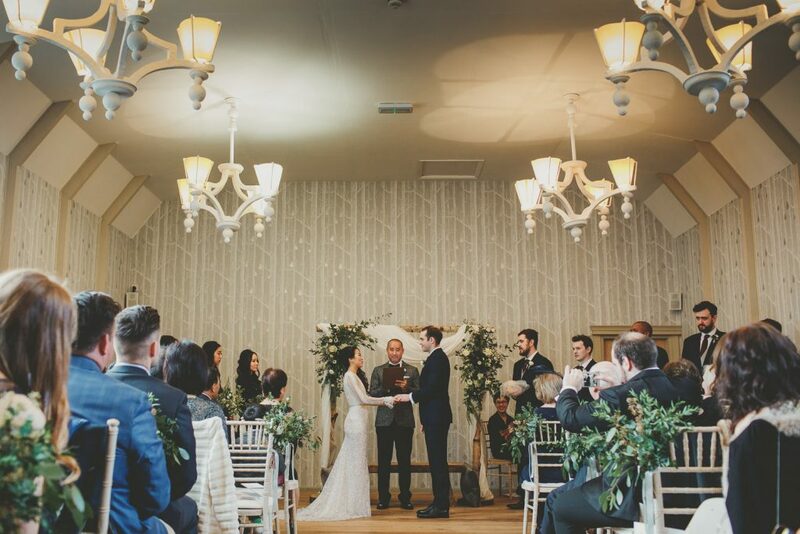 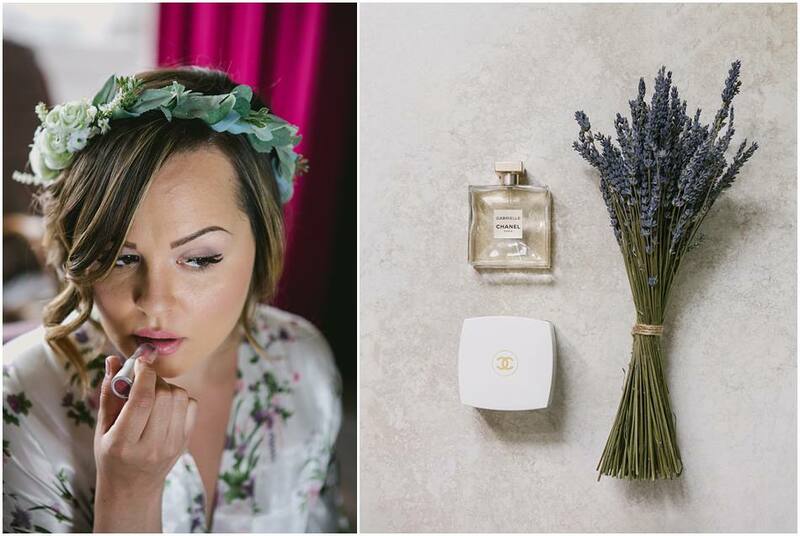 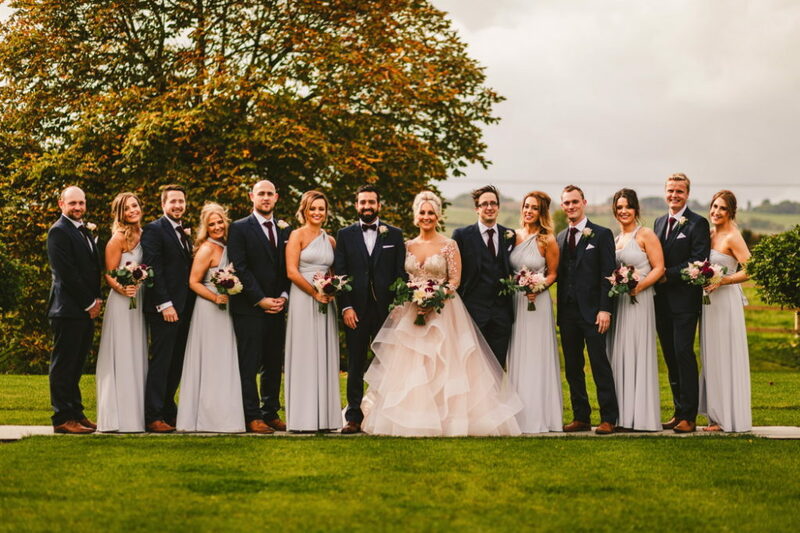 Niamh and Alex were a dream couple to work with throughout the build up to their wedding. 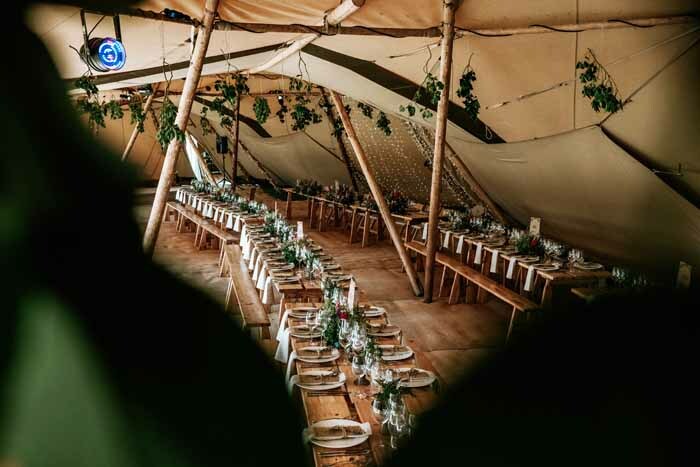 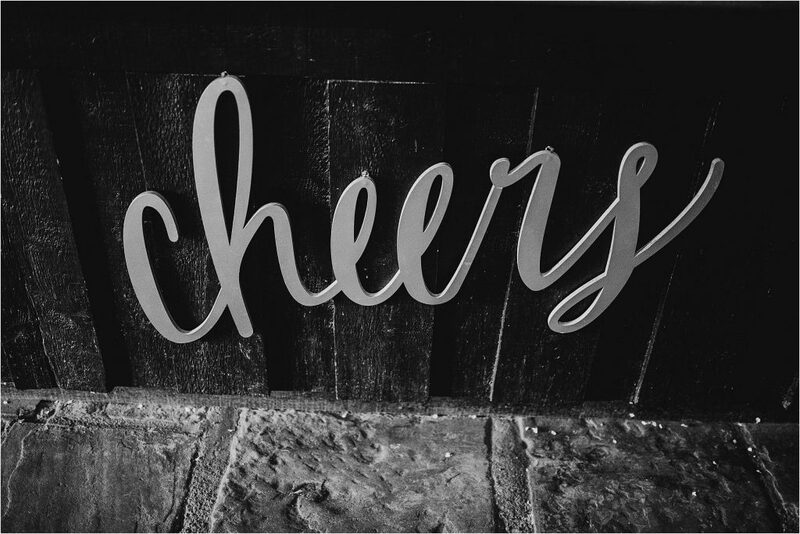 They booked Oldberrow House in Warwickshire for a tipi wedding reception and laid back festival style celebration with family and friends. 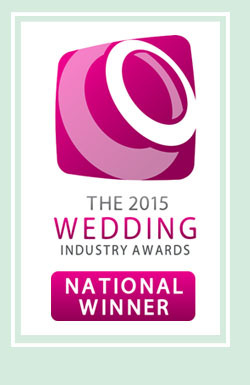 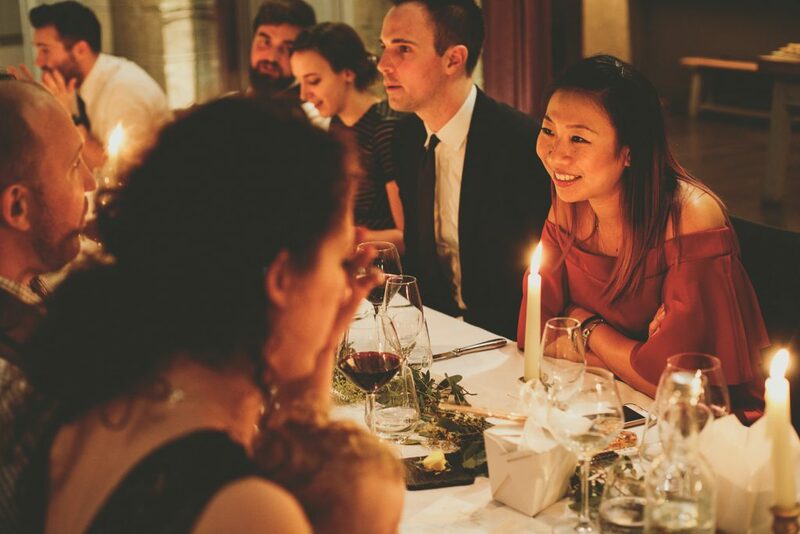 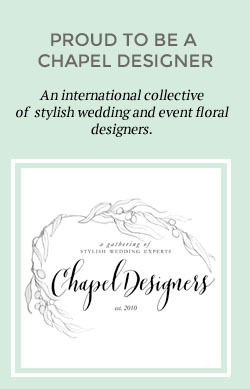 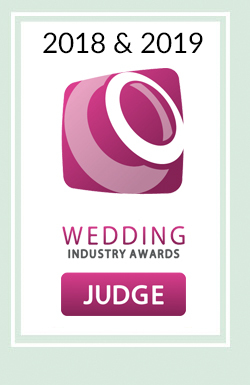 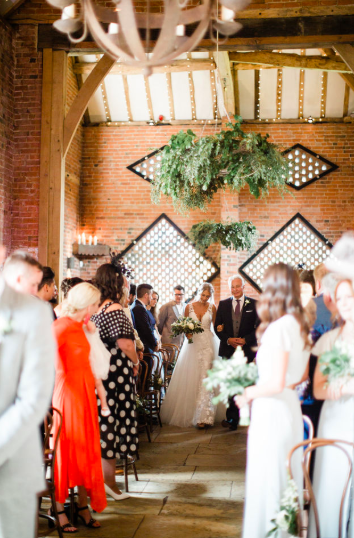 We knew we were in for a treat with their list of hand picked suppliers. 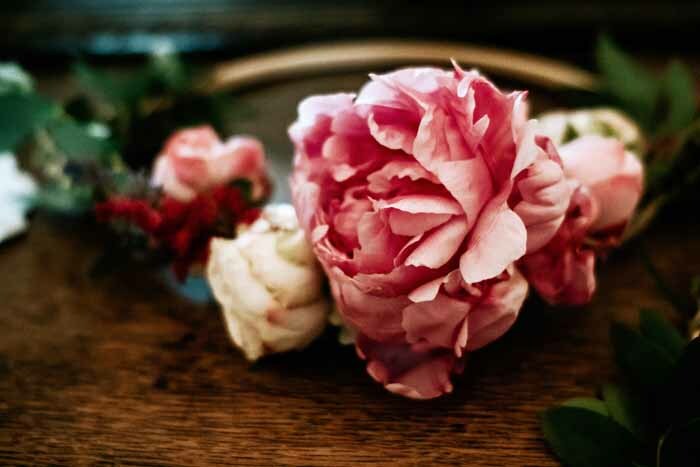 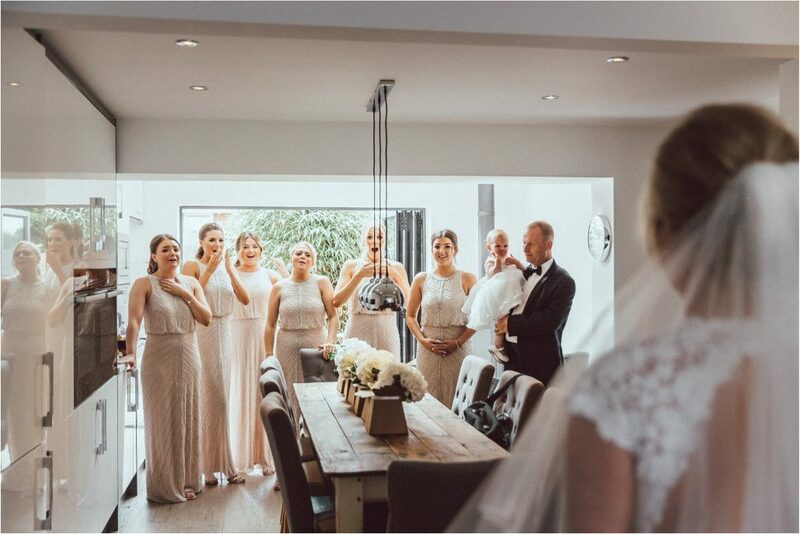 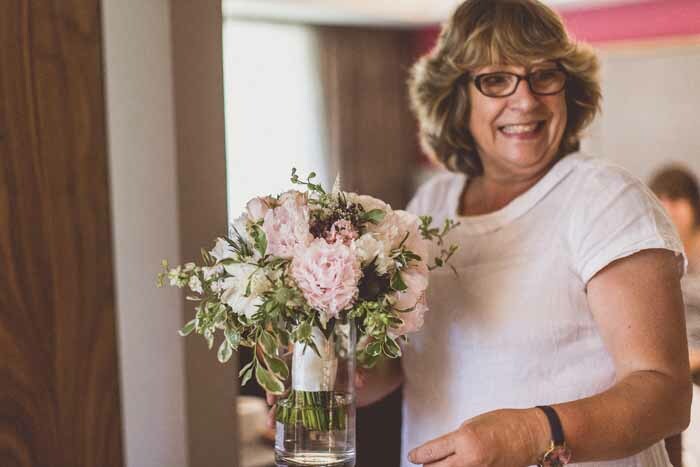 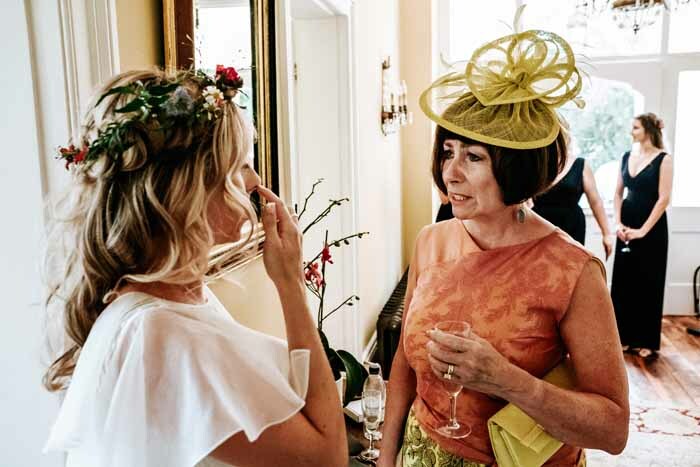 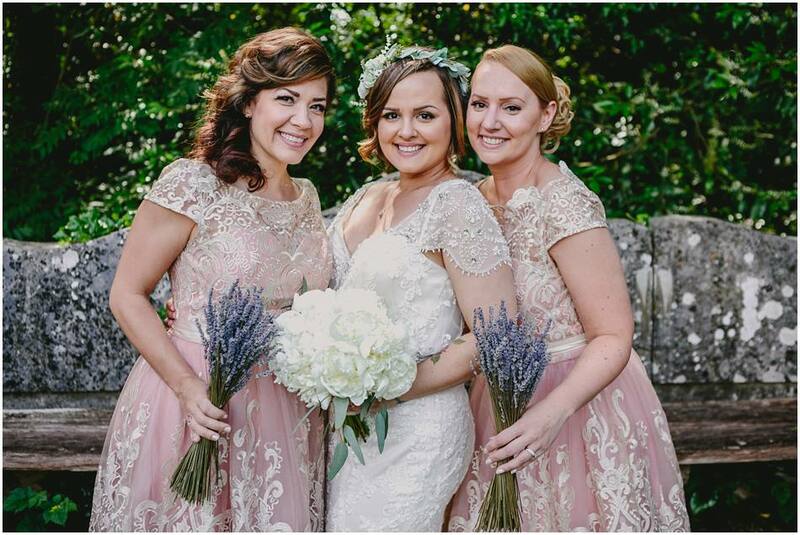 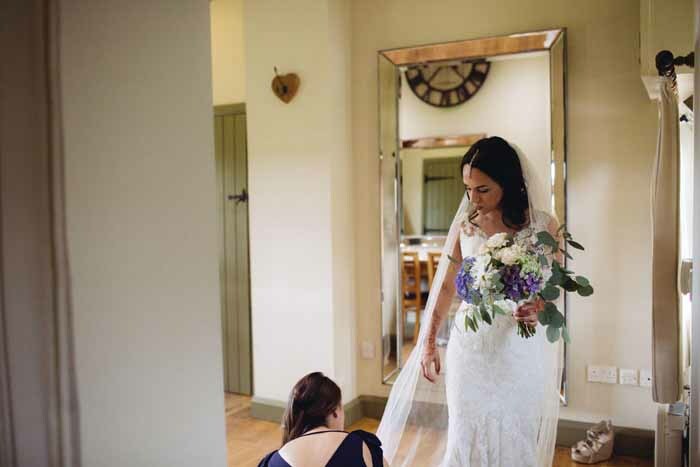 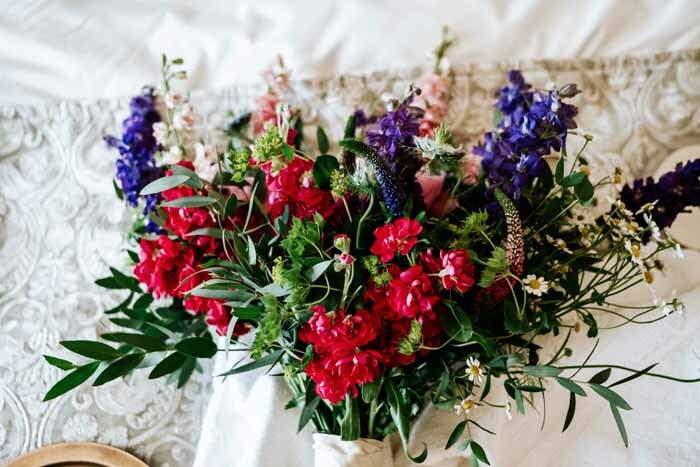 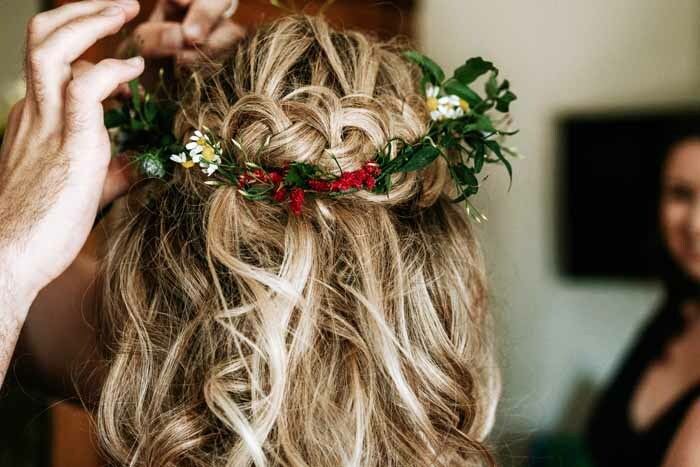 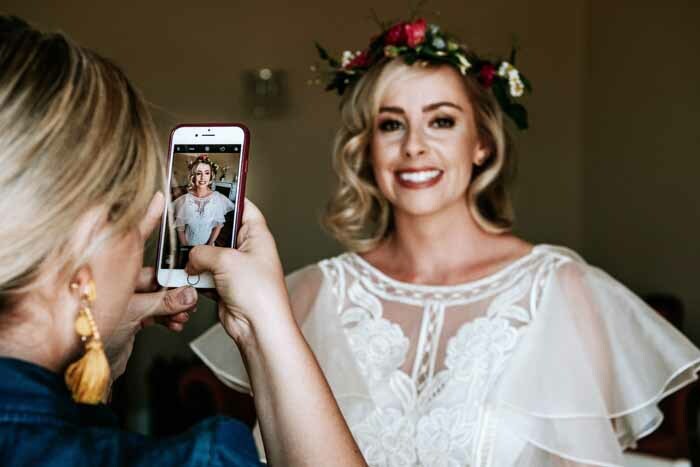 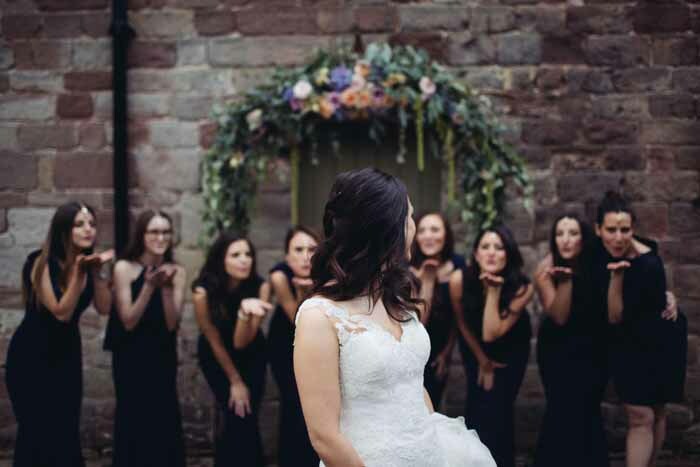 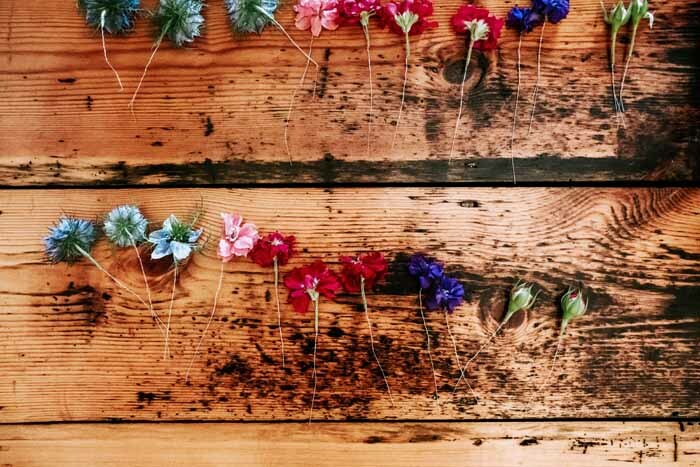 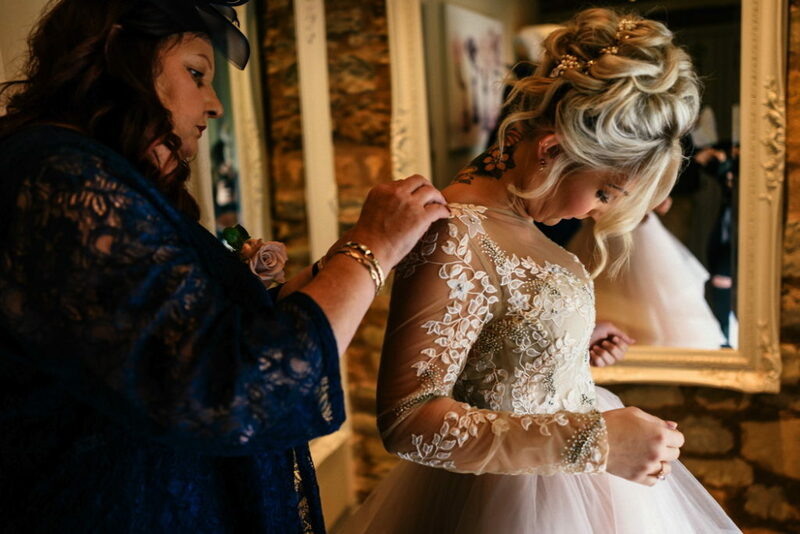 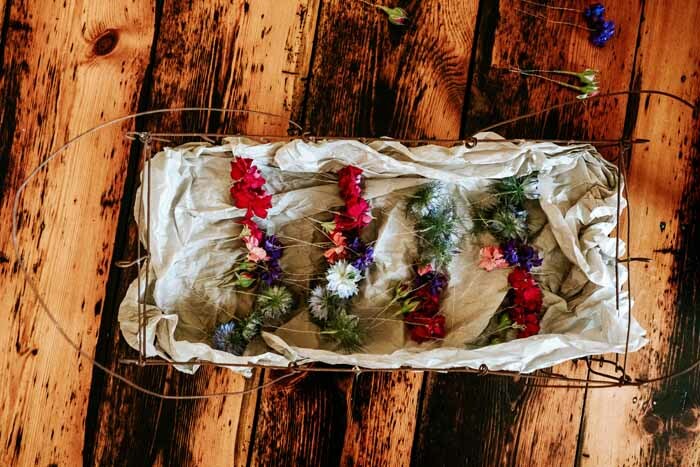 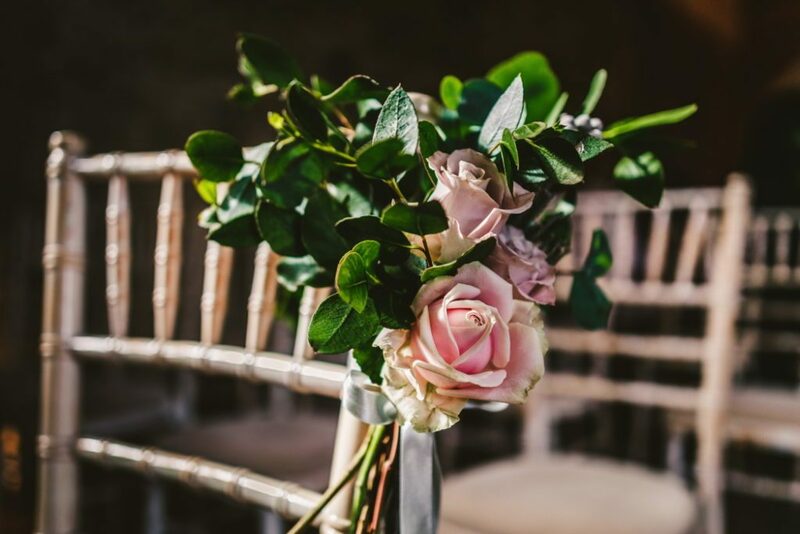 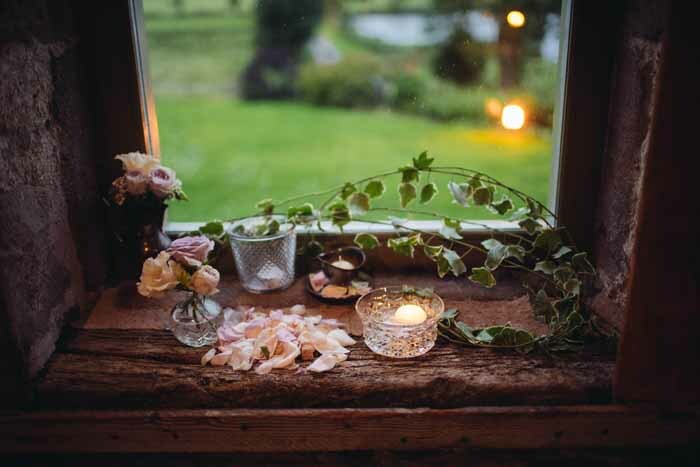 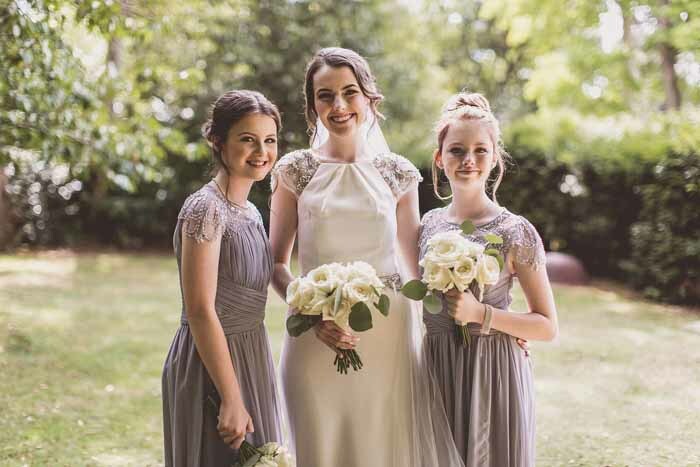 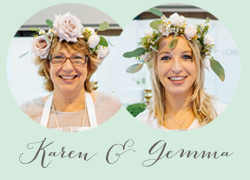 Old Berrow House was a wonderful place for the bridal party preparations Niamh and the girls had a relaxed morning and we love delivering their hair flowers delicate bridal flower crown and button holes over in the morning. 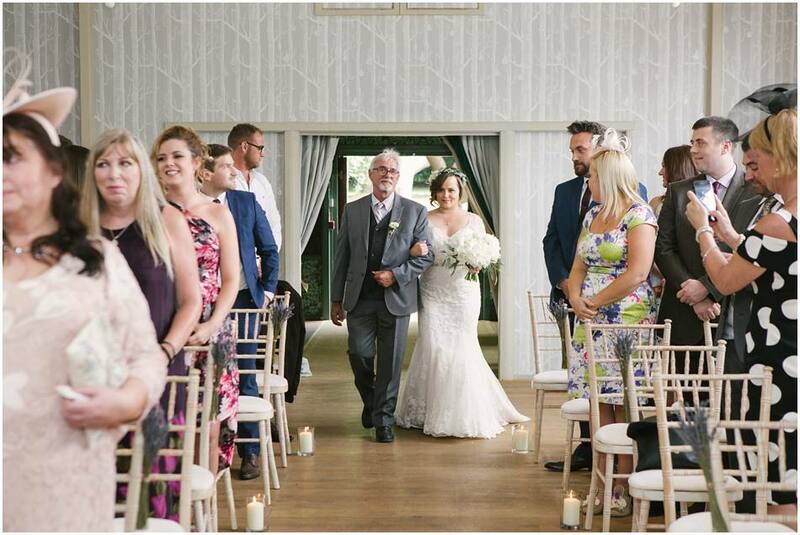 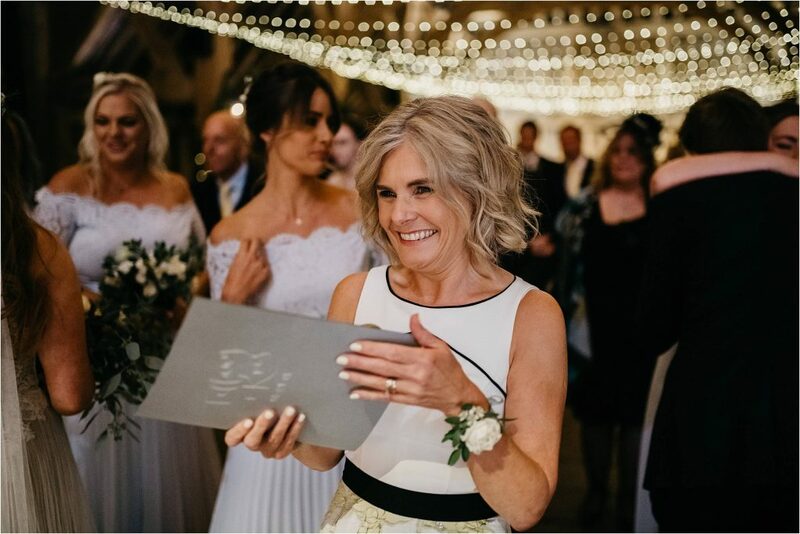 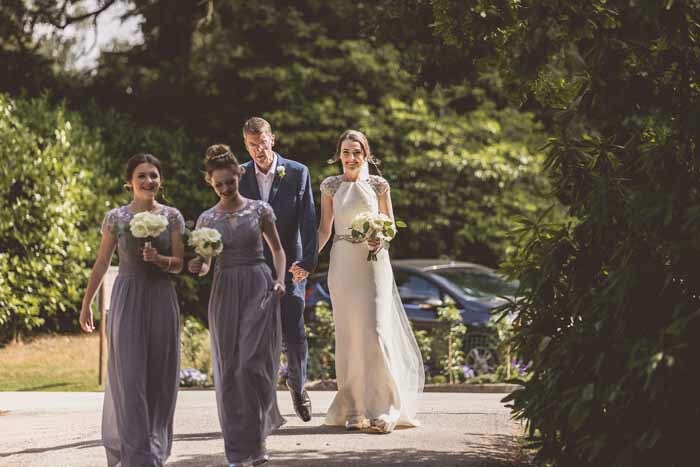 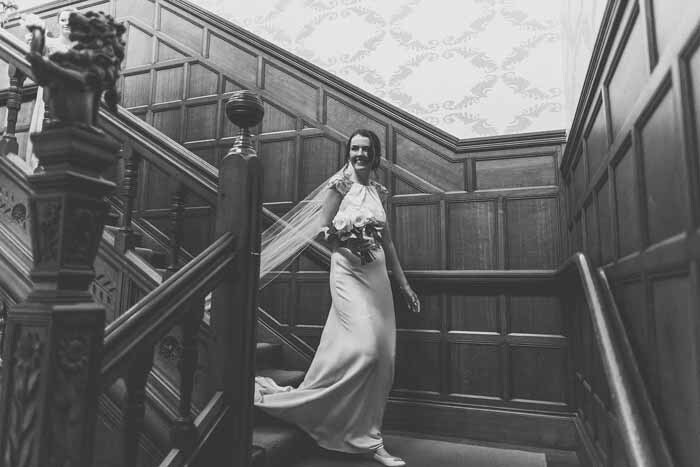 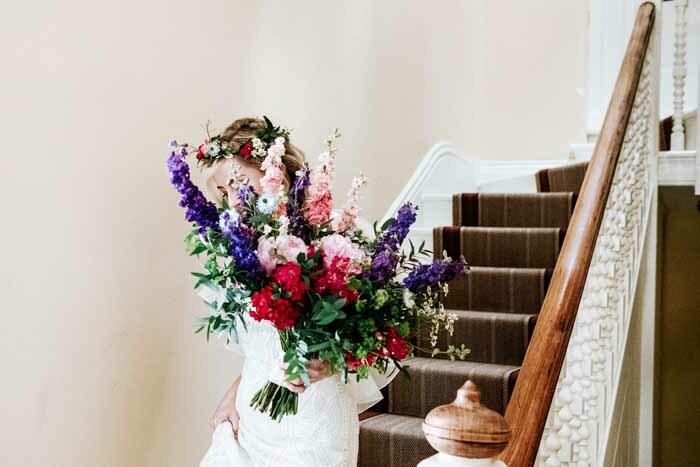 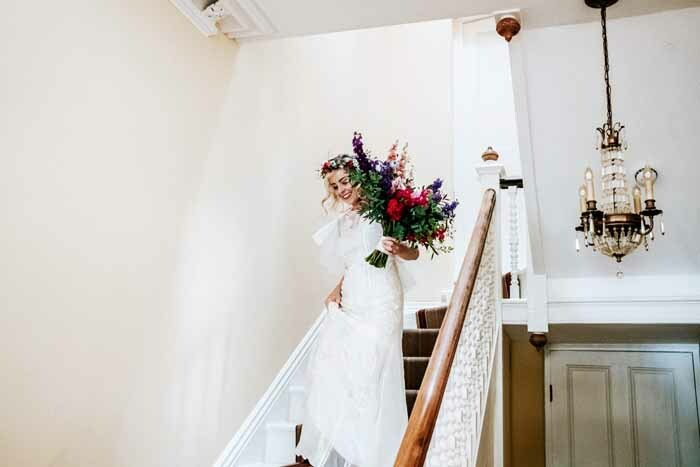 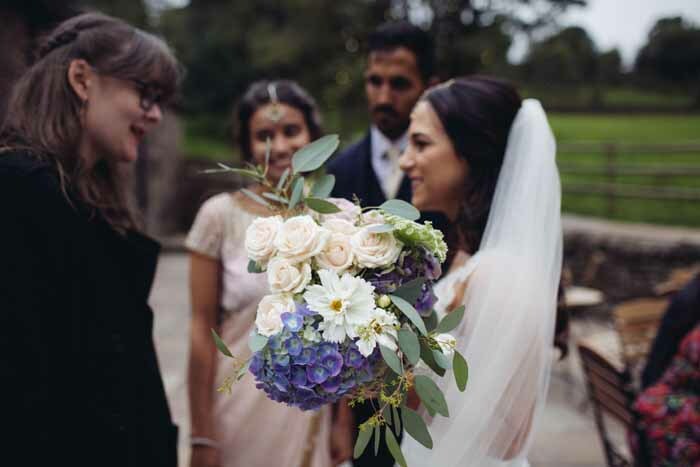 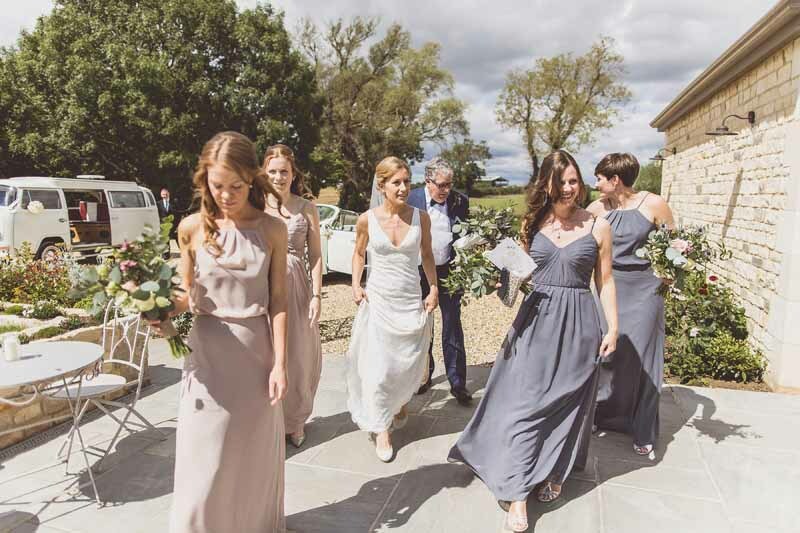 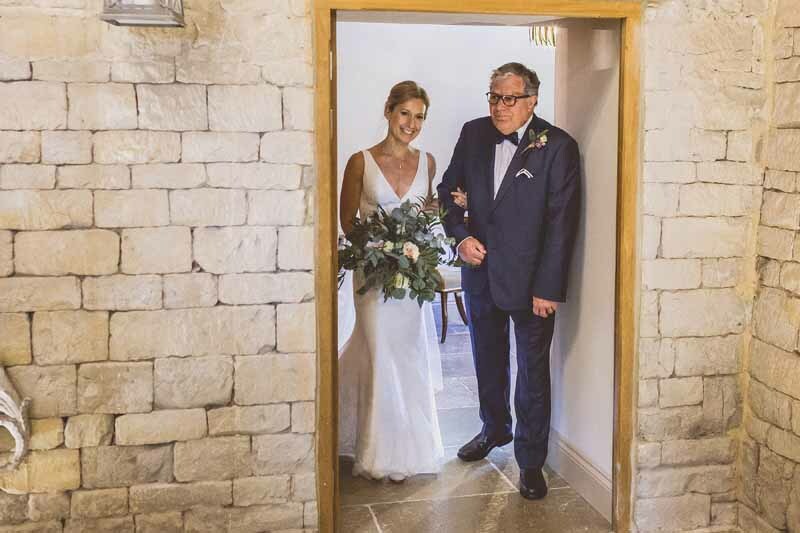 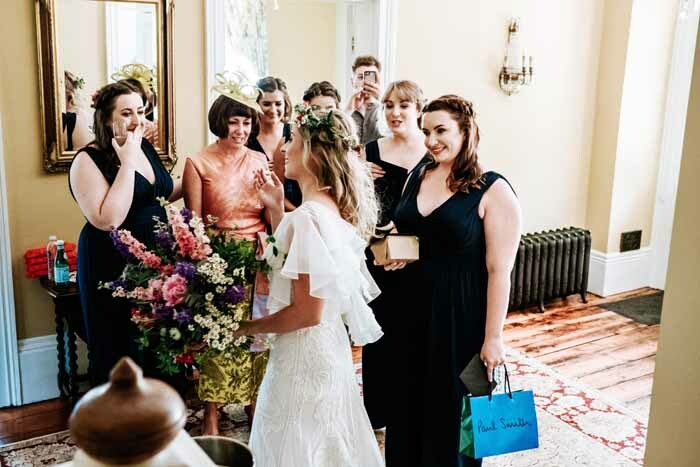 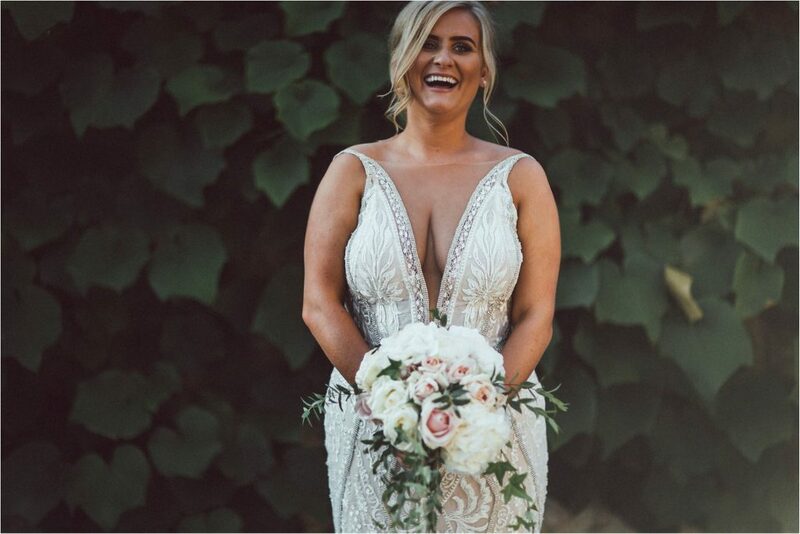 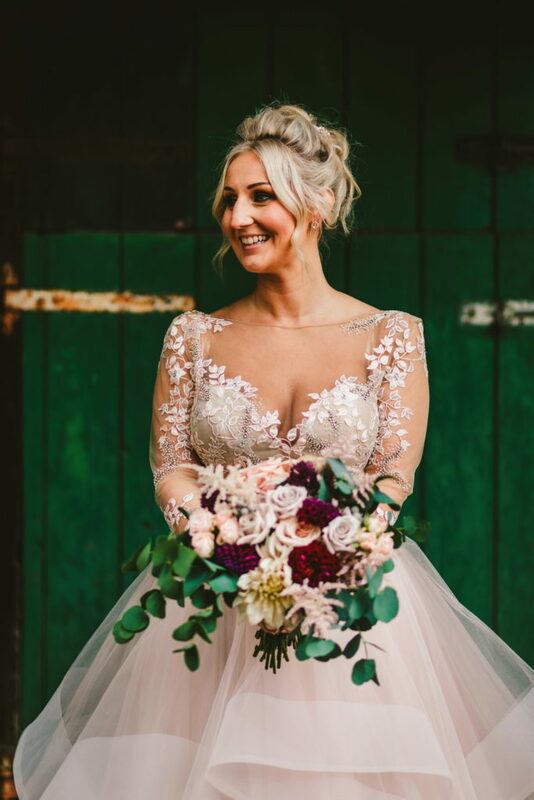 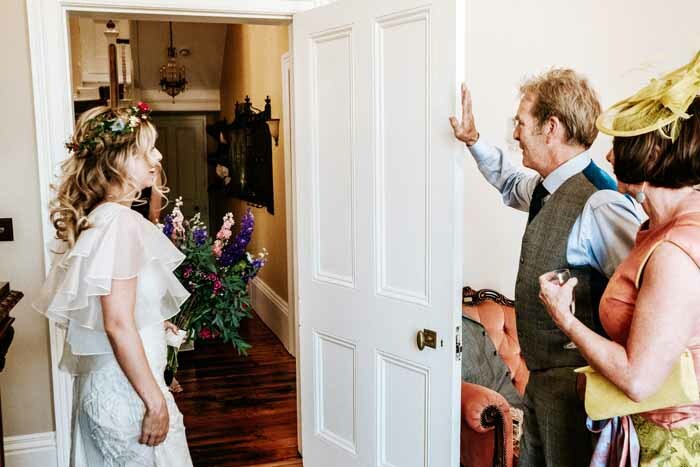 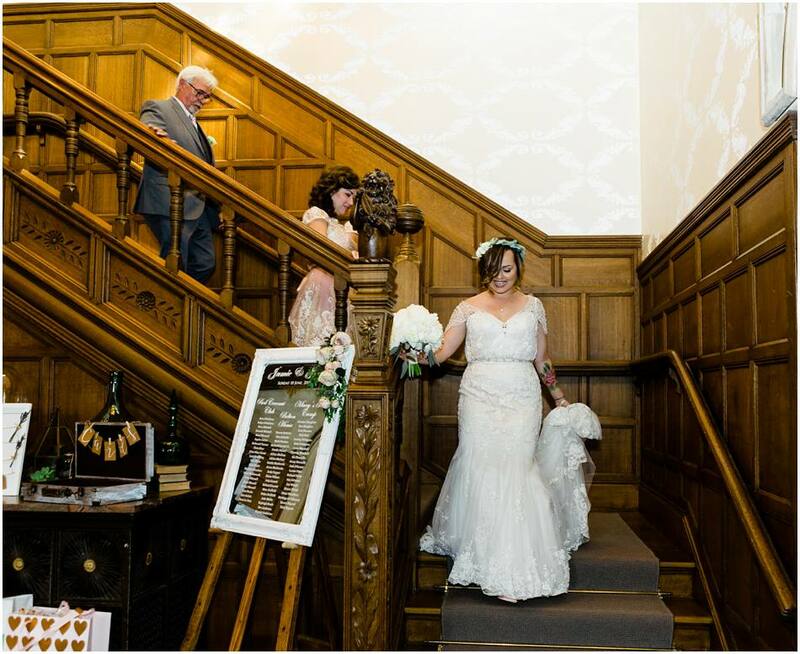 It is pure joy to see happiness and this image of Niamh walking down the stairs with her bouquet to be met by her mum and bridesmaids is so heart warming. 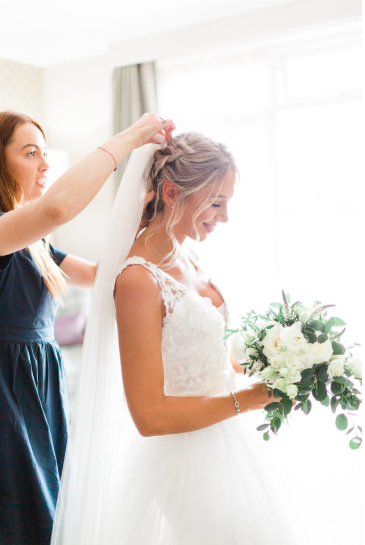 A delicate flower crown for a boho bride, I just love this image of Byrony capturing Niamh, captured by Ed Brown. 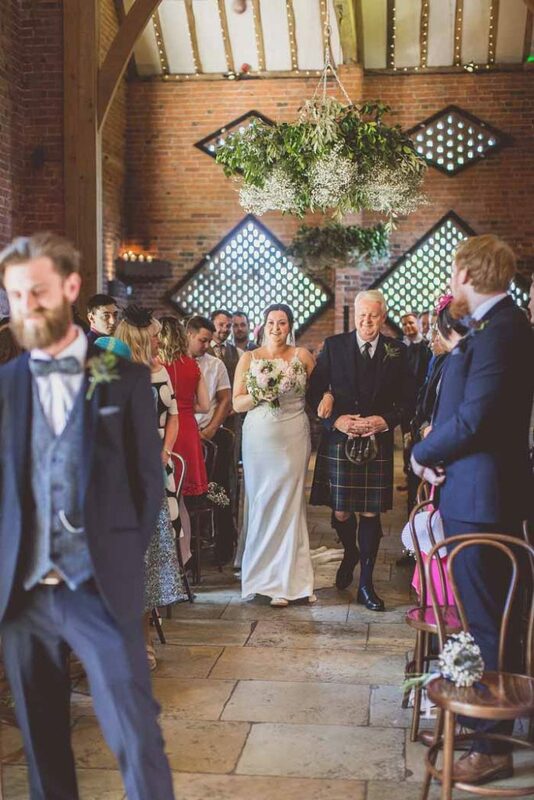 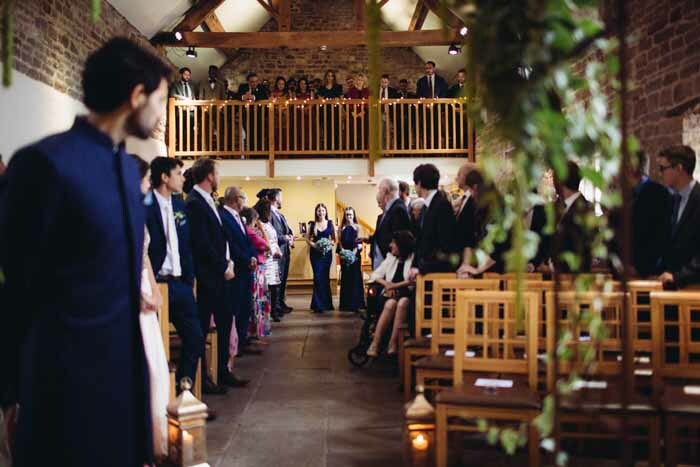 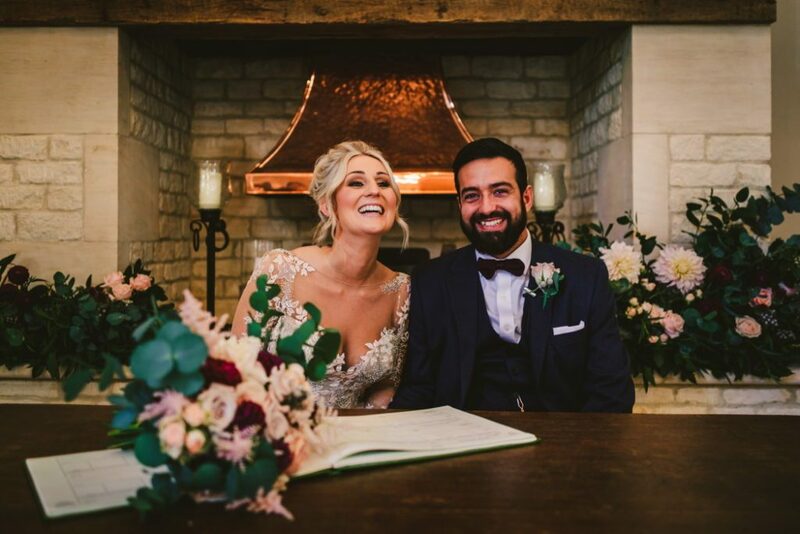 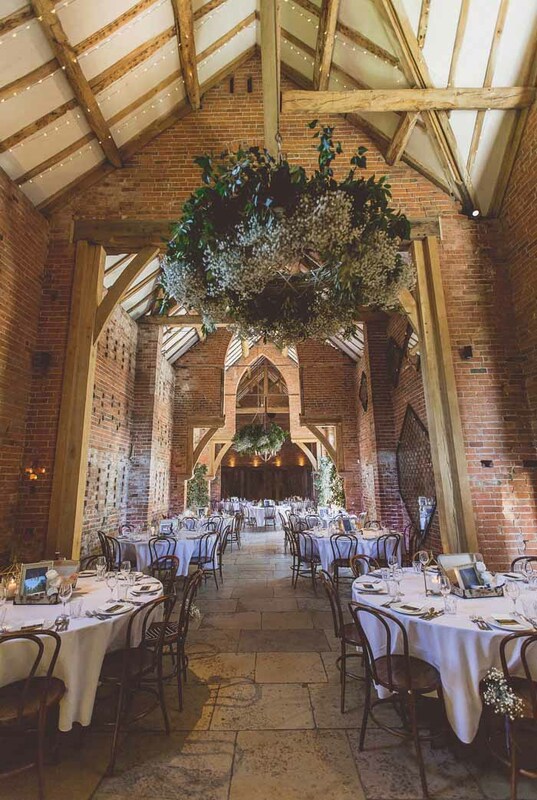 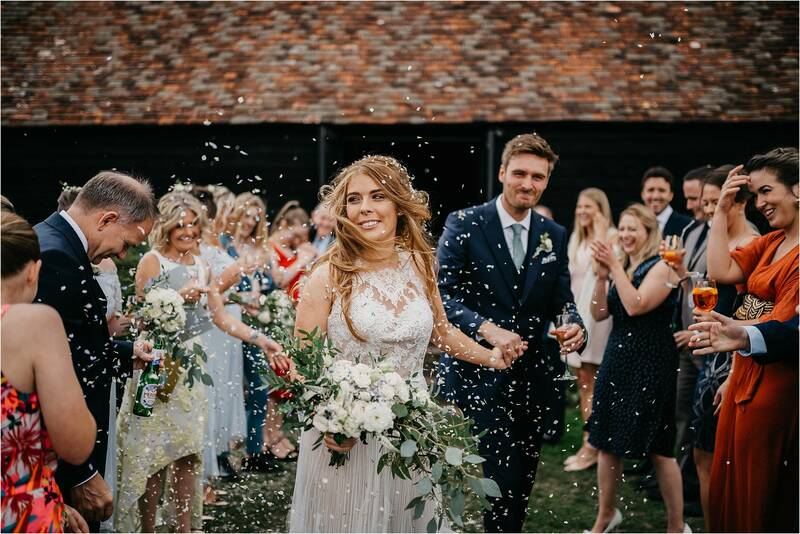 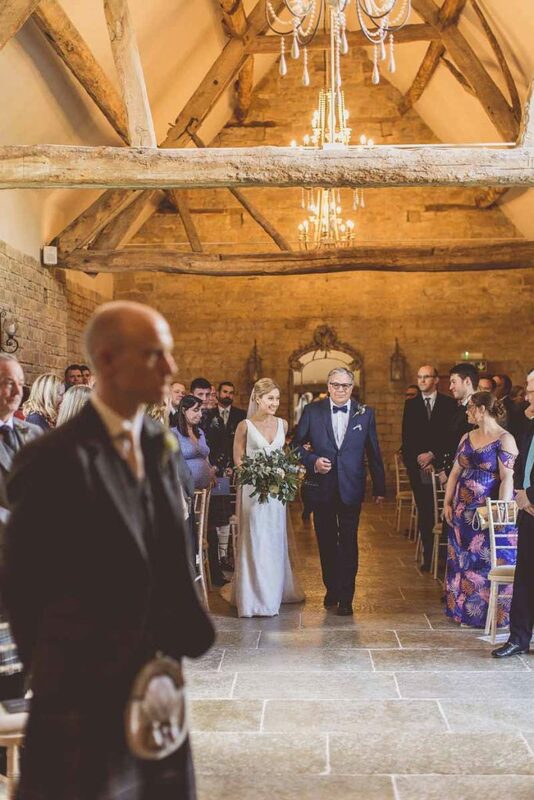 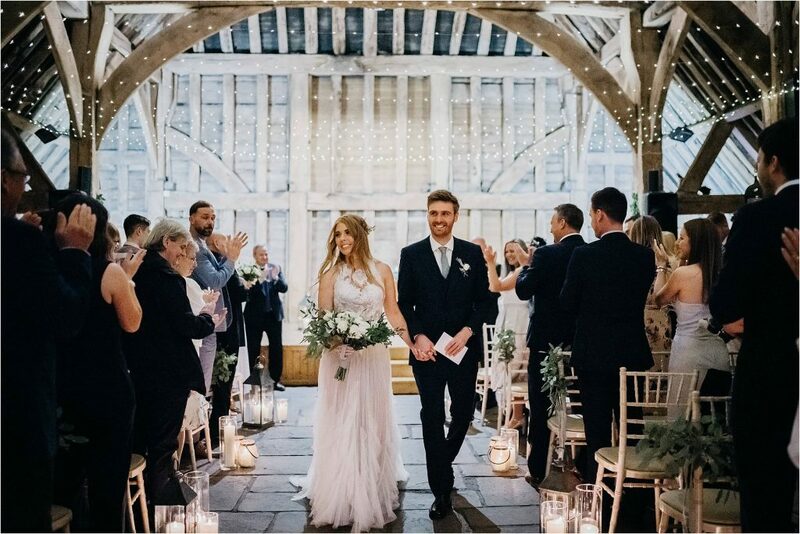 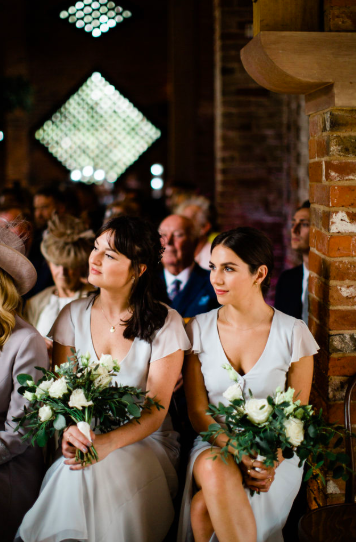 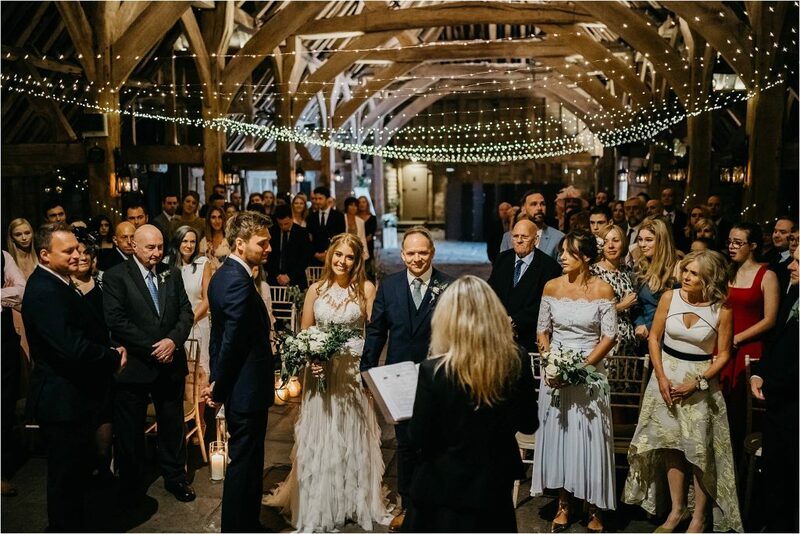 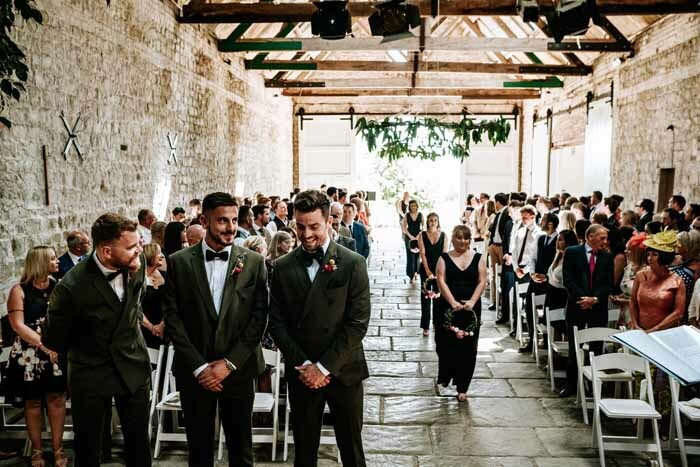 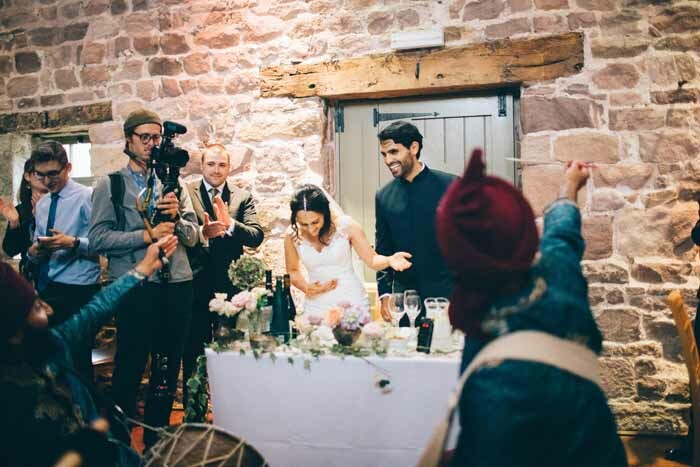 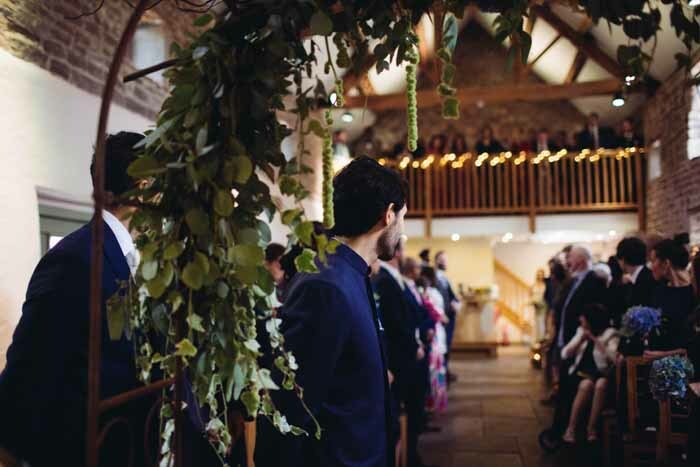 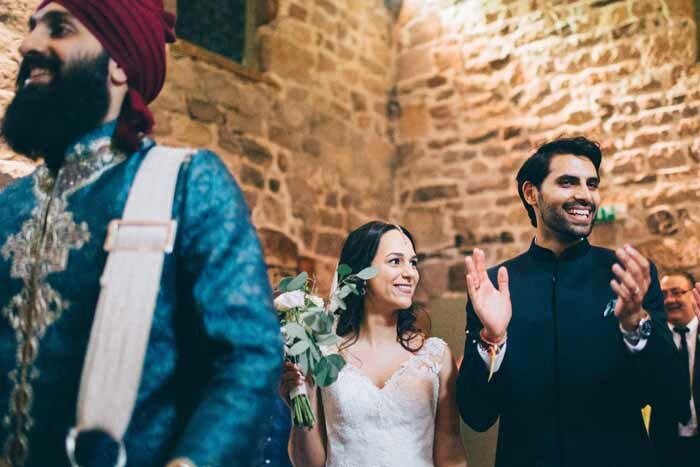 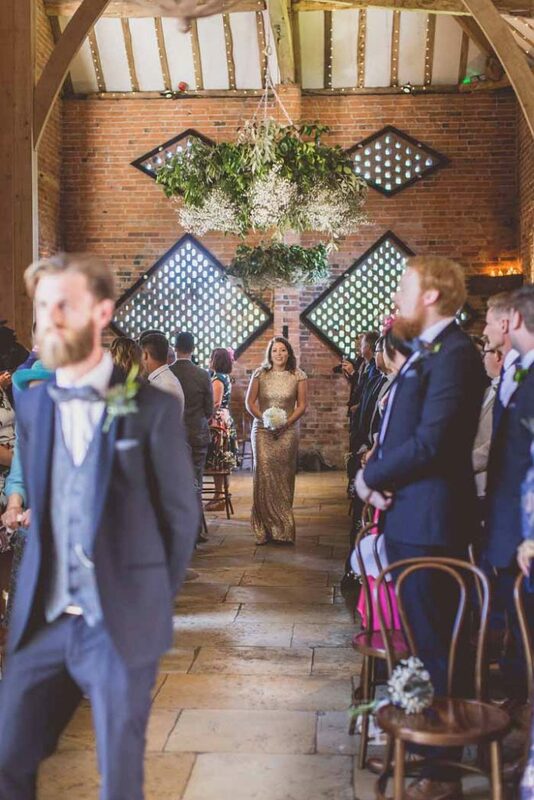 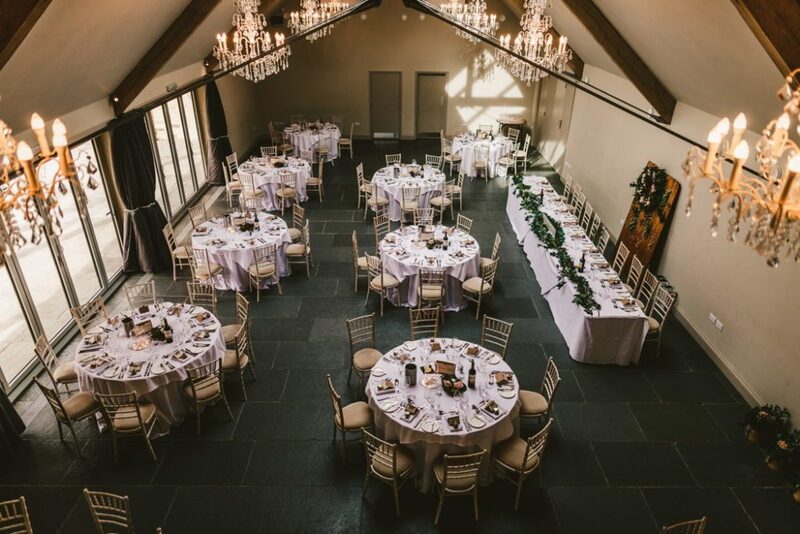 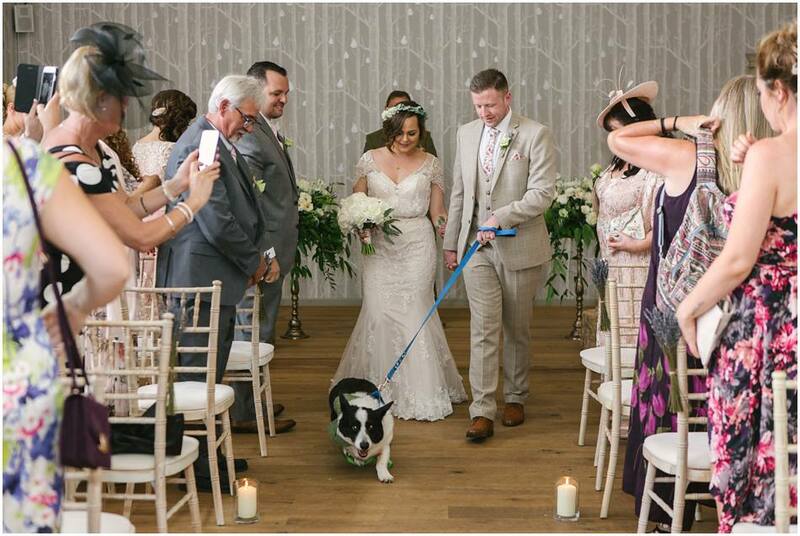 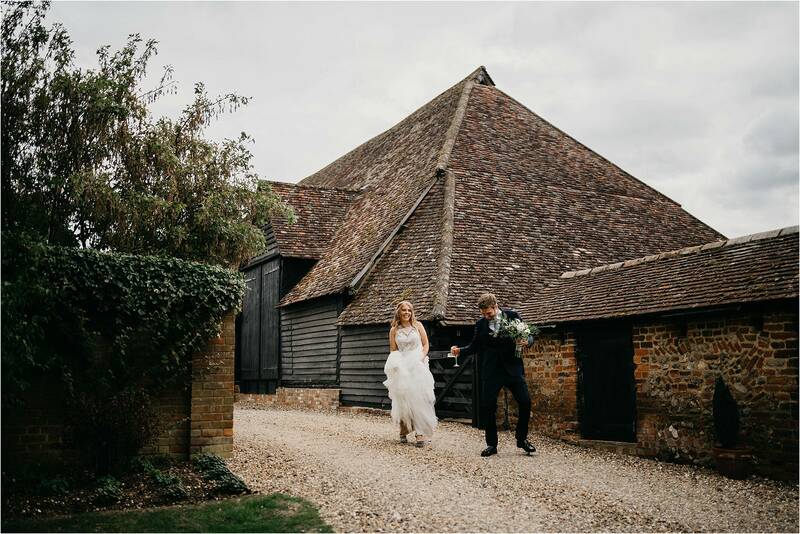 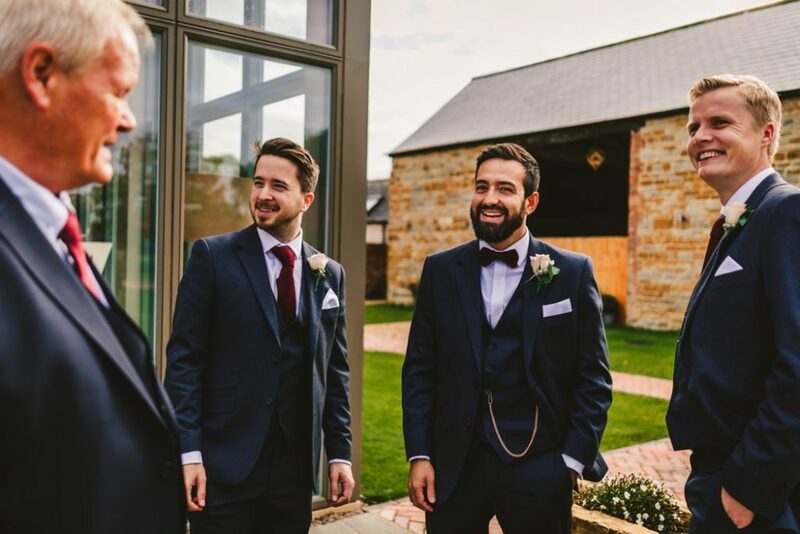 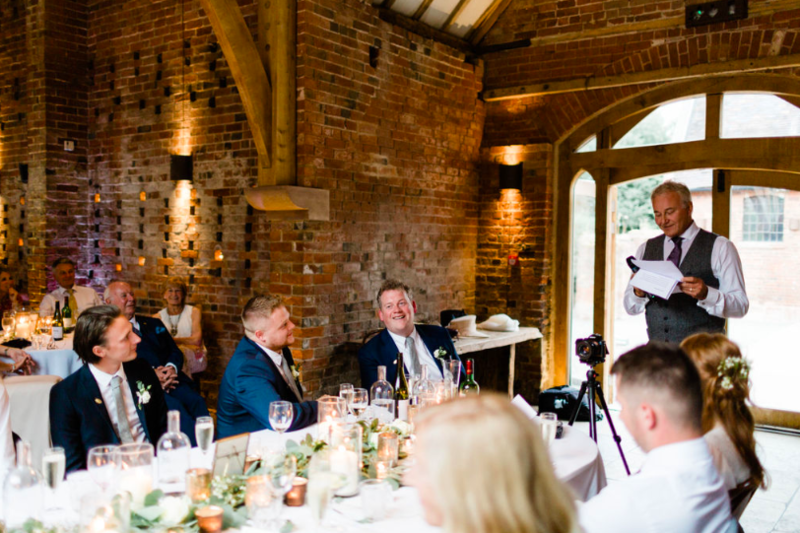 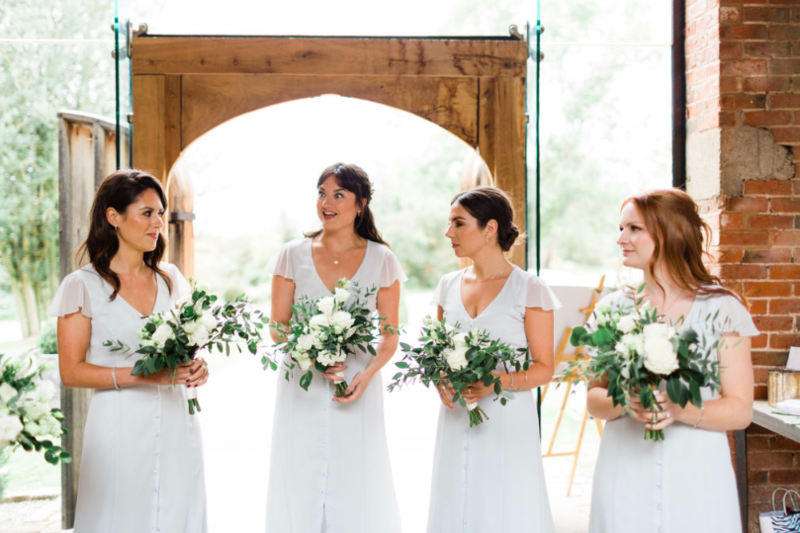 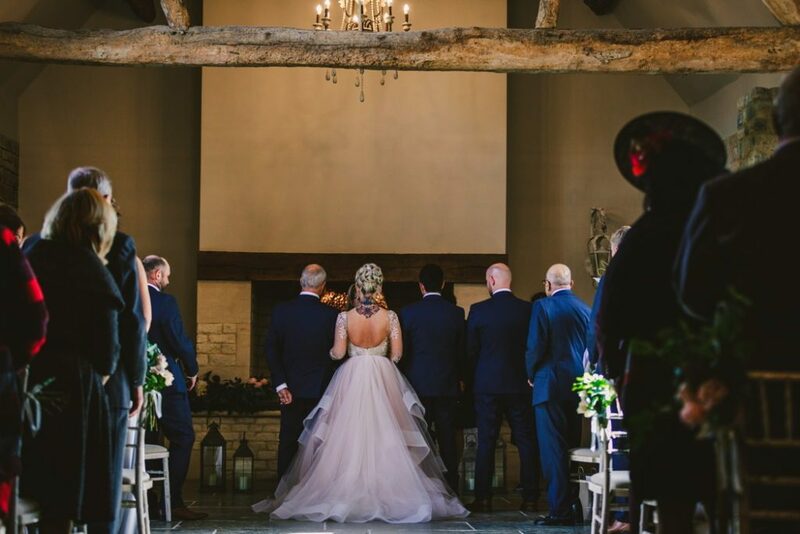 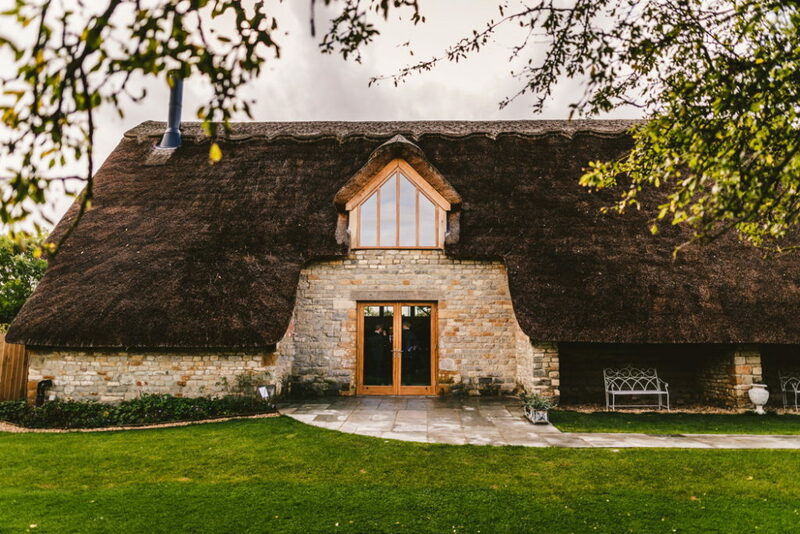 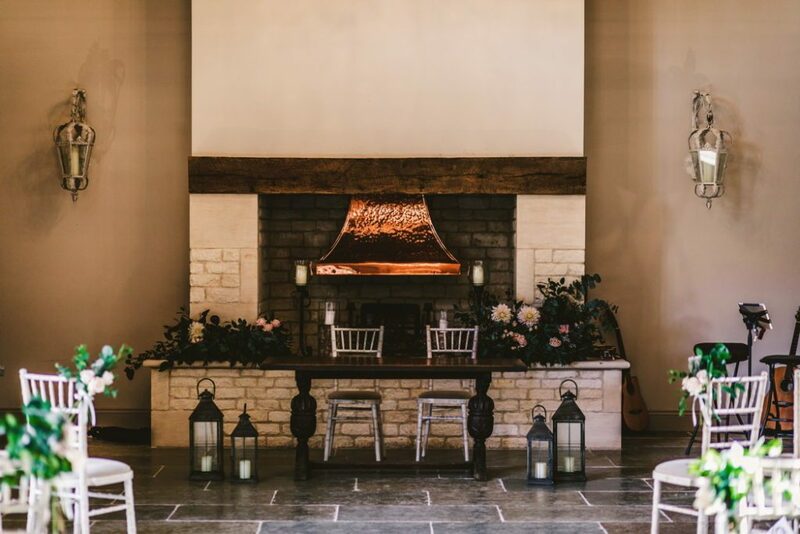 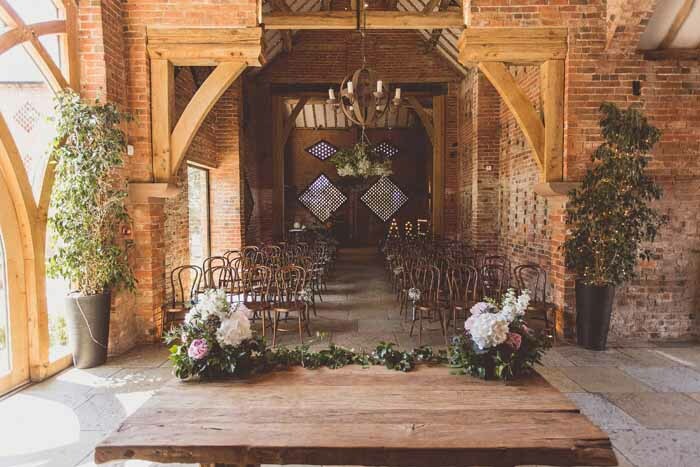 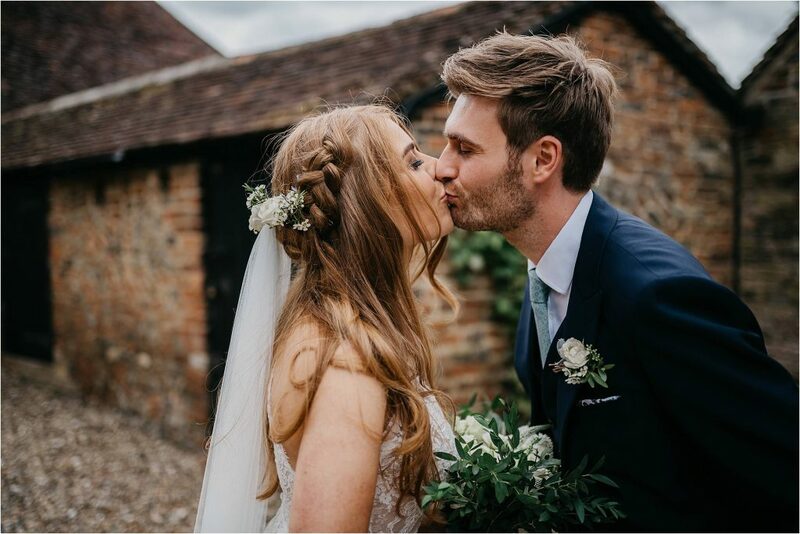 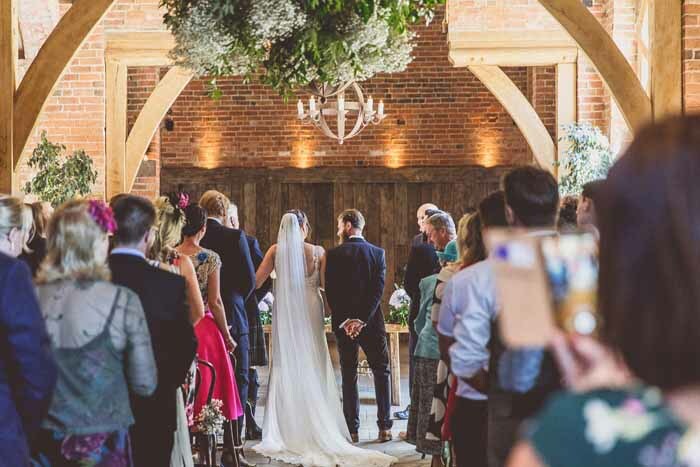 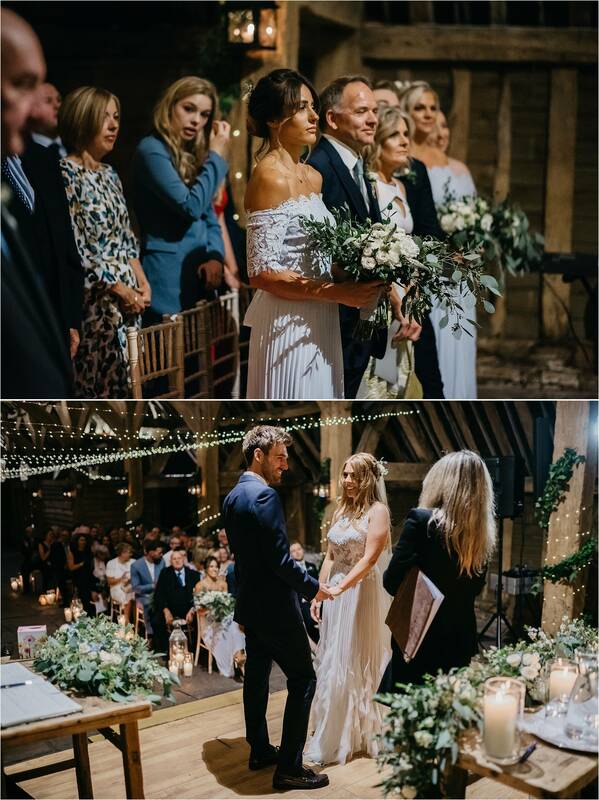 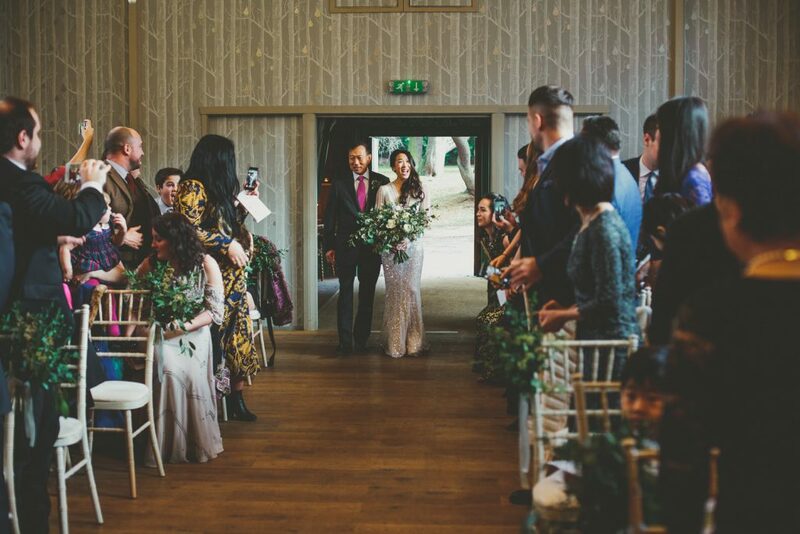 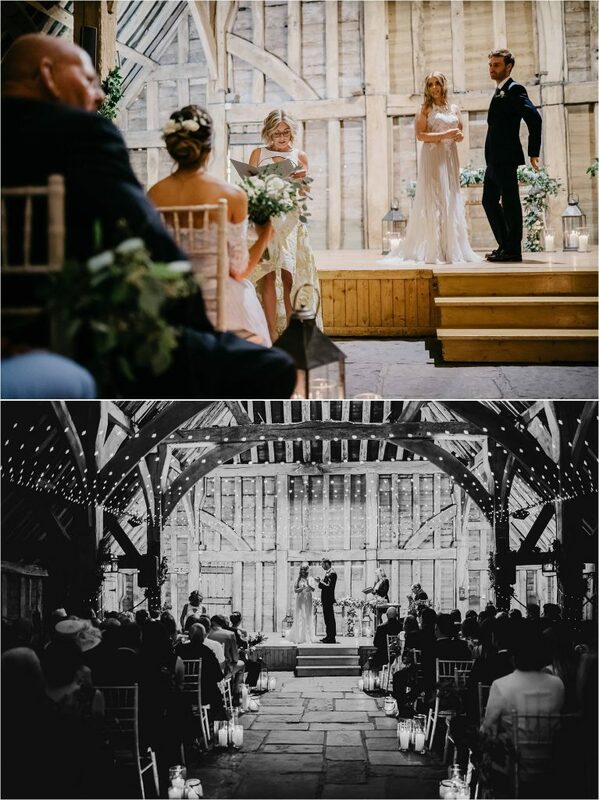 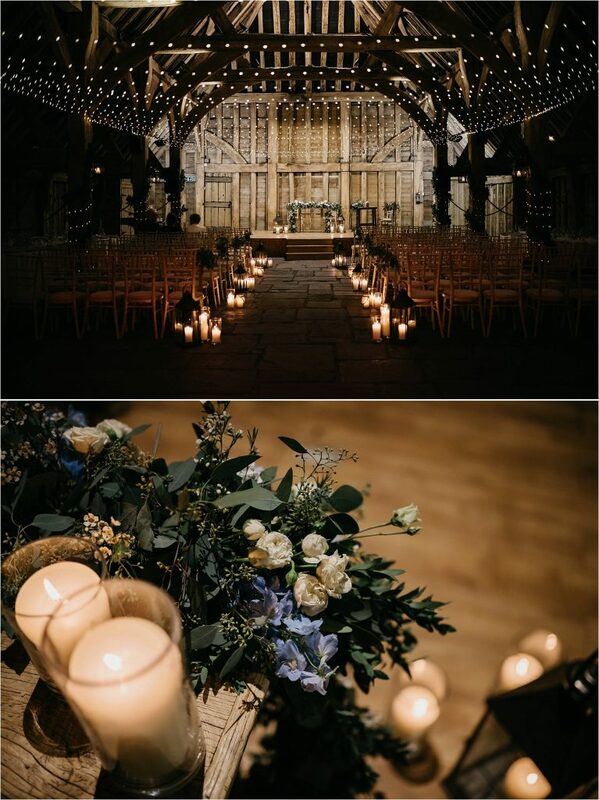 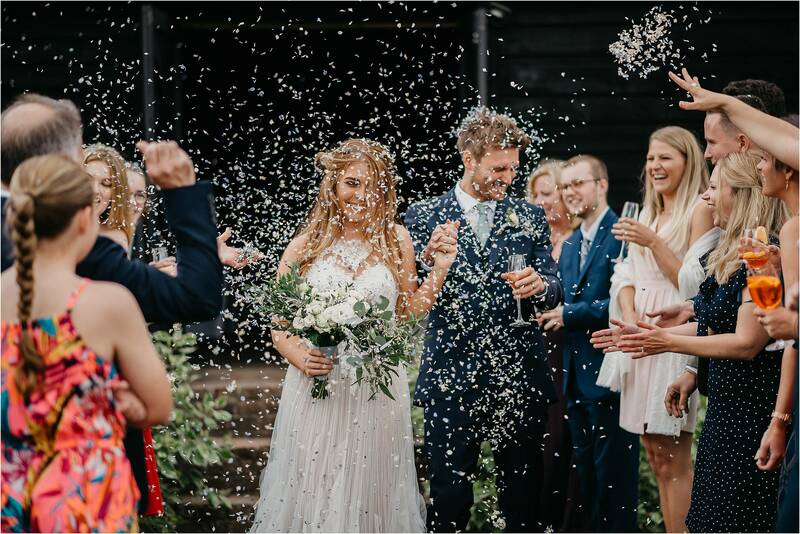 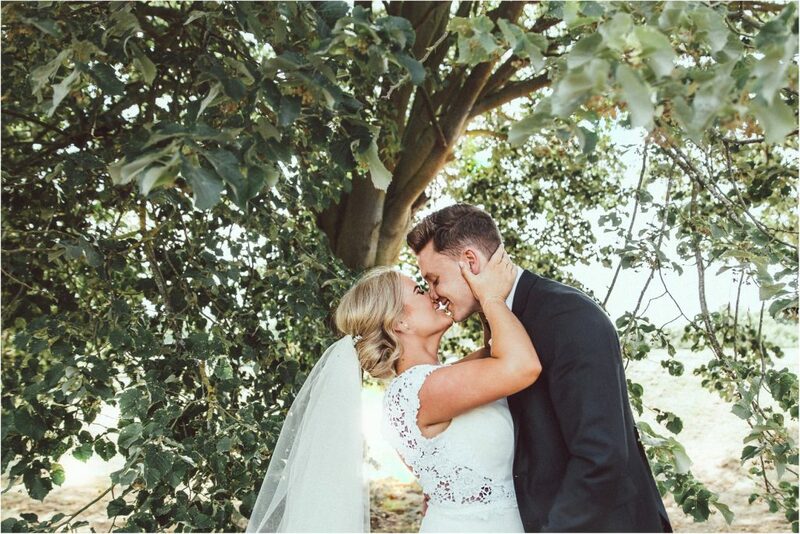 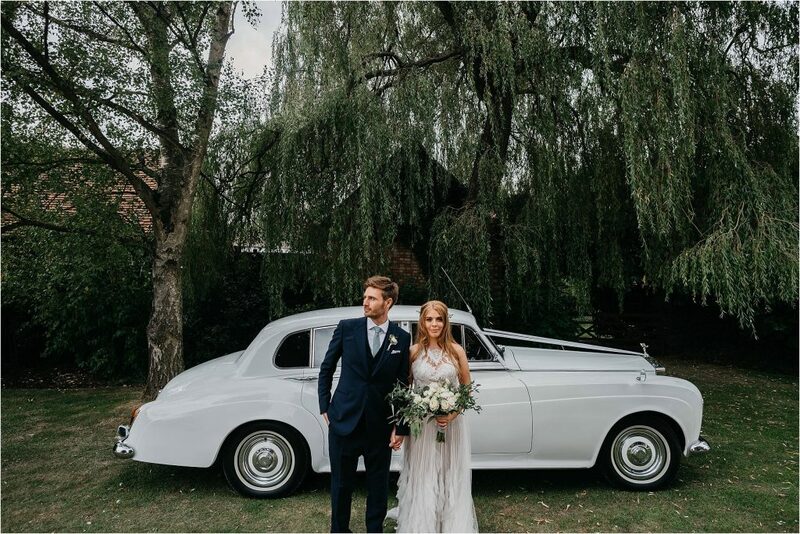 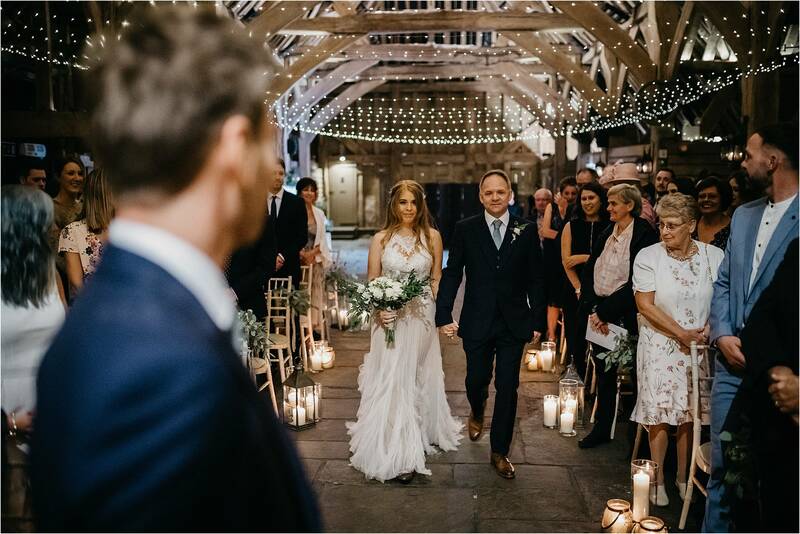 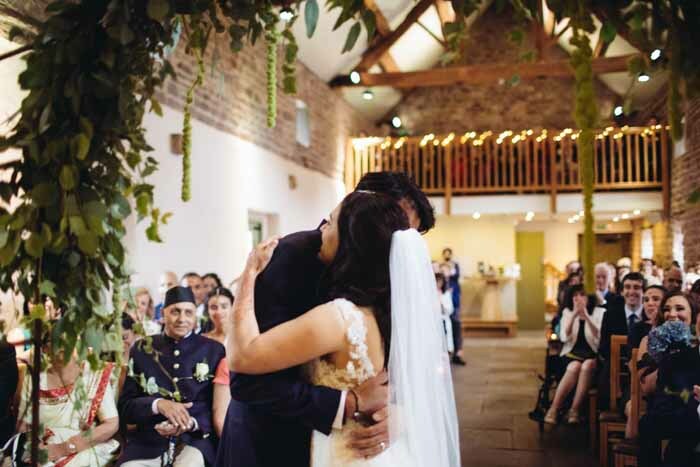 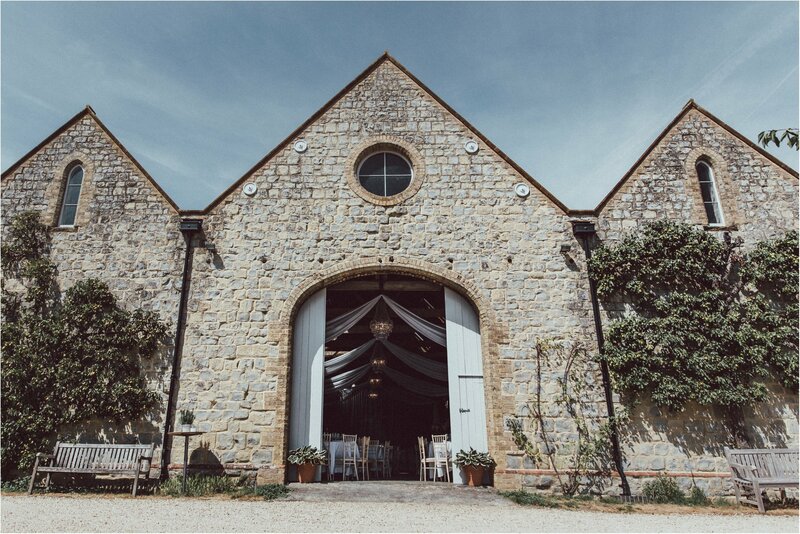 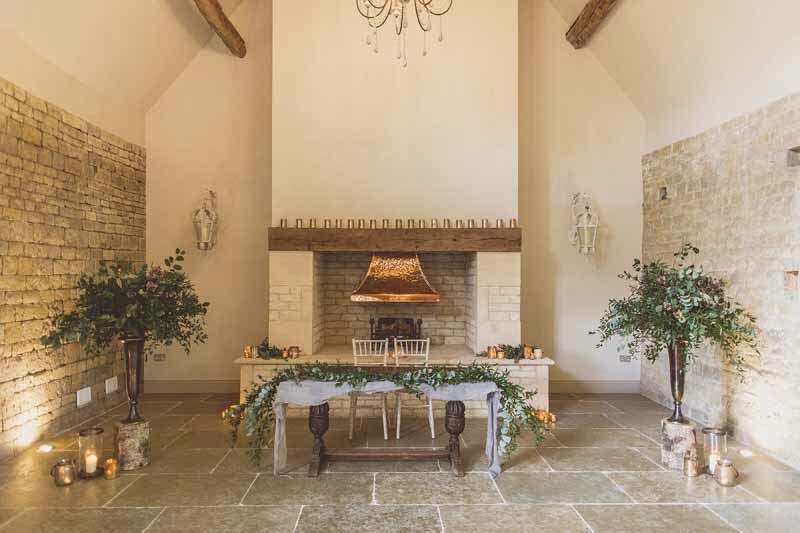 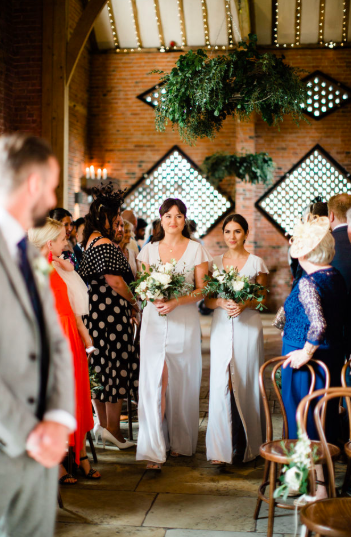 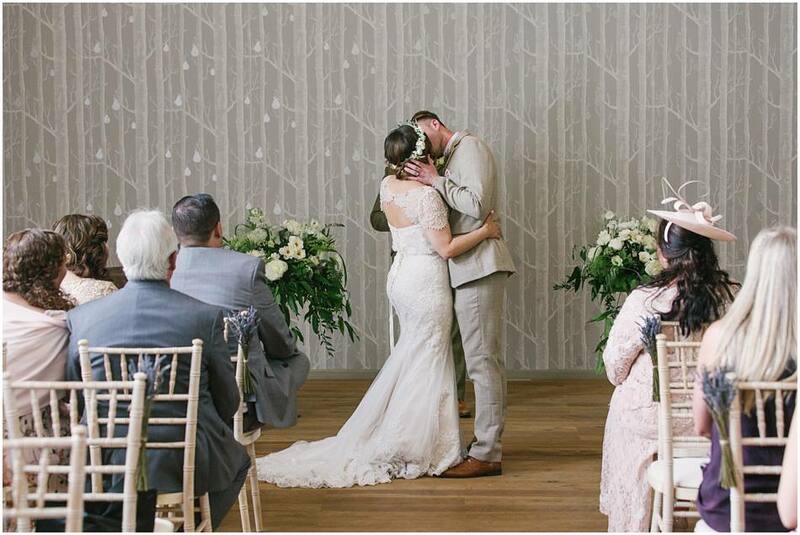 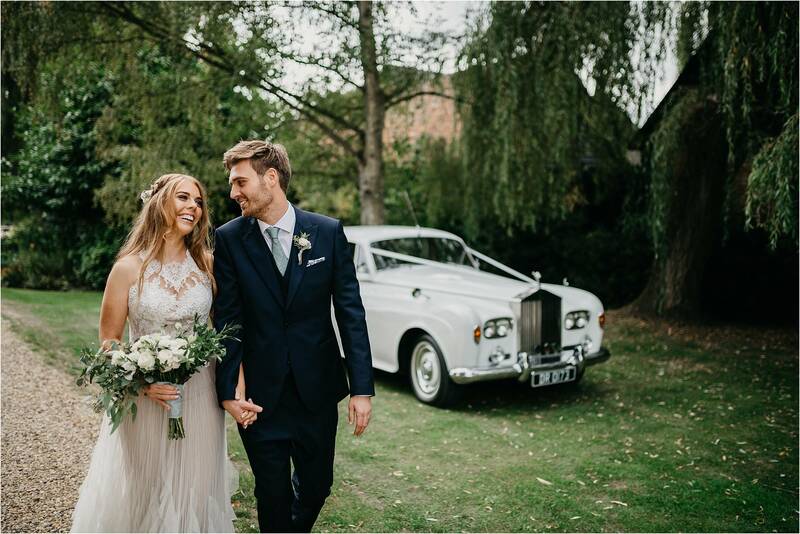 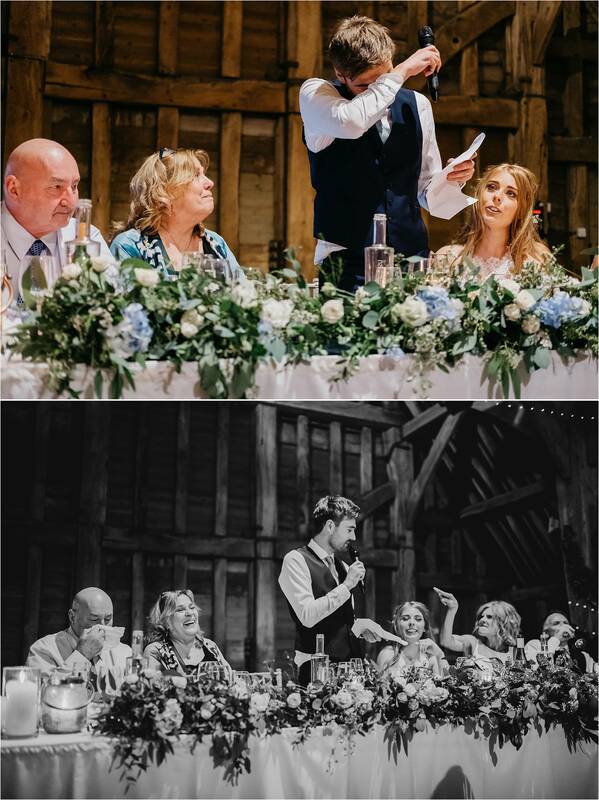 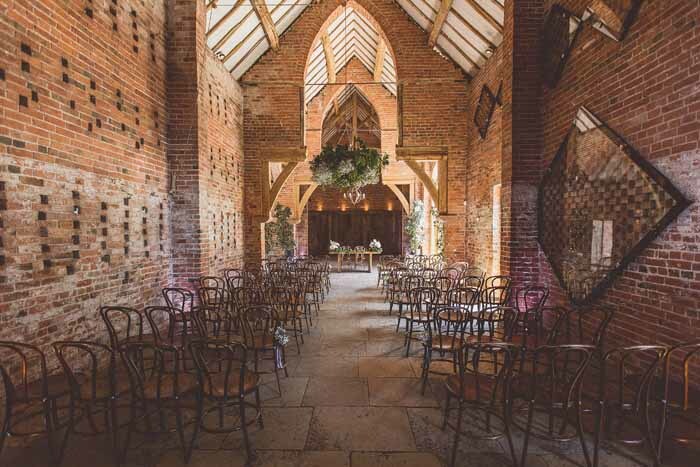 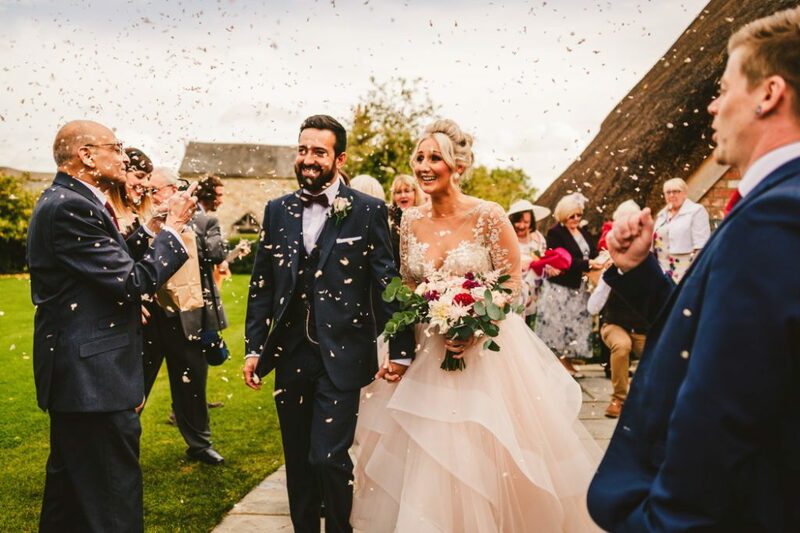 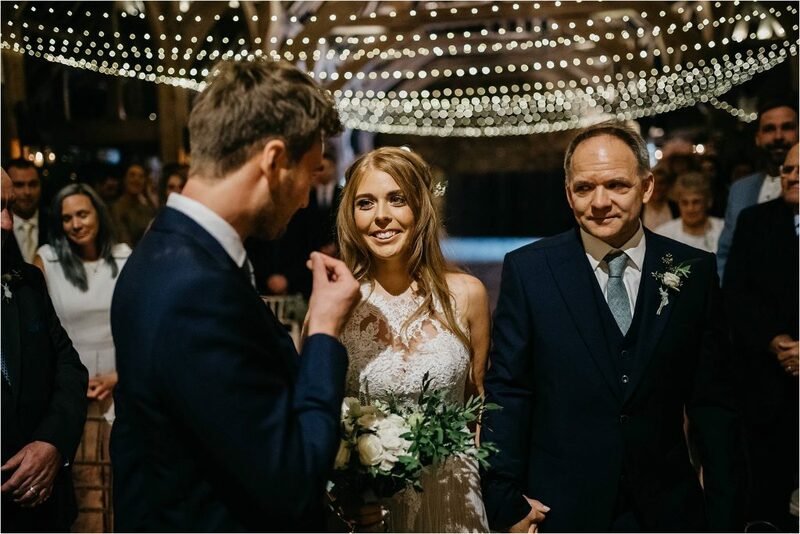 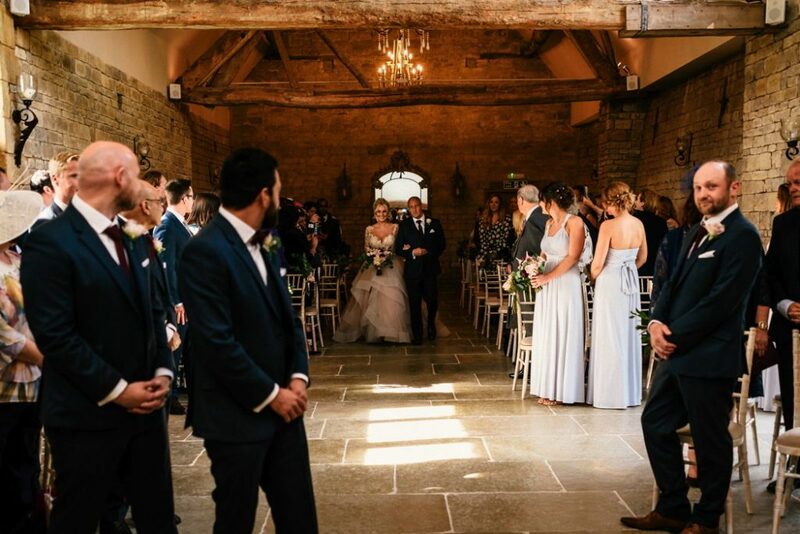 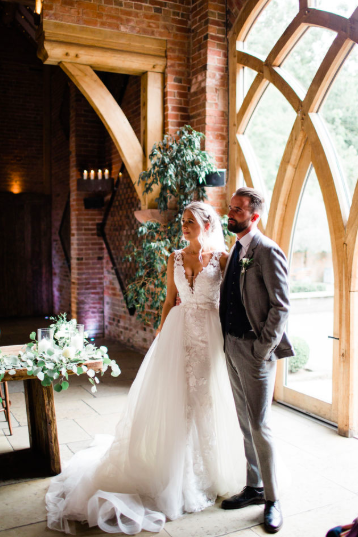 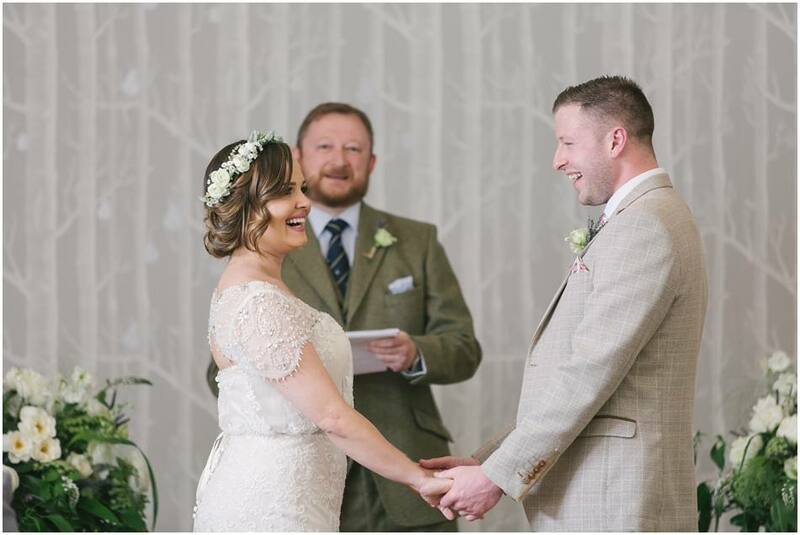 The ceremony venue was Longbourne Barn a gem in the Warwickshire countryside that was the perfect choice for this laid back ceremony. 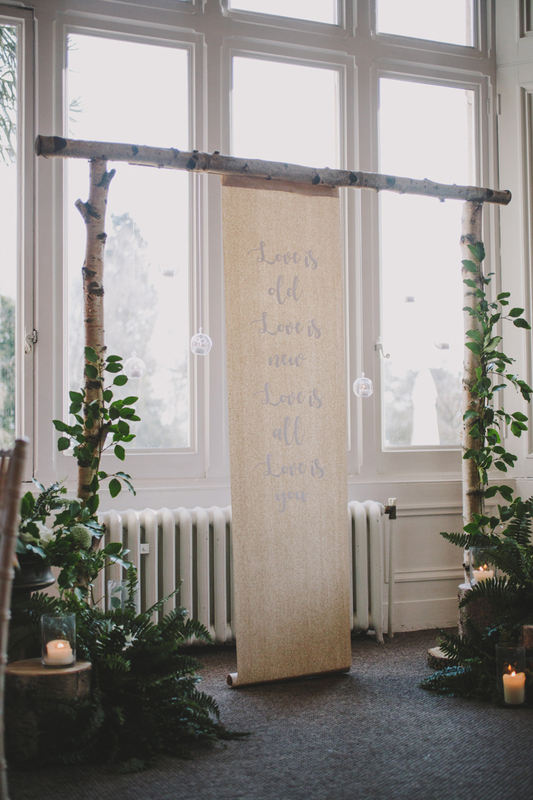 Foliage was key to the day and we decorated everywhere we could with a relaxed mix of foliage. 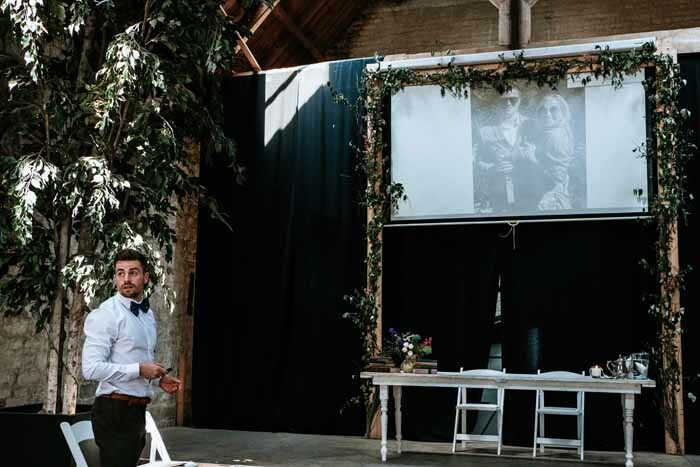 The screen was incorporated into the day with beautiful images projected bringing to life this happy couple. 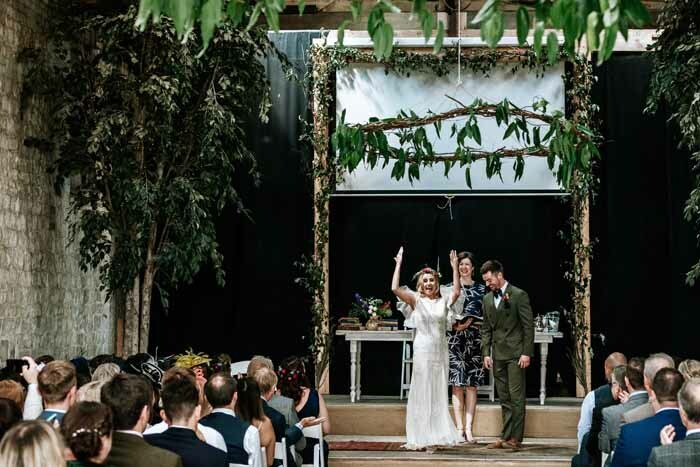 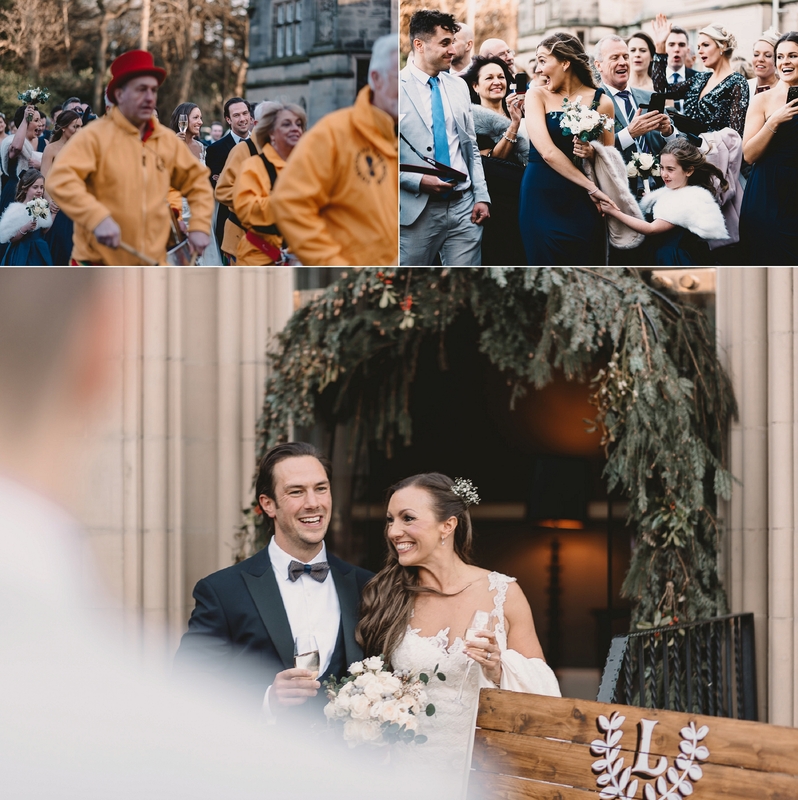 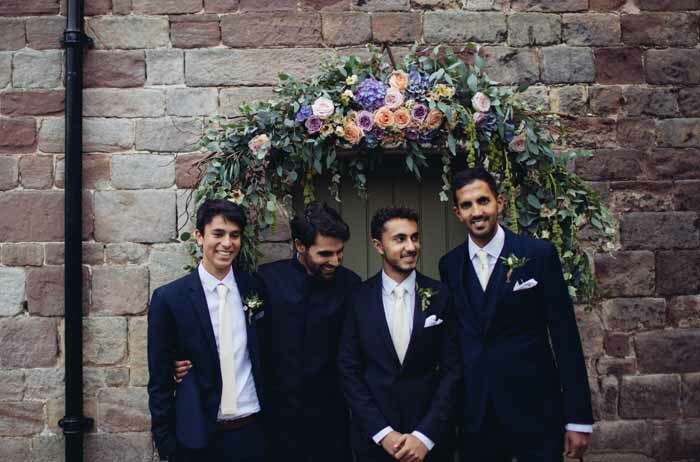 The giant frame was hand built for the ceremony and we loved decorating it with a mix of foliage and natural flowers to create this laid back festival styled wedding. 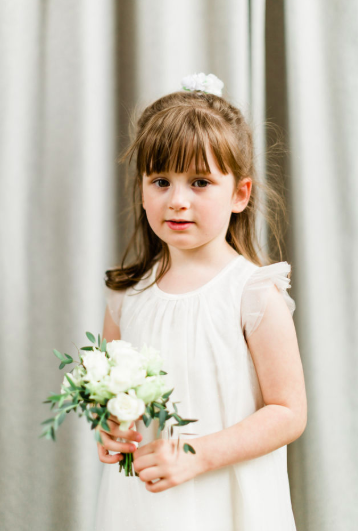 Niamh choose stylish floral hoops for her girls which were easy to hold and created a great look with their hair flowers and navy jumpsuits. 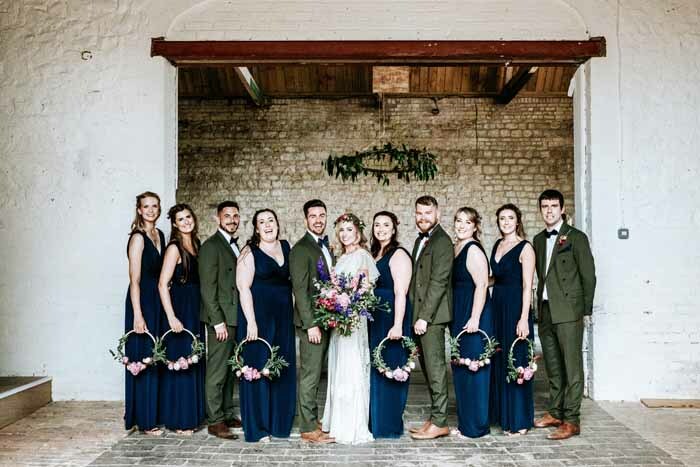 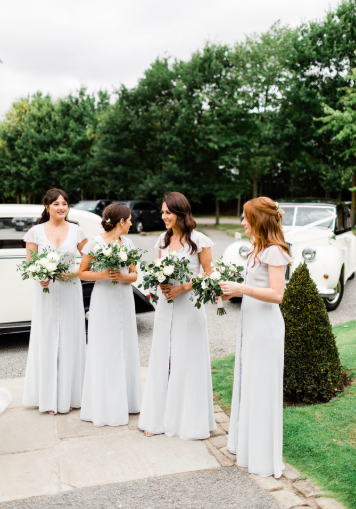 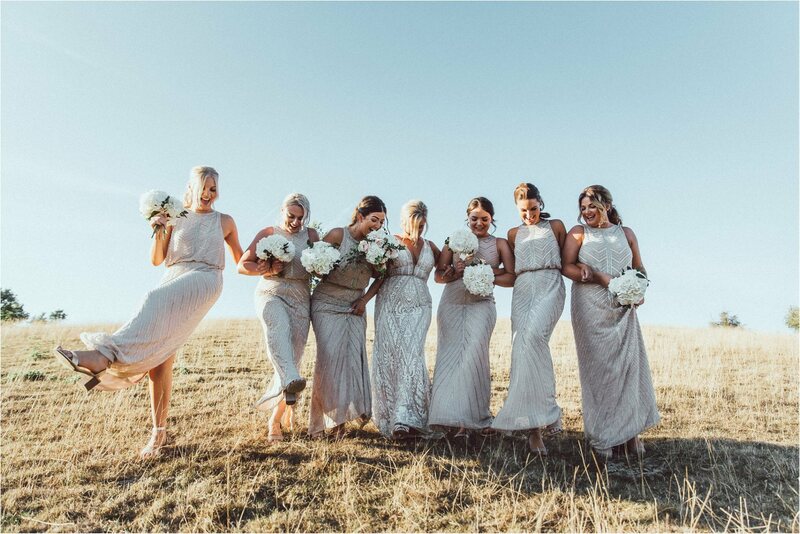 The bridal party line up was so chic and effortlessly stylish. 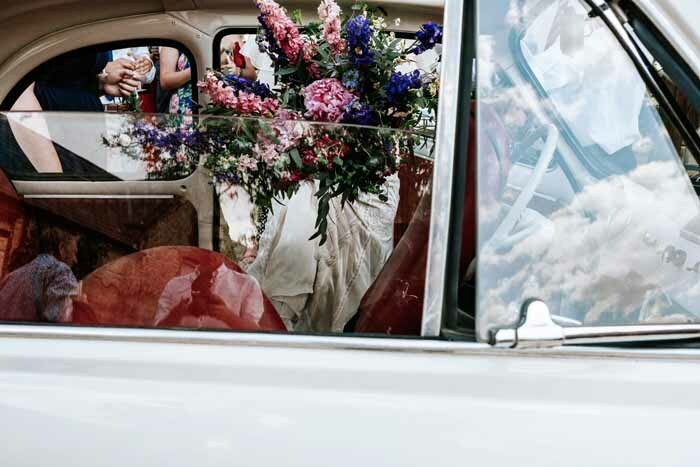 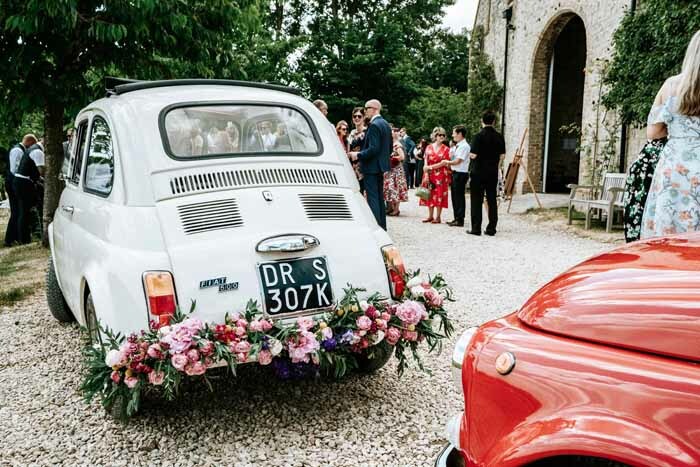 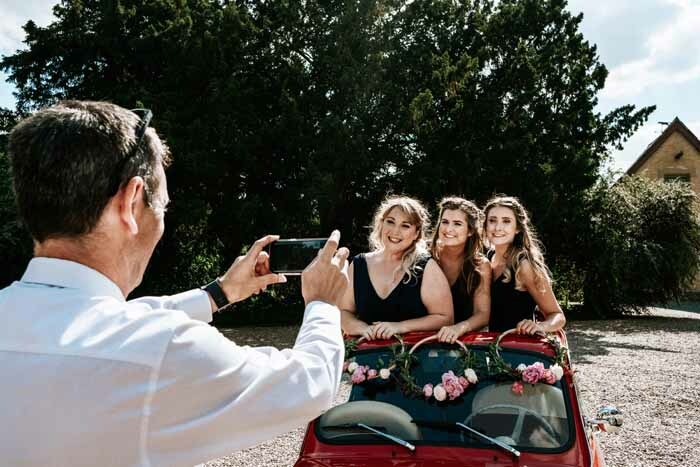 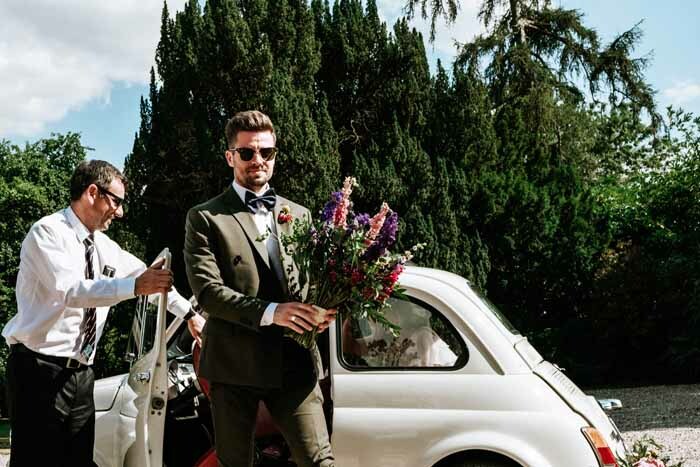 Gemma and I always jump at a chance to add flowers to a wedding car and the Fiat 500 was a joy to flower. 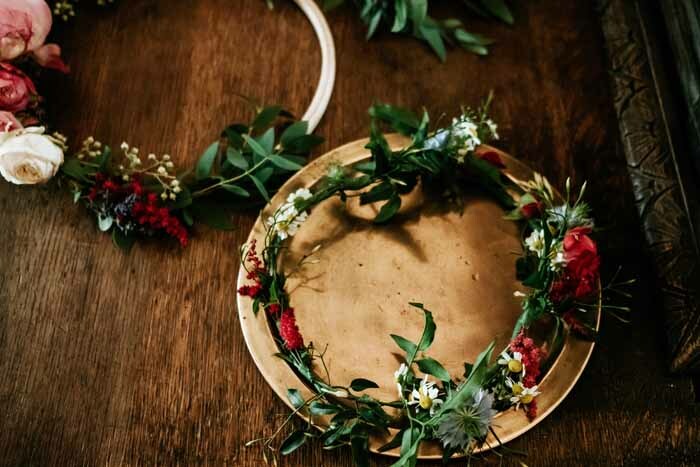 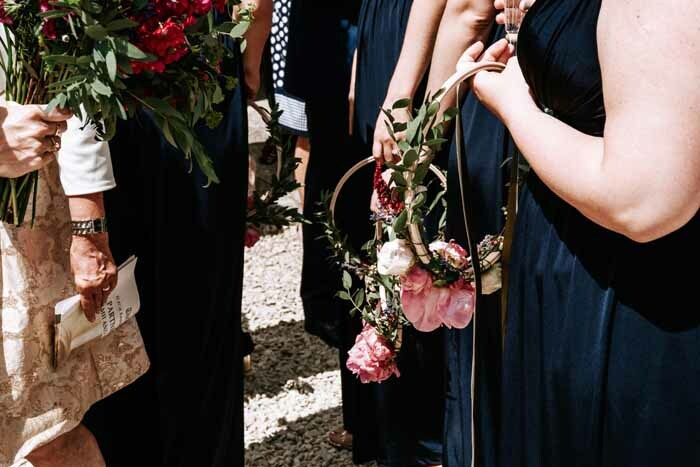 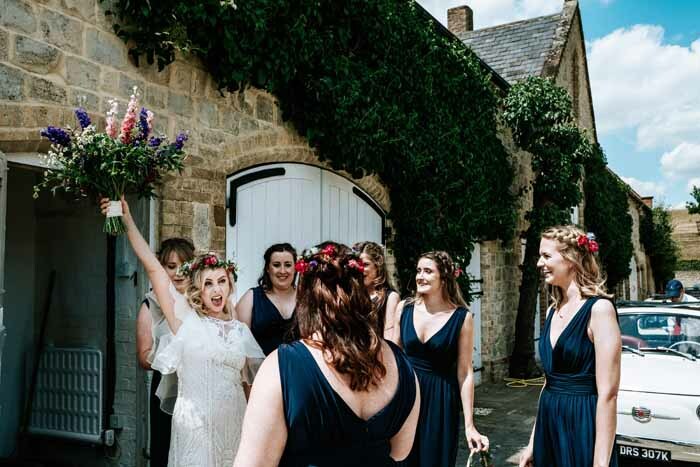 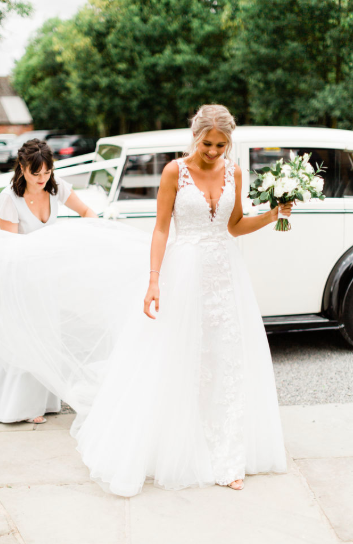 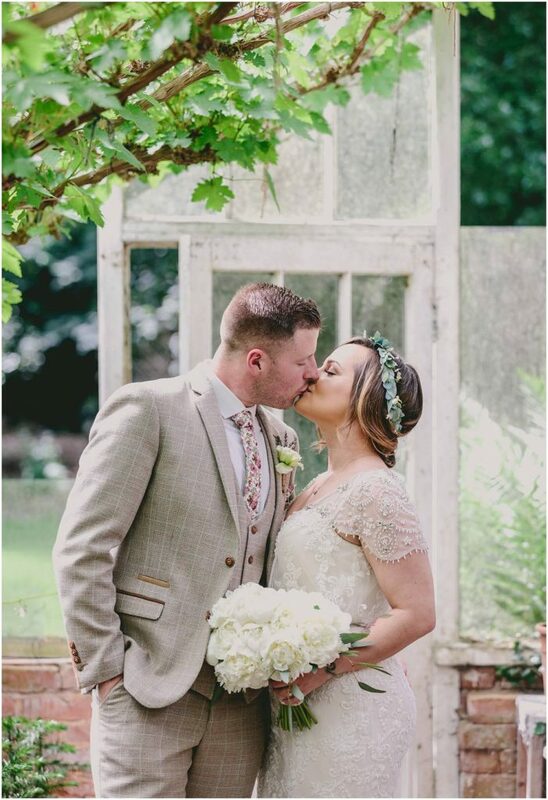 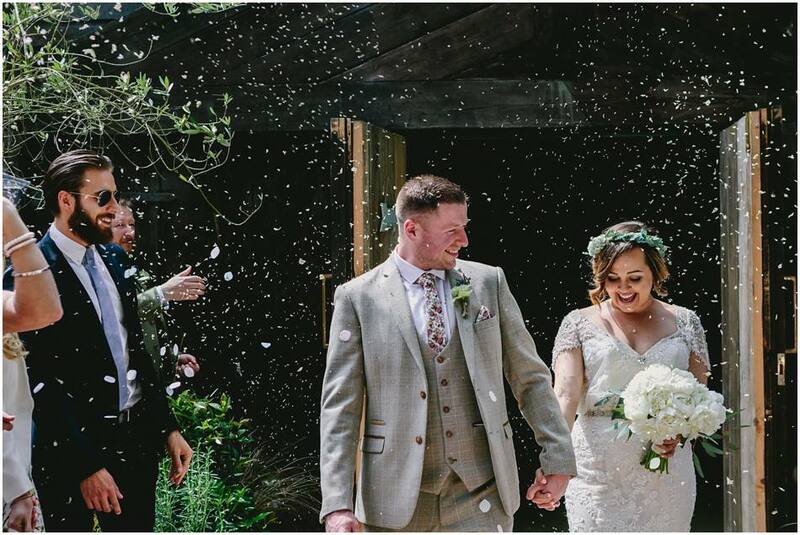 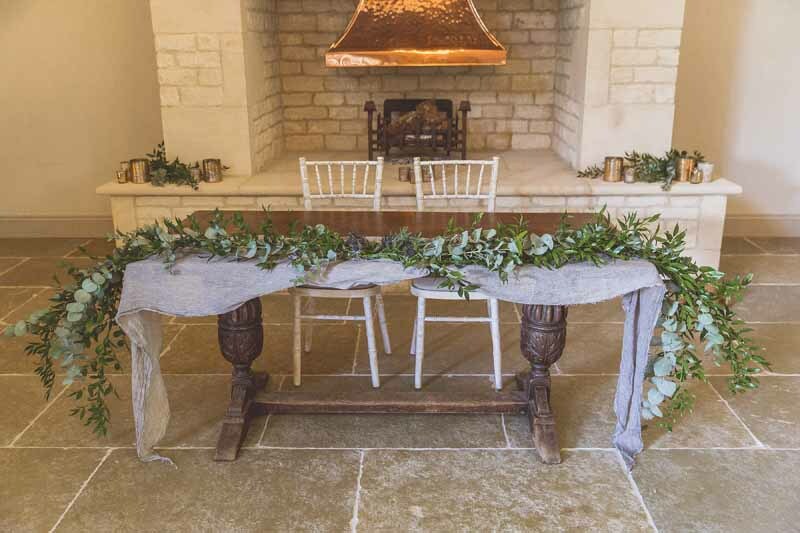 The garland had to fit the festival look and feel of the wedding and be able to withstand the heat of the day and the trip from Oldberrow House over to the ceremony venue. 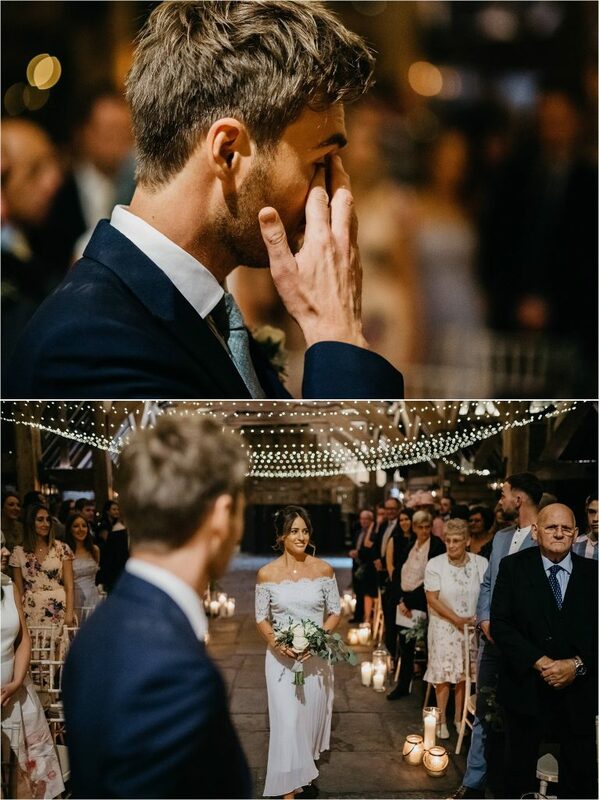 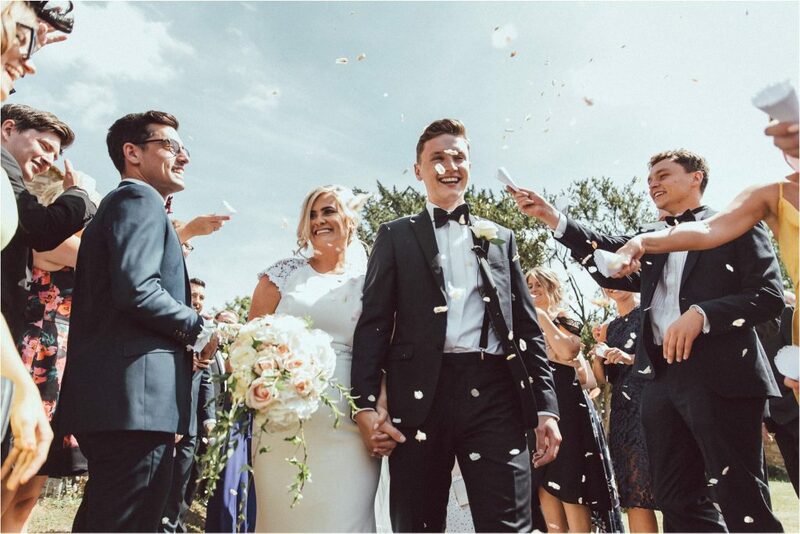 I have to say it was one of our favourite parts of this amazing wedding and still brings tears to my eyes. 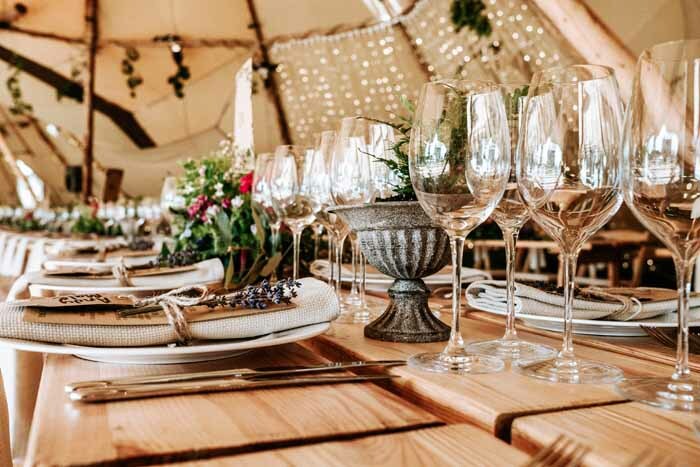 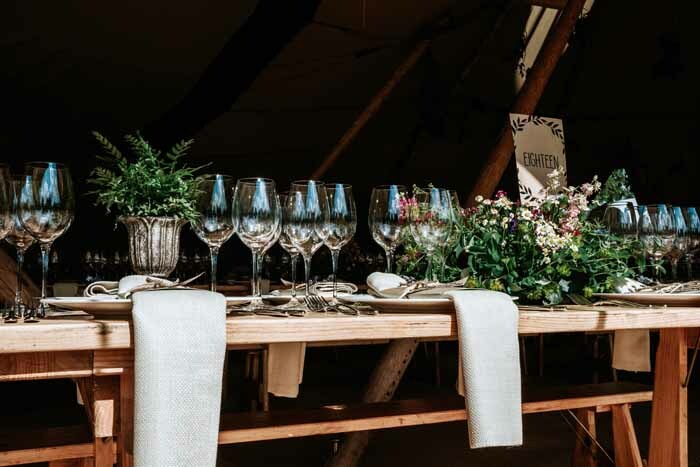 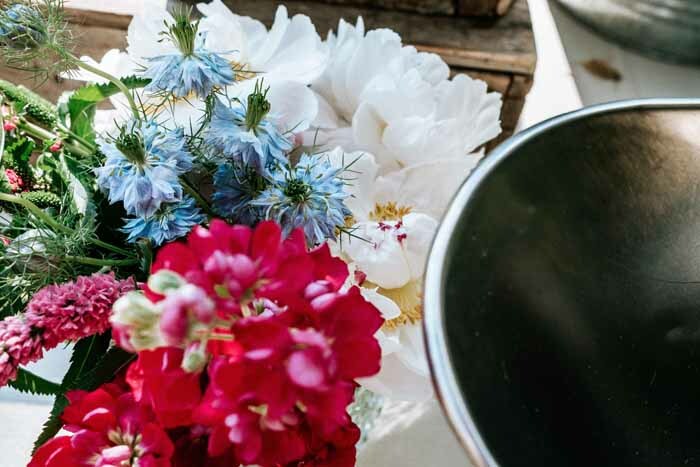 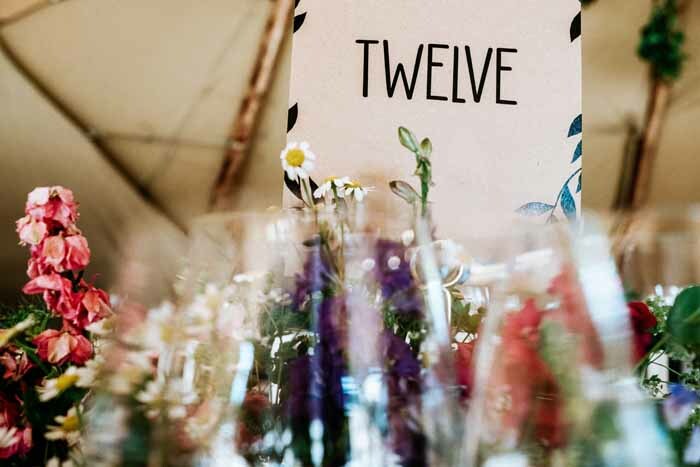 Elite Tents set up their tipi for us to decorate and we loved decorating with hanging ivy and adding an abundance of bright festival inspired blooms on the tables. 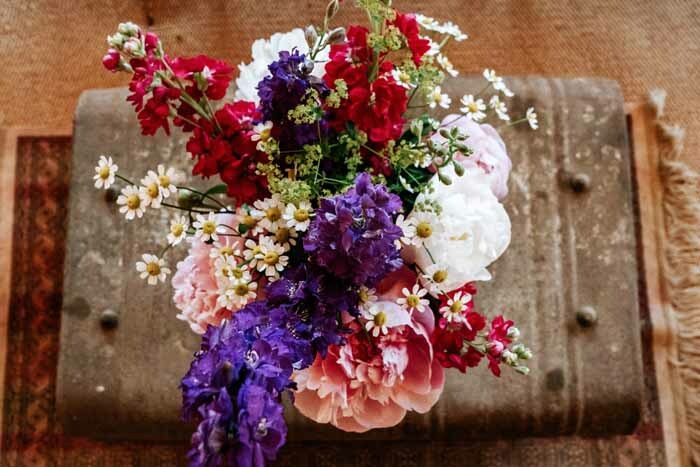 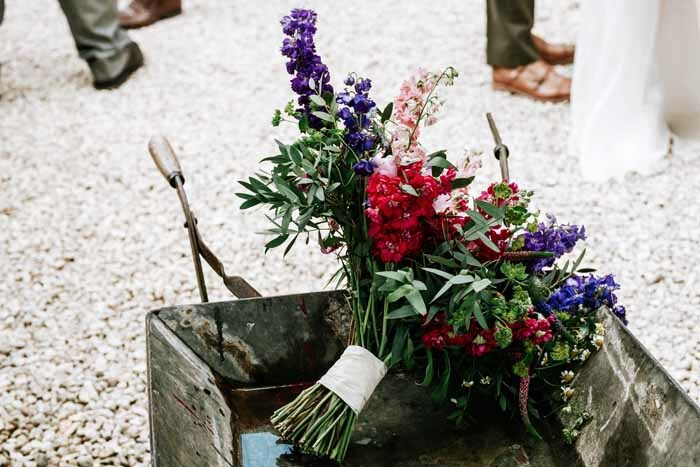 In the tipi we added an informal touch of colour and blooms from the day. 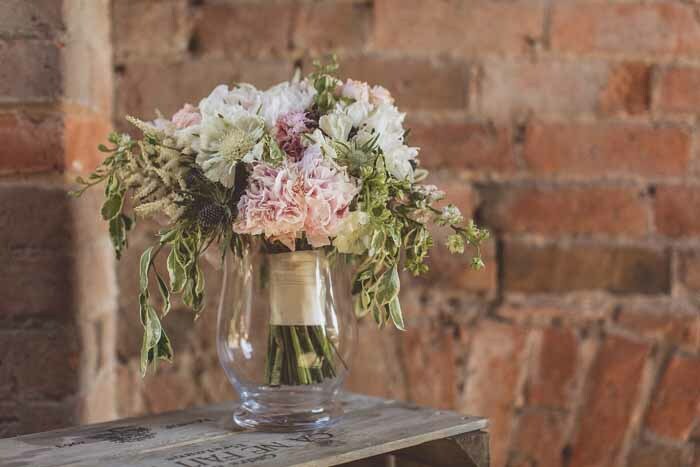 The vintage glass jug with a mass of pretty blooms from the day was the perfect match for the cocktail menu board and scented candle. 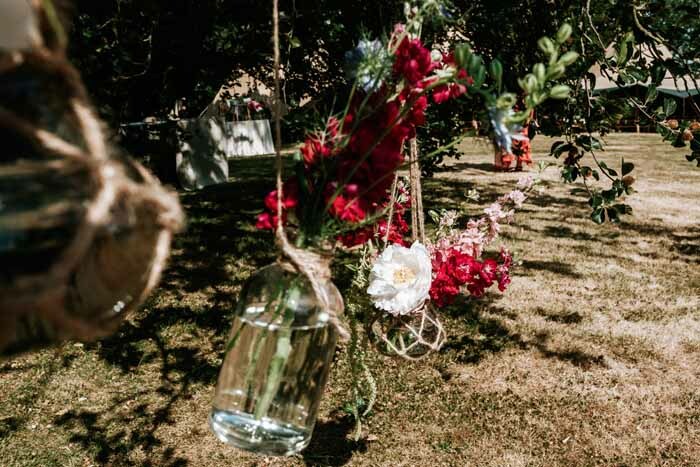 The beautiful gardens at Oldberrow House have many beautiful trees and an eclectic mix of vases and hanging bottles added some colour to the green of the trees. 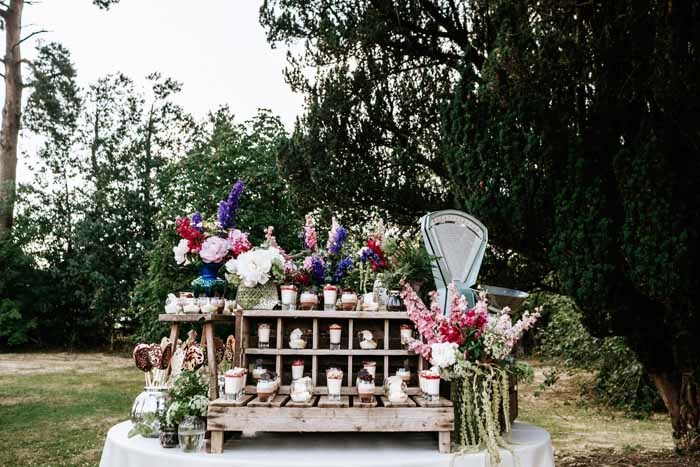 Well the dessert station was a joy for all the senses. 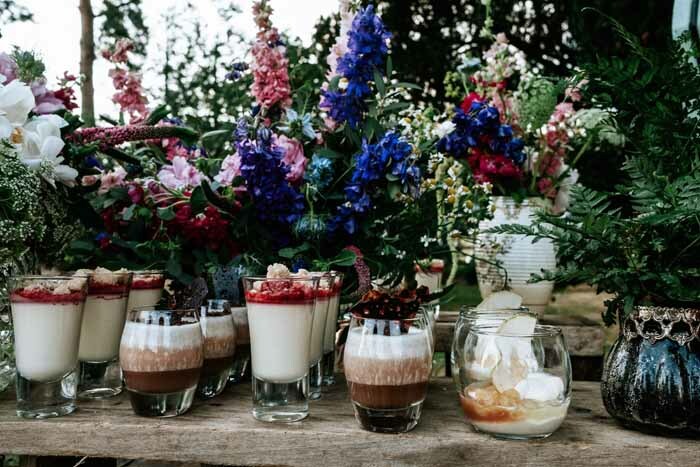 The most wonderful display of delicious desserts from the team at Kalm Kitchen was even further enhanced by some bright florals from the day. 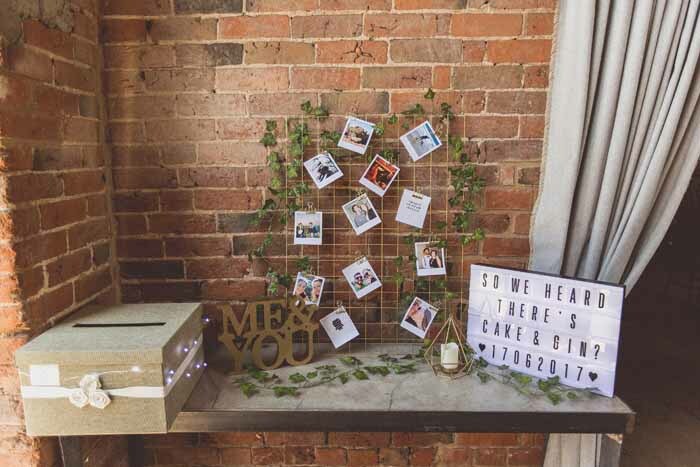 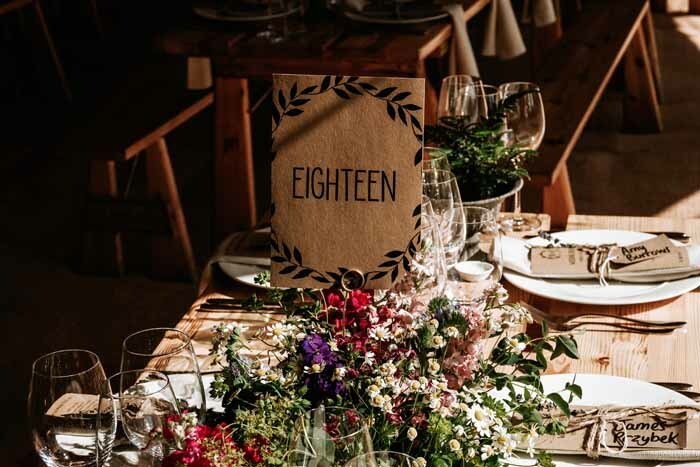 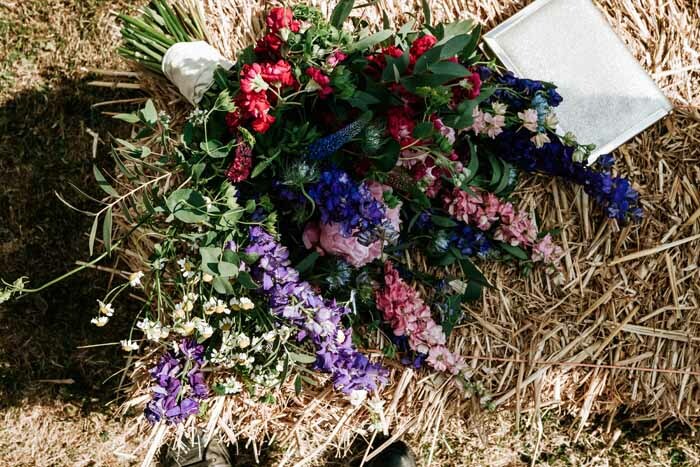 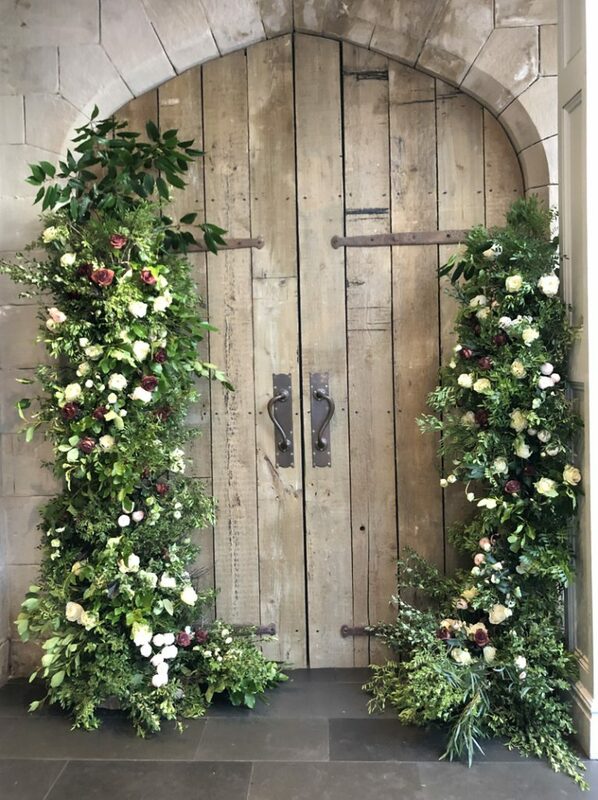 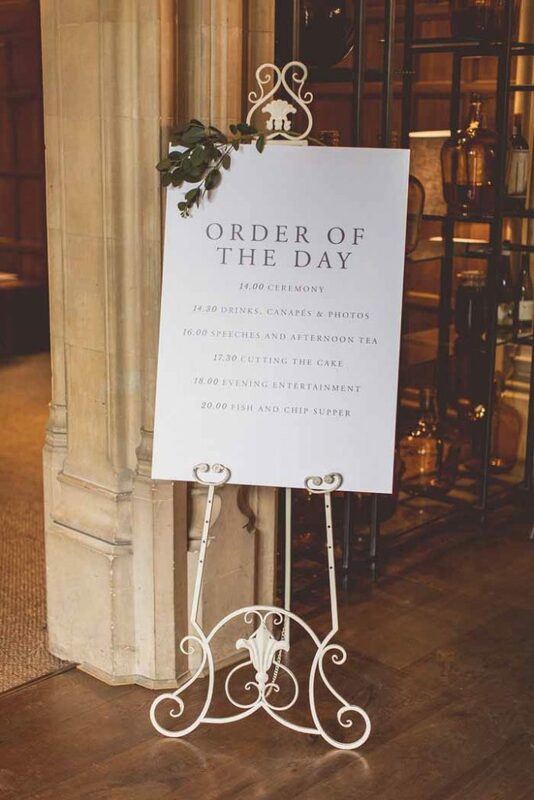 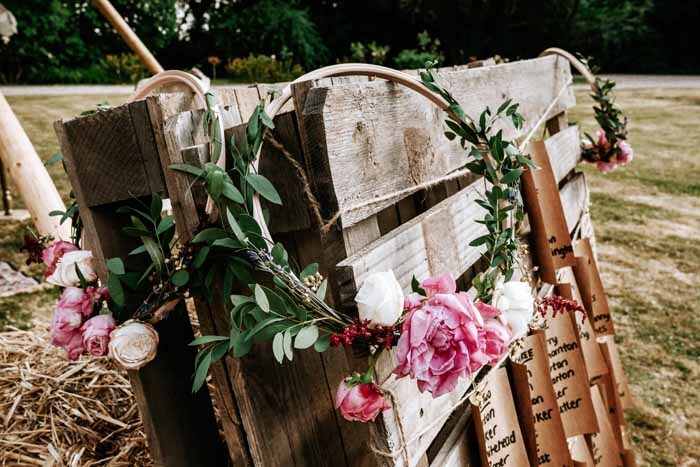 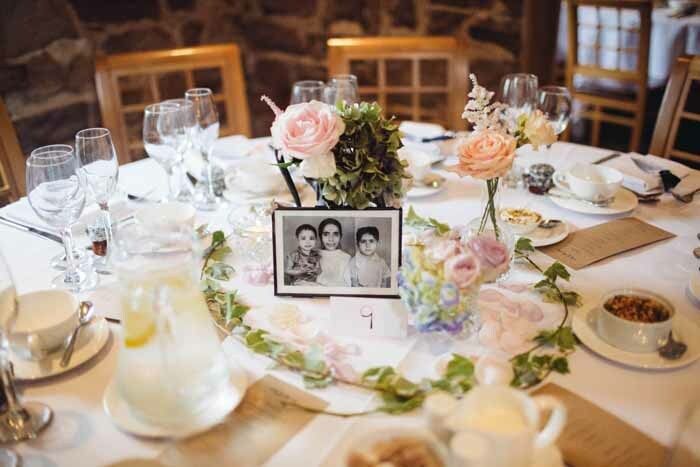 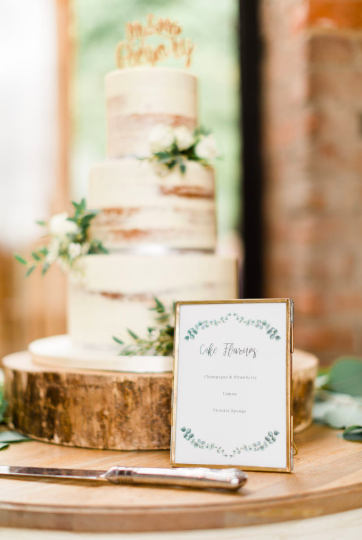 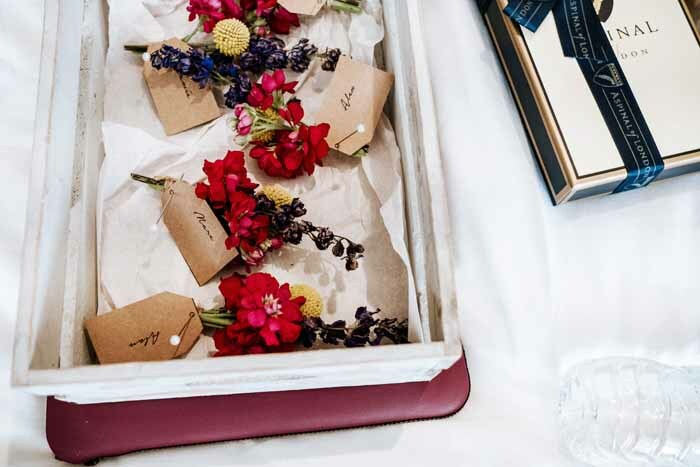 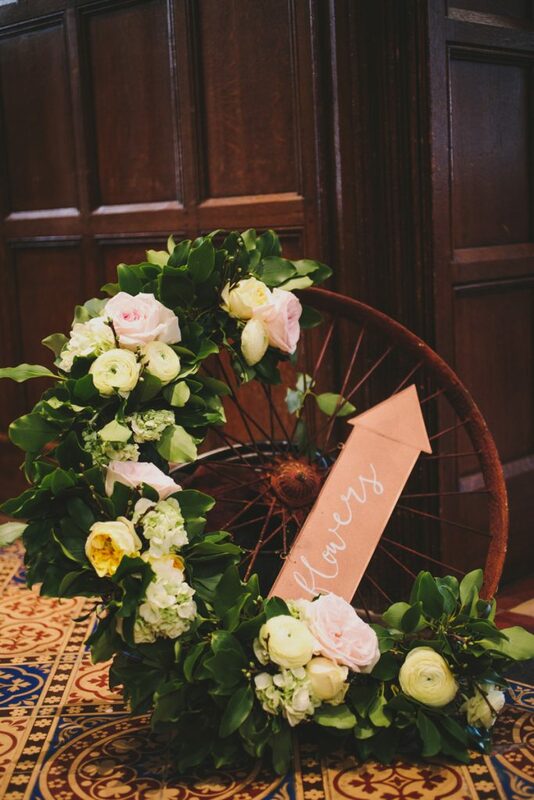 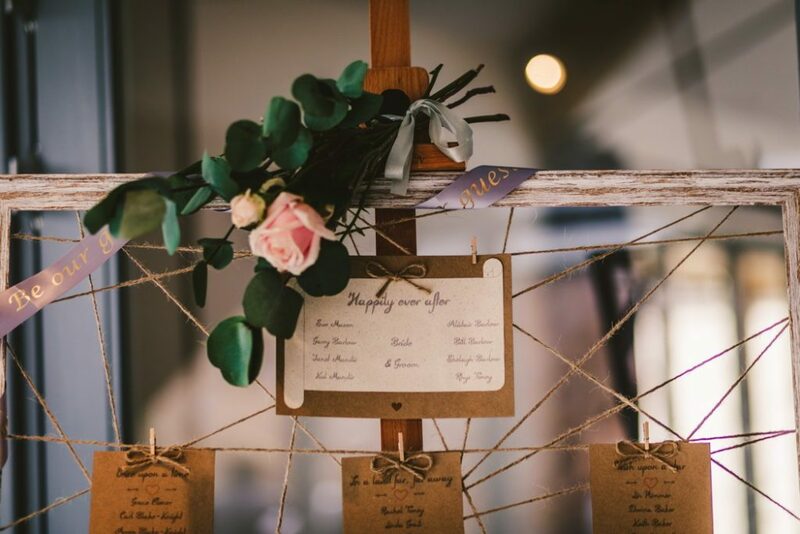 We knew we the girls would find a space to display the floral hoops later in the day and here they were casually displayed on the pallet table plan. 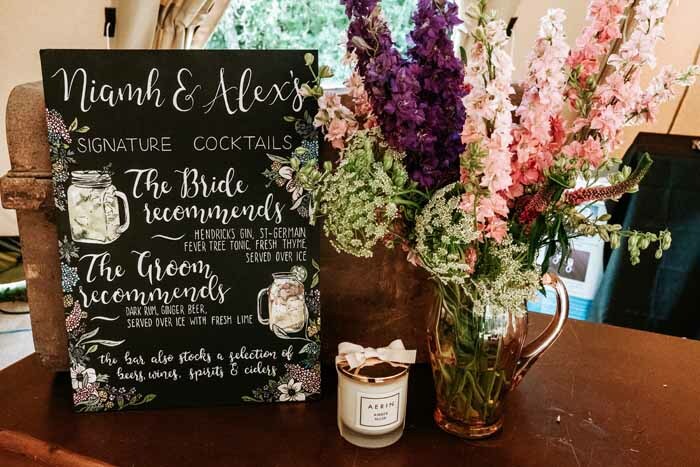 Niamh and Alex Thank you both for choosing us and for your lovely note which says it all. 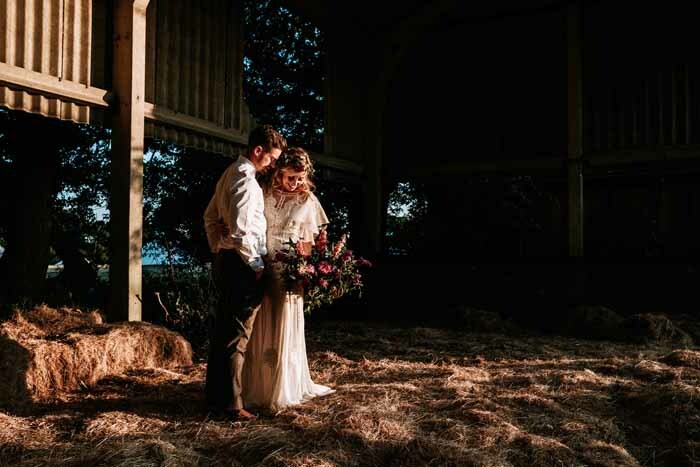 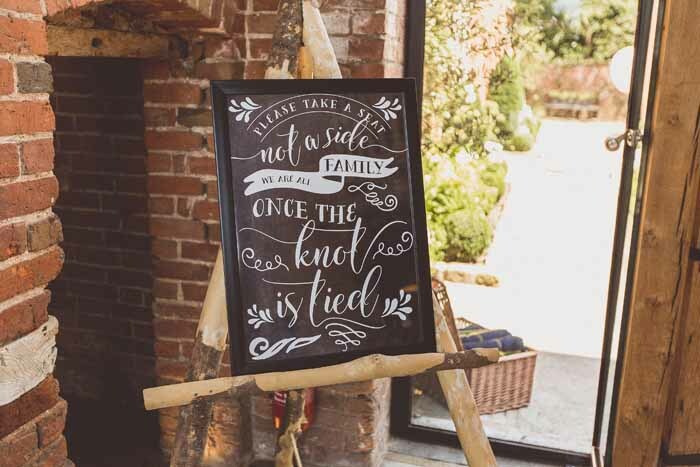 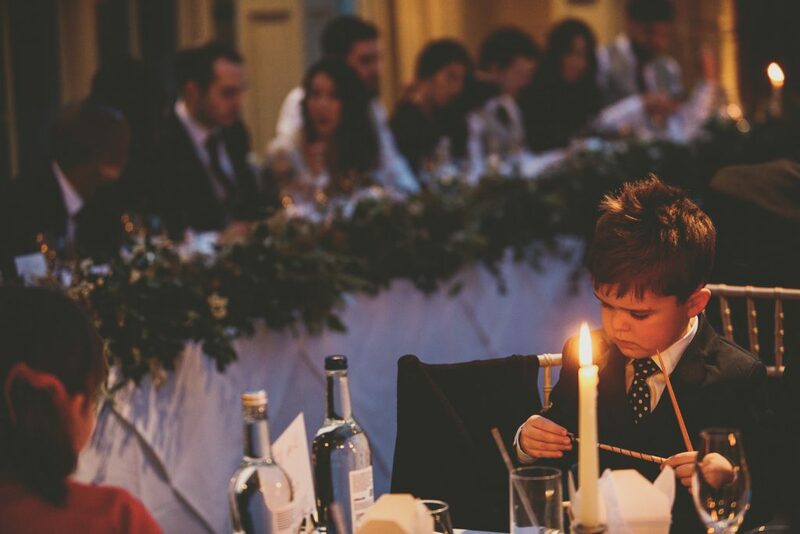 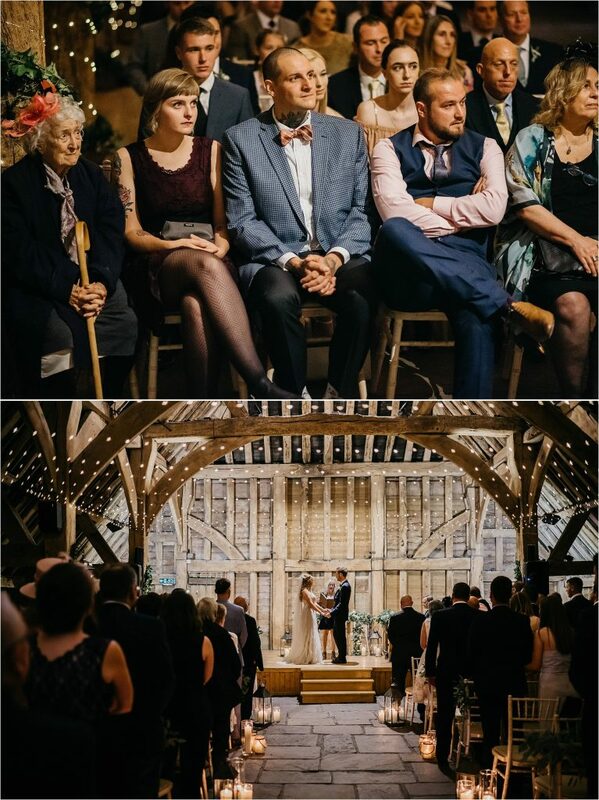 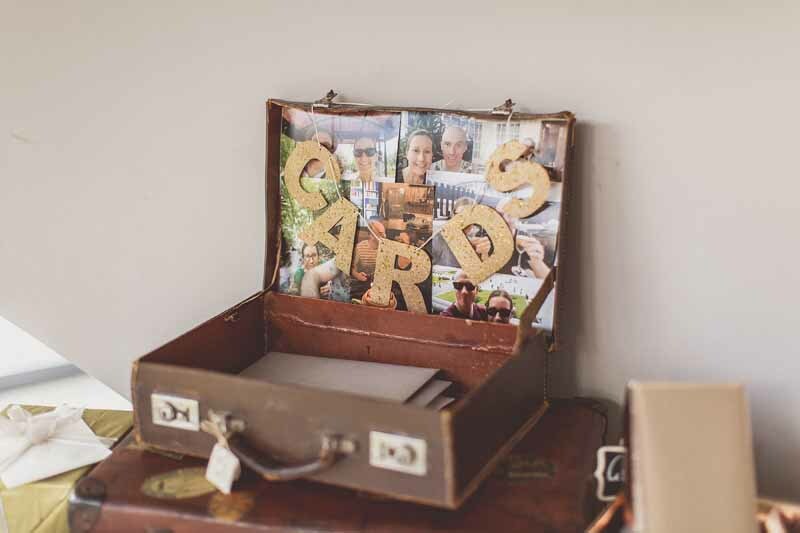 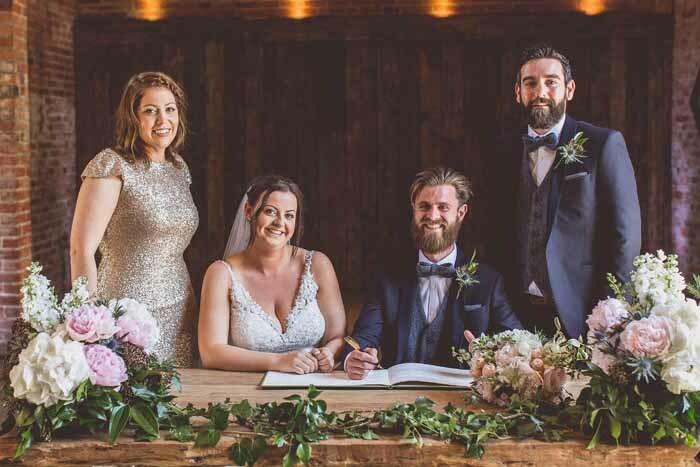 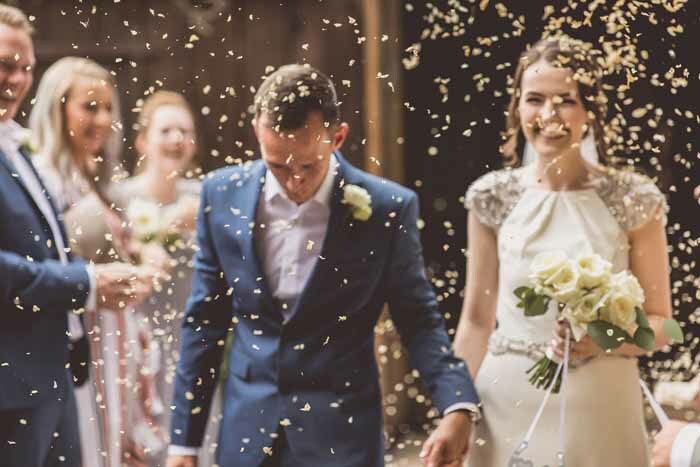 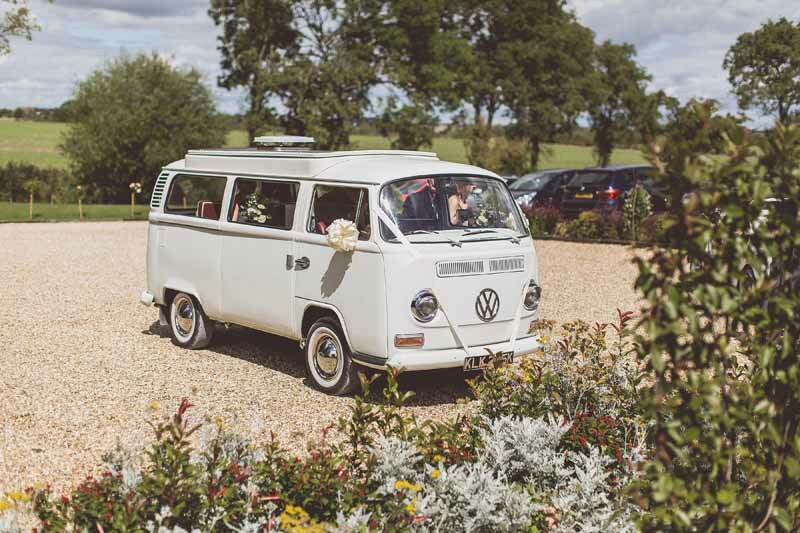 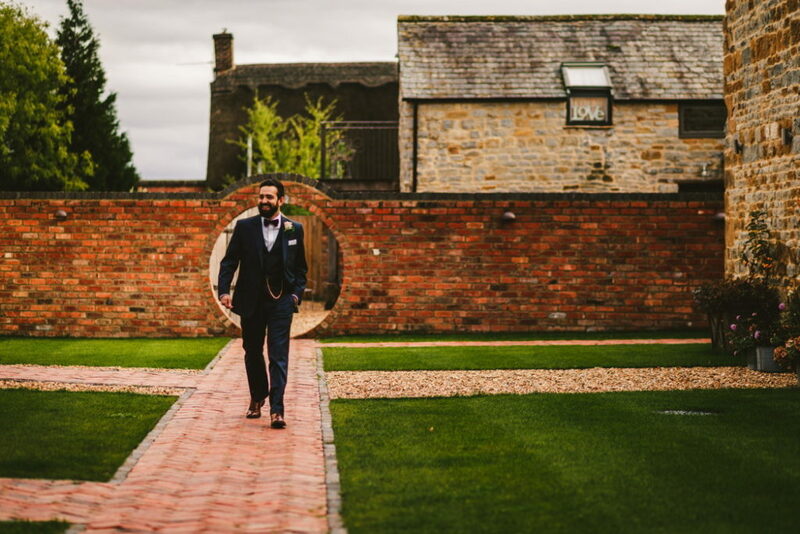 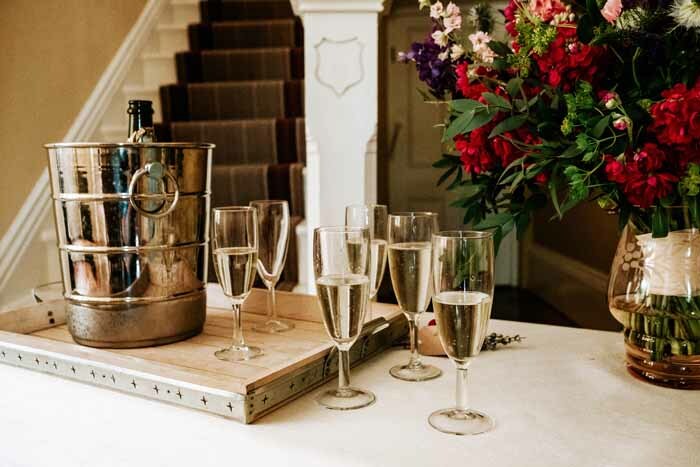 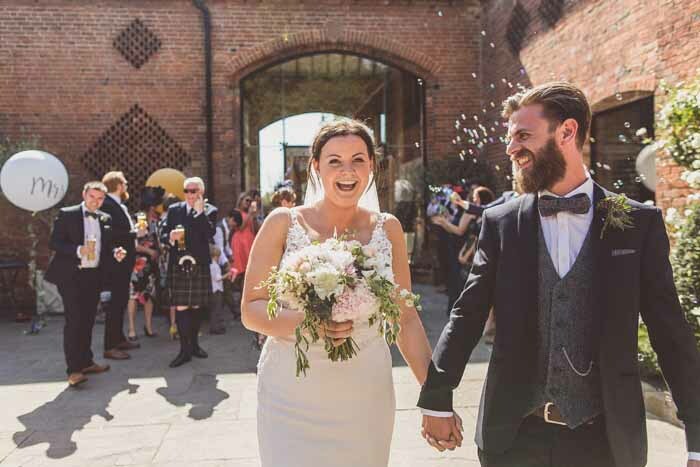 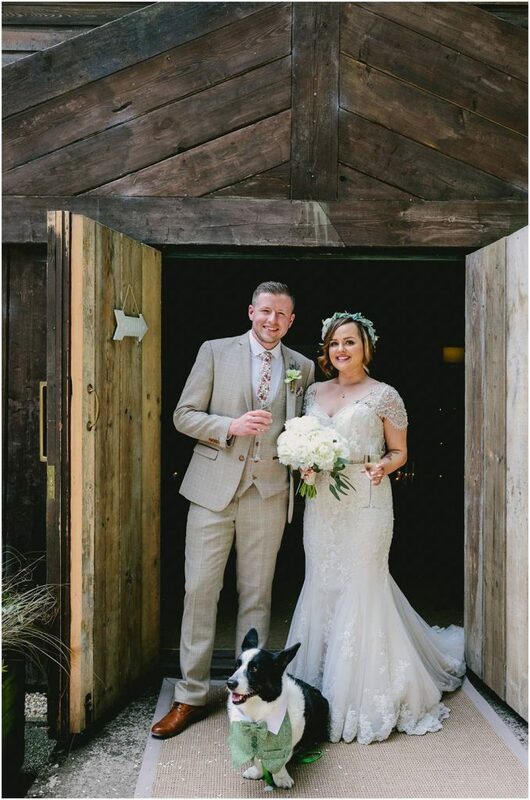 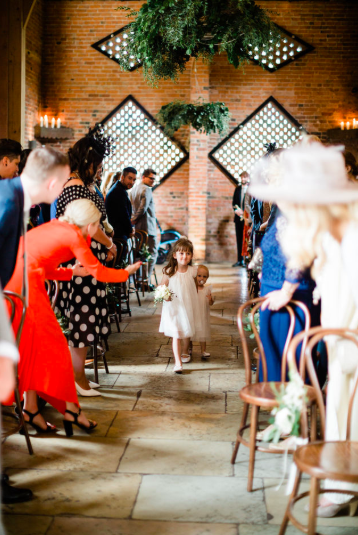 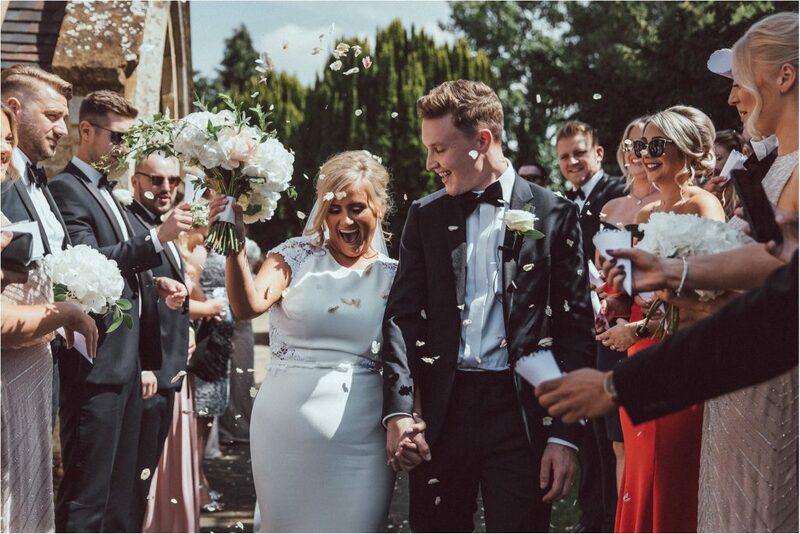 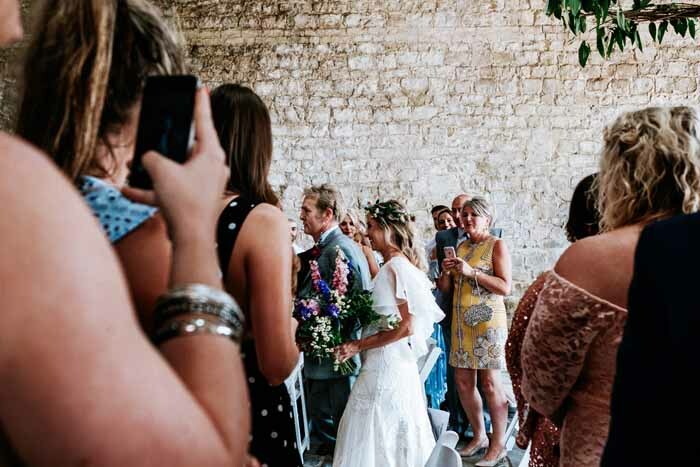 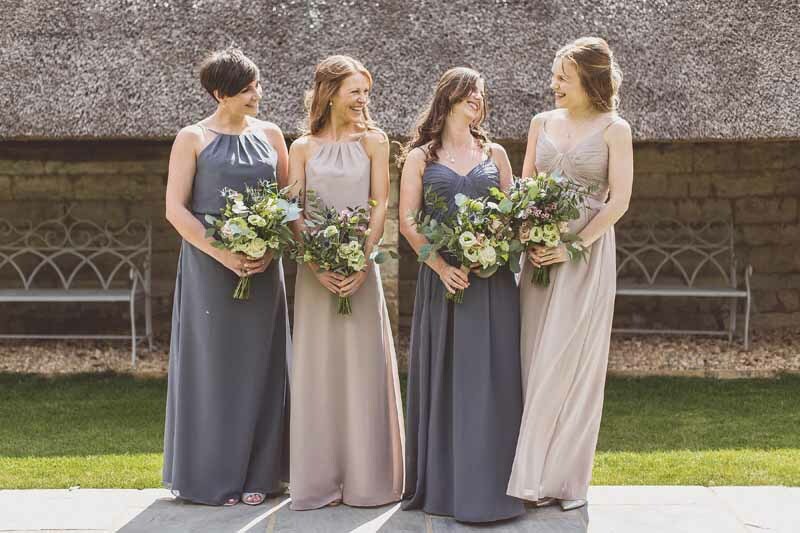 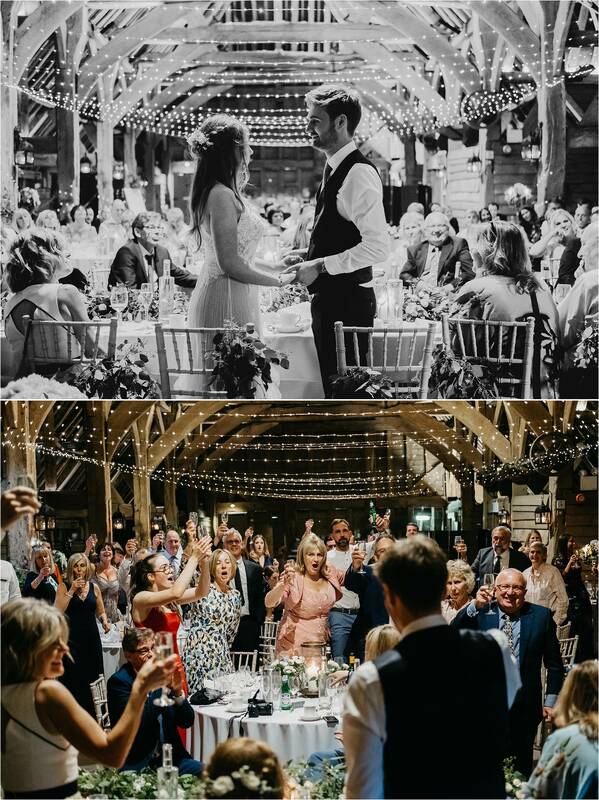 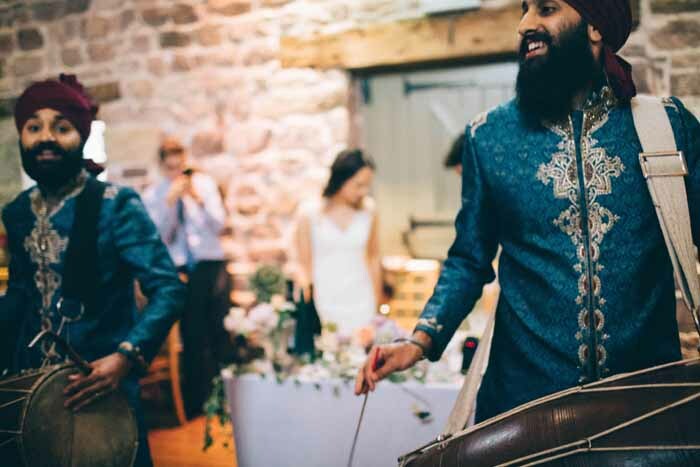 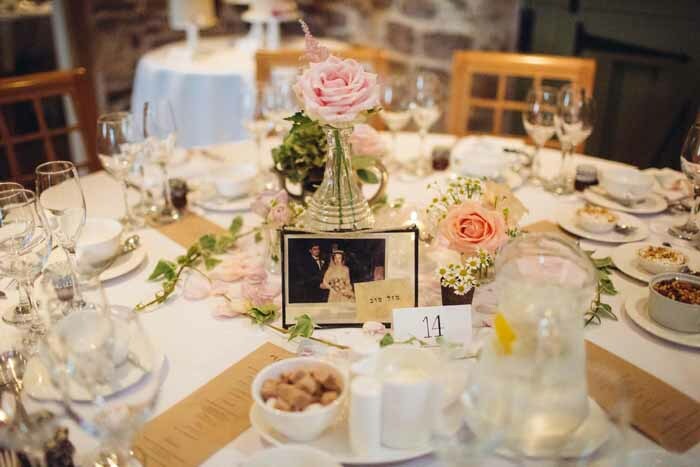 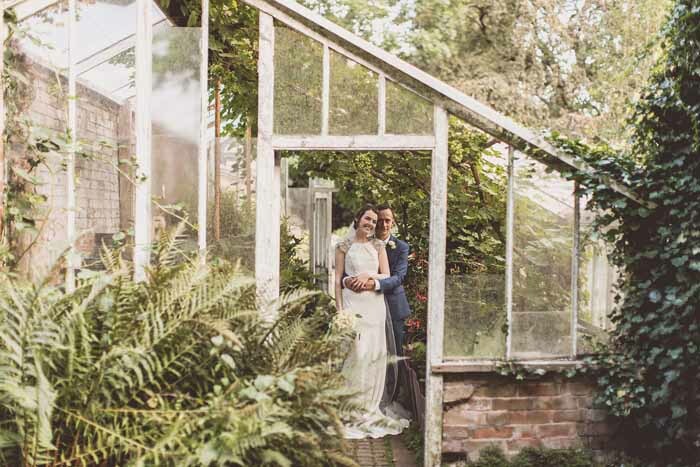 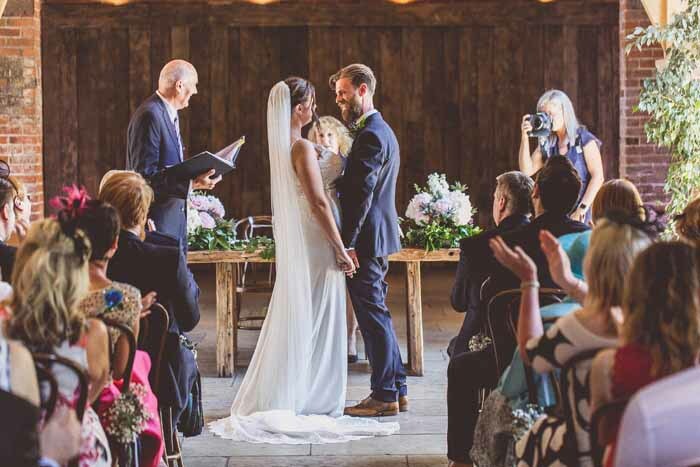 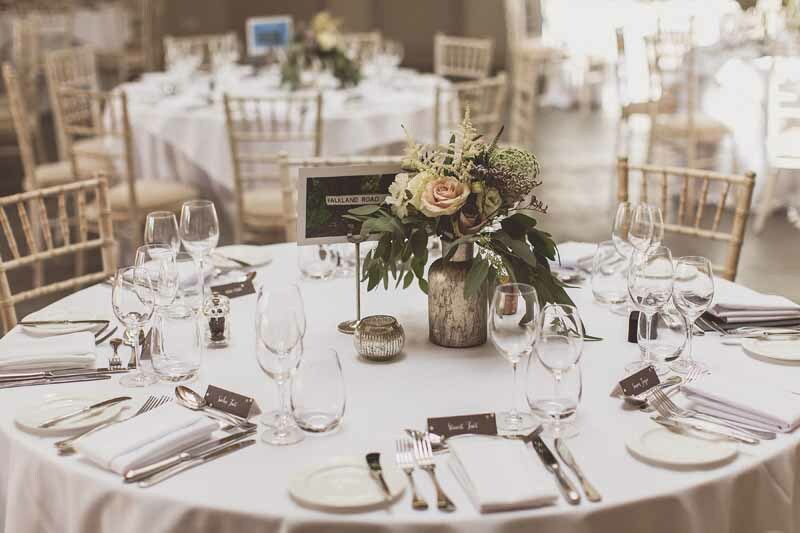 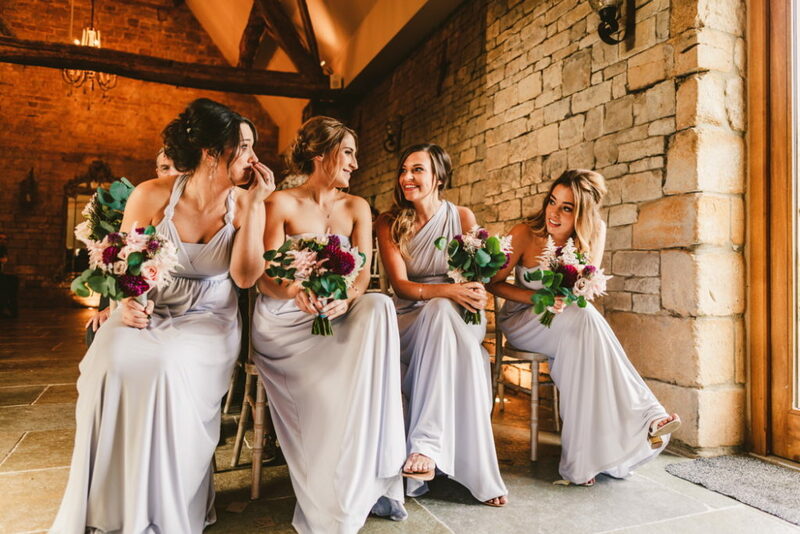 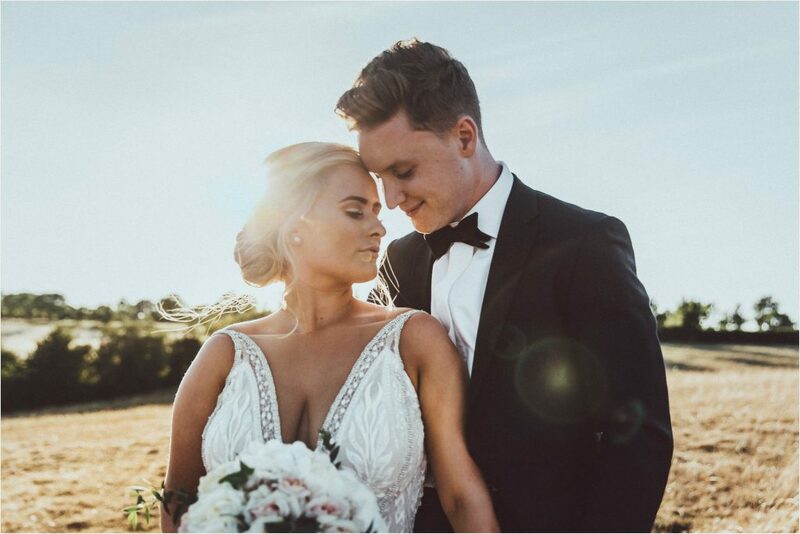 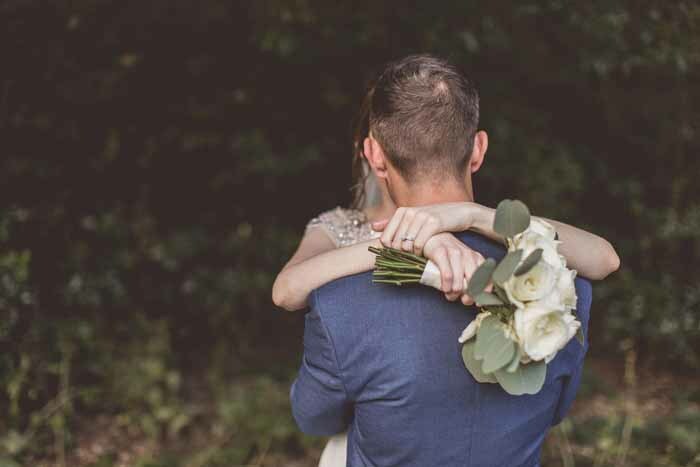 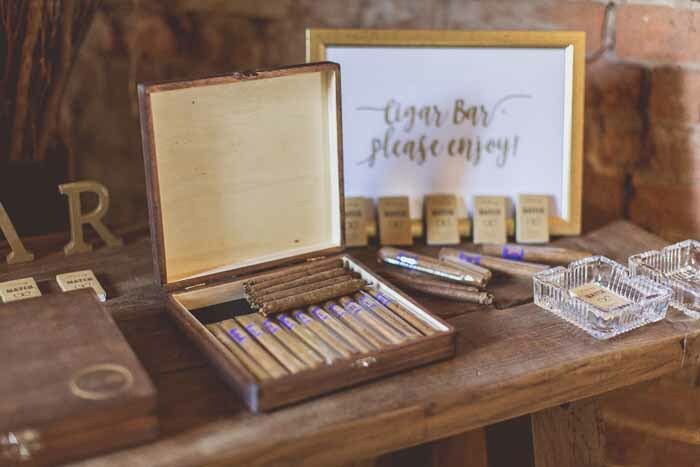 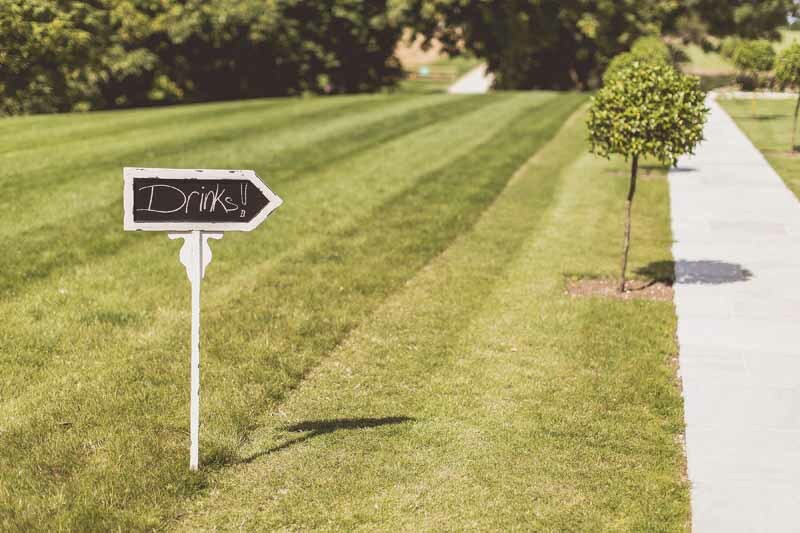 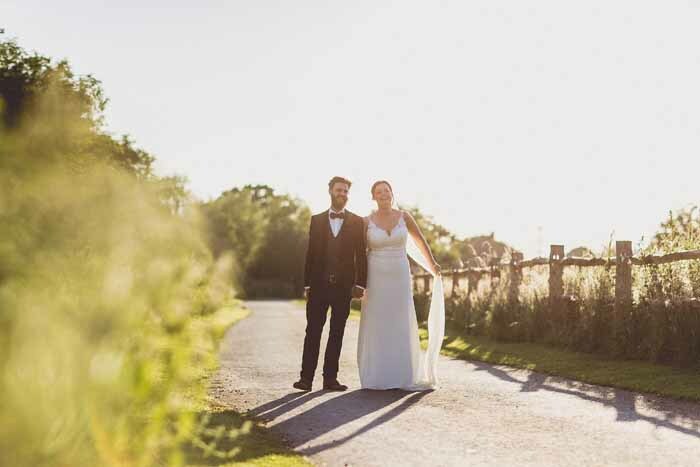 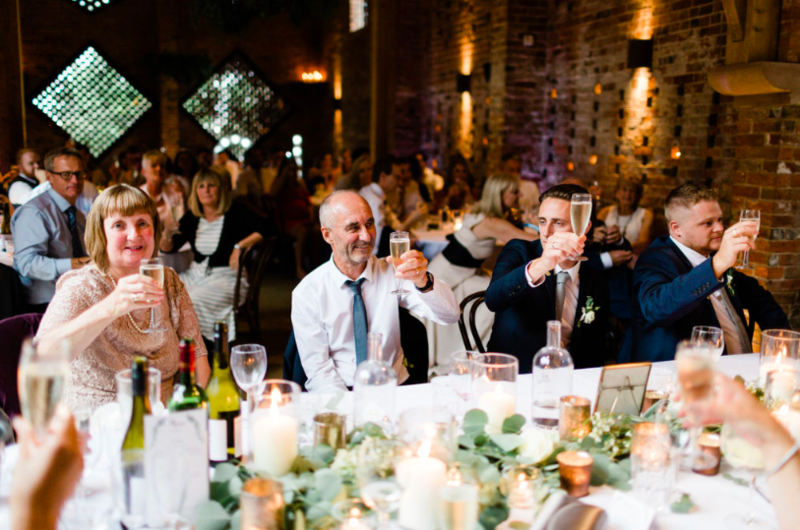 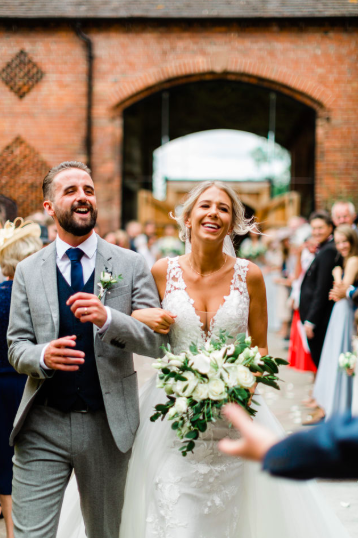 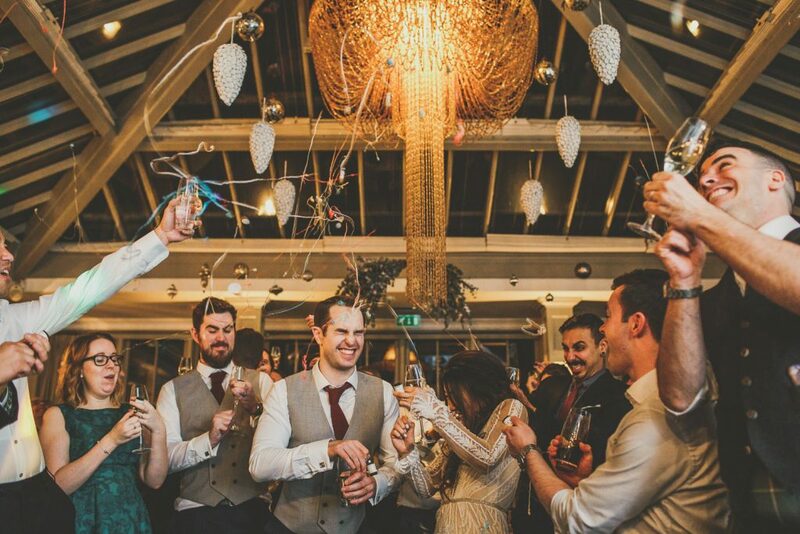 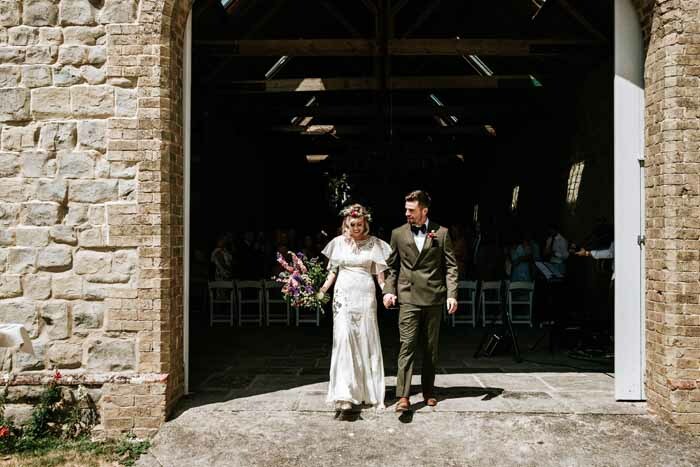 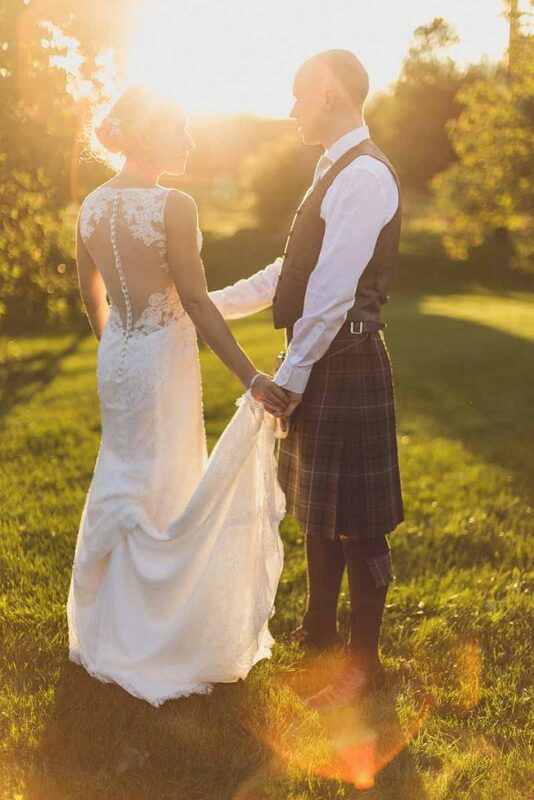 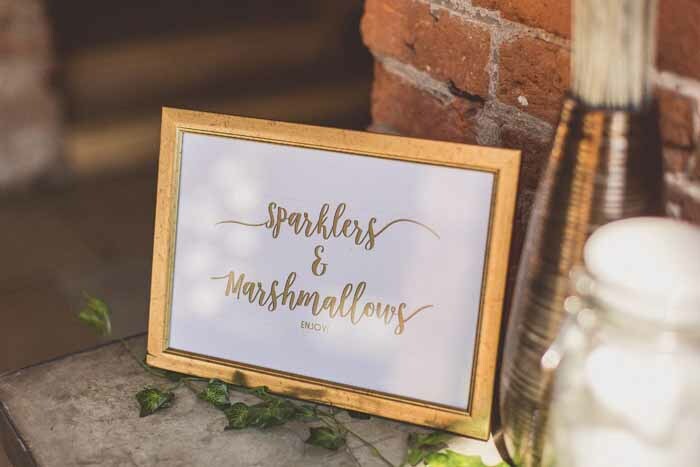 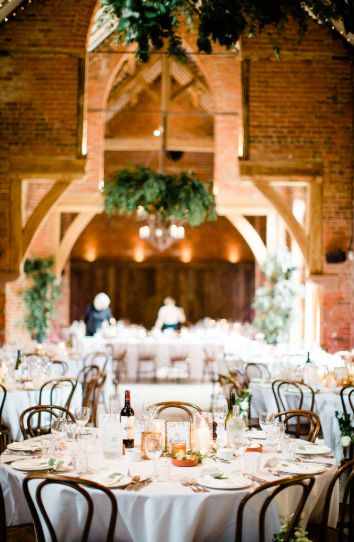 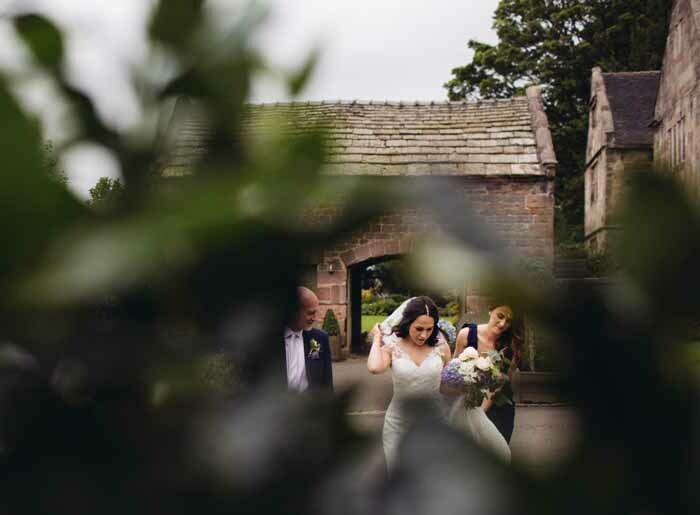 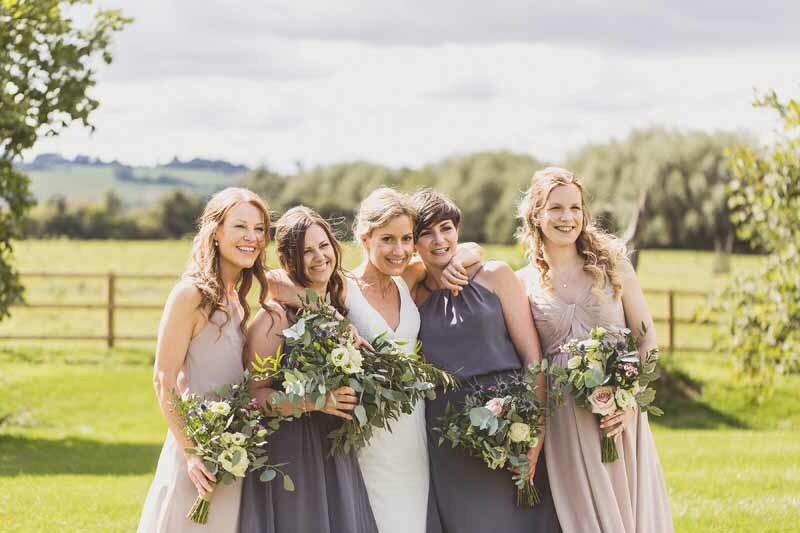 We love weddings at Shustoke Farm Barns and the atmosphere there suits laid back wedding styles. 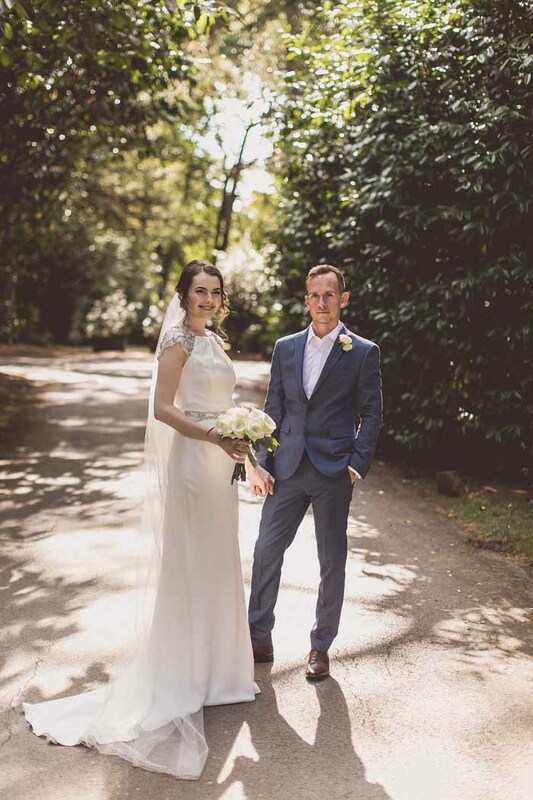 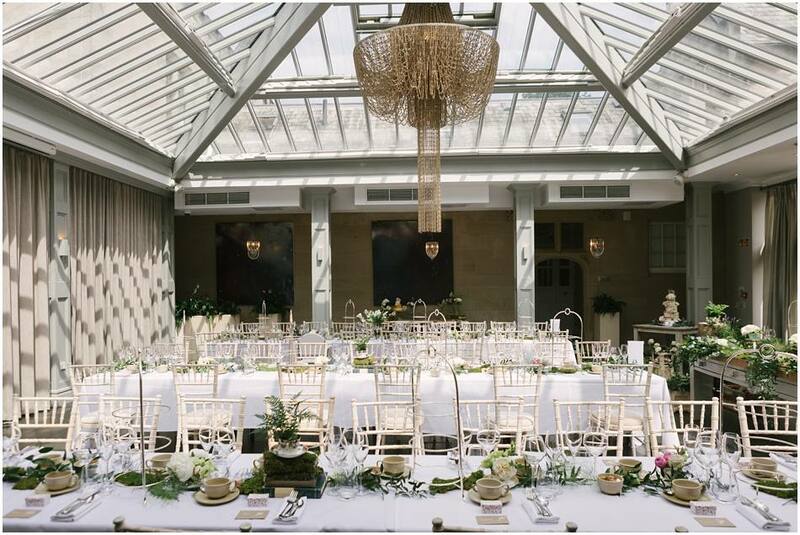 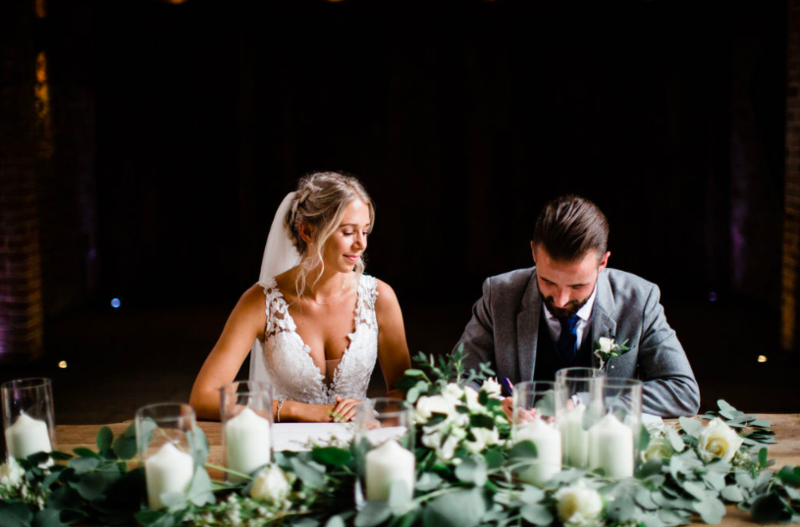 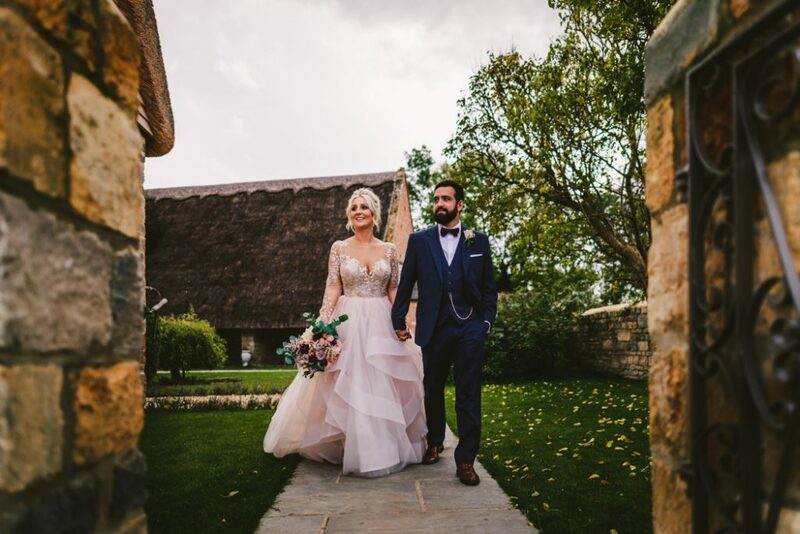 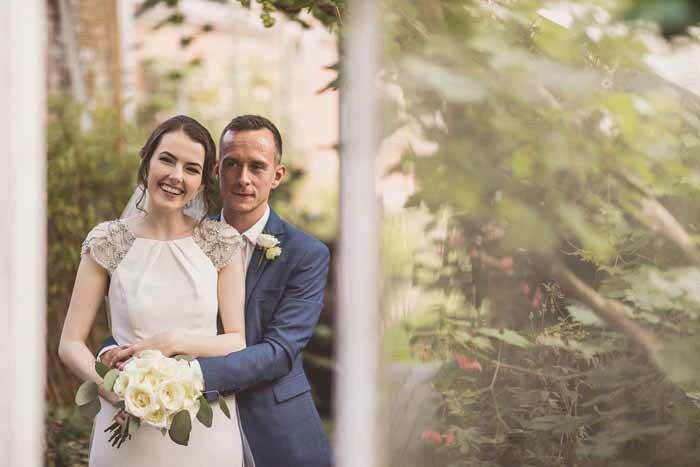 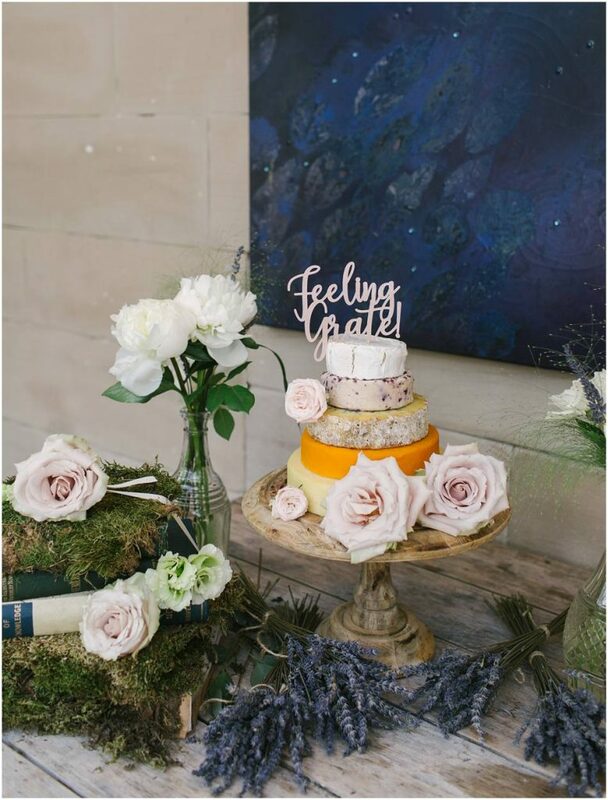 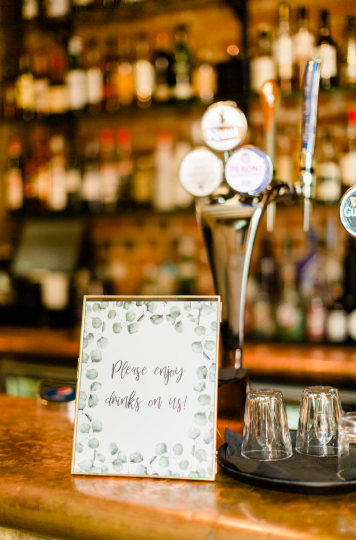 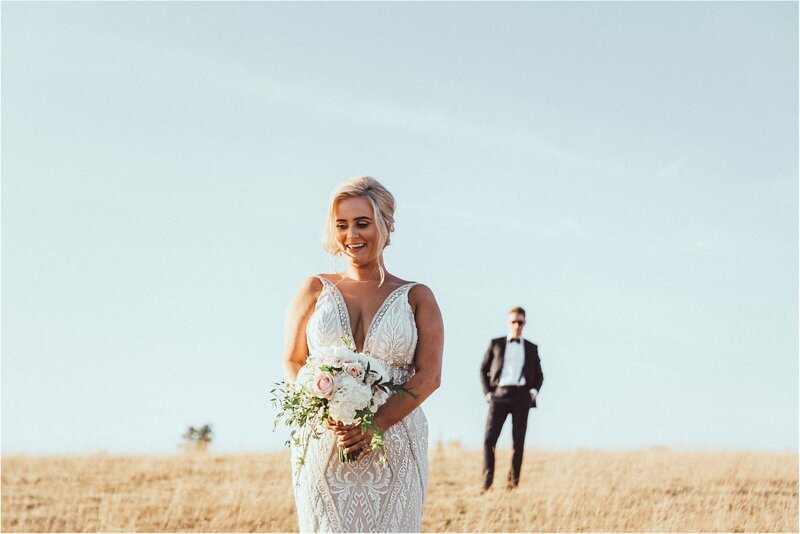 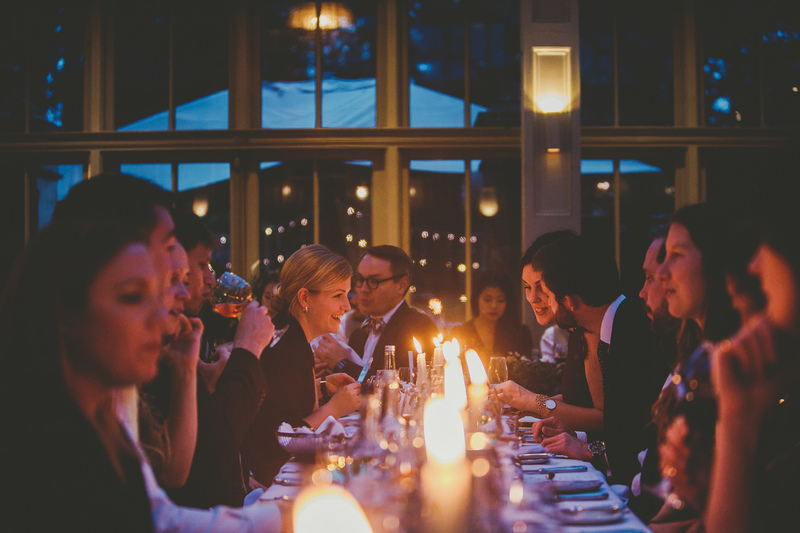 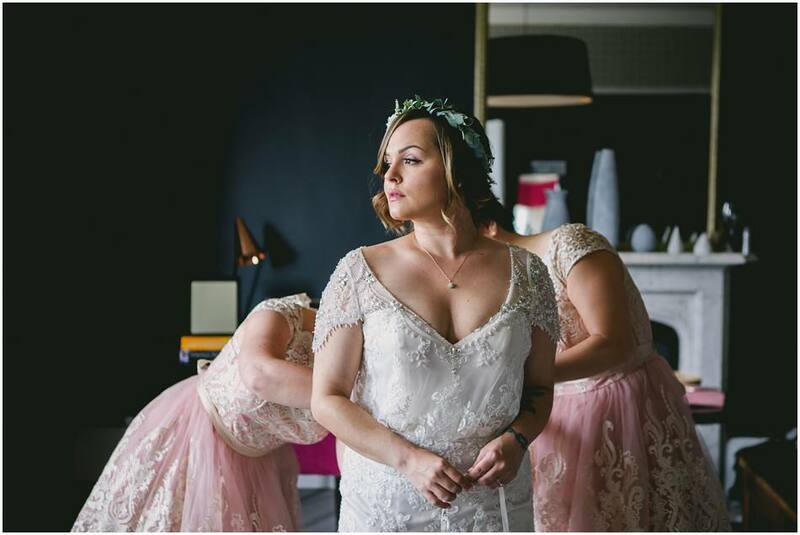 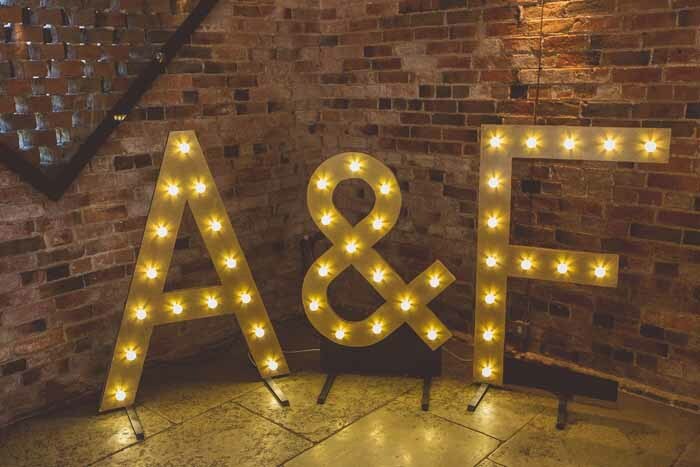 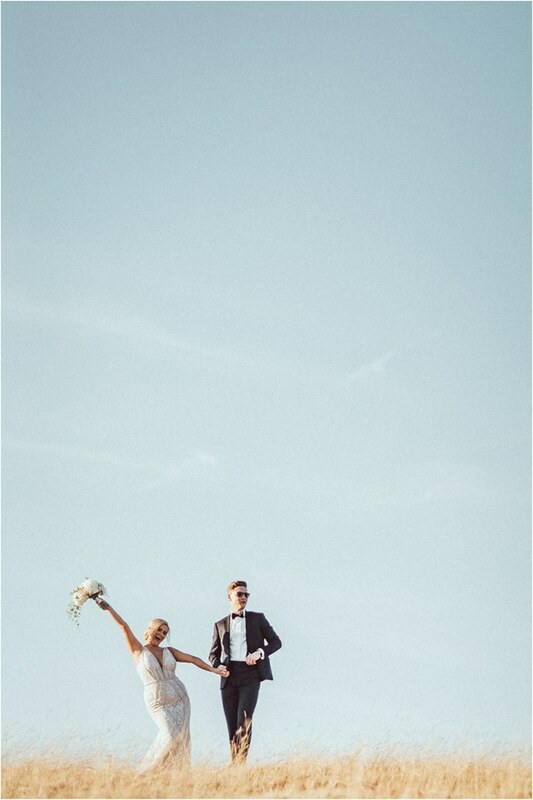 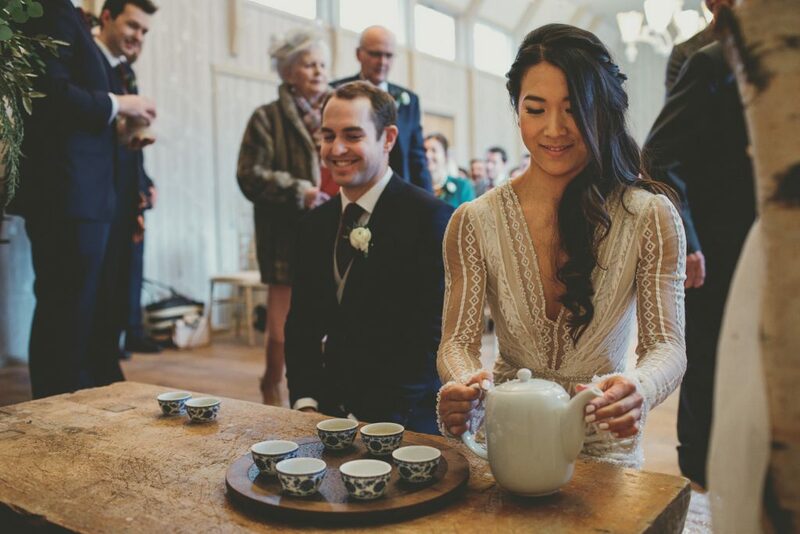 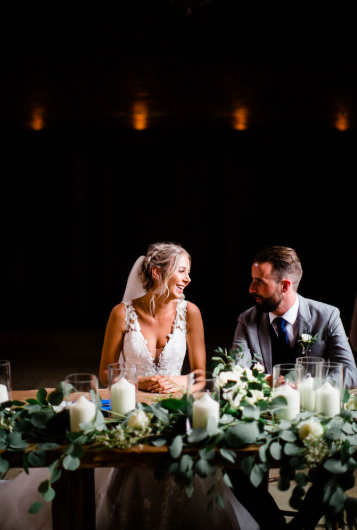 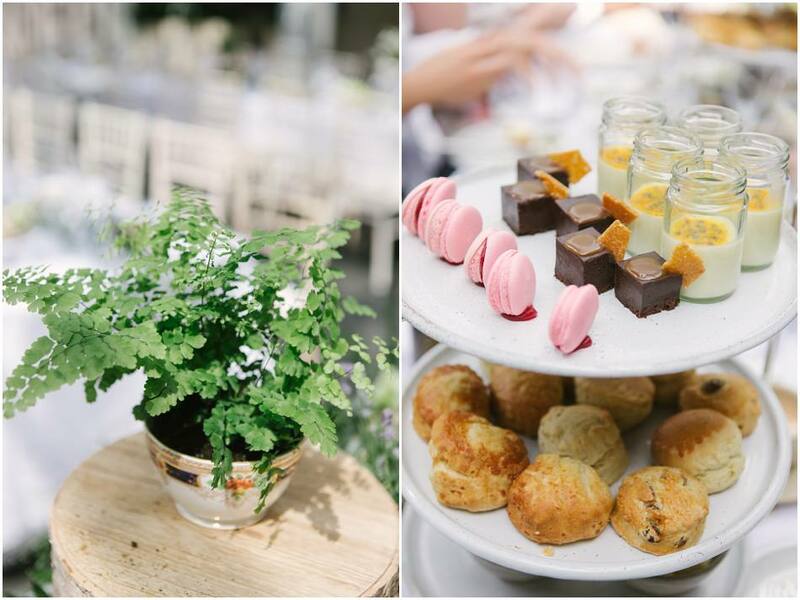 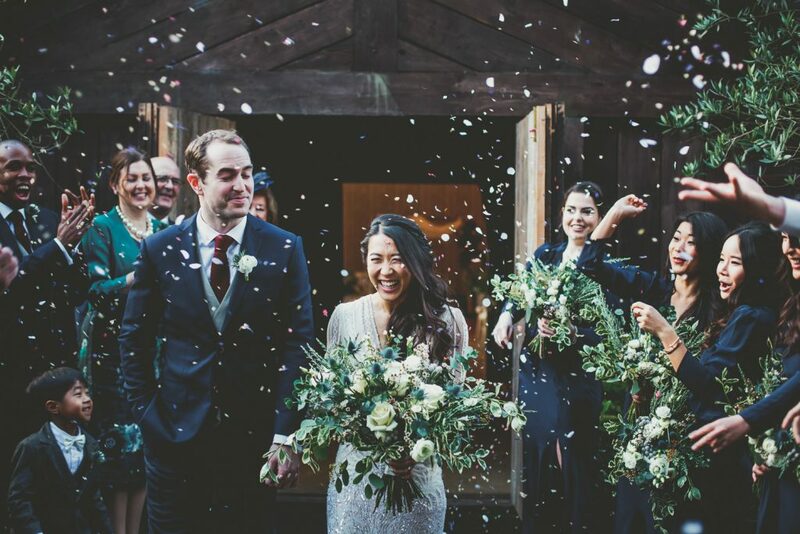 Fay and Andrew created a laid back feel beautifully captured by our photographer friends Anna and Simon Clarke. 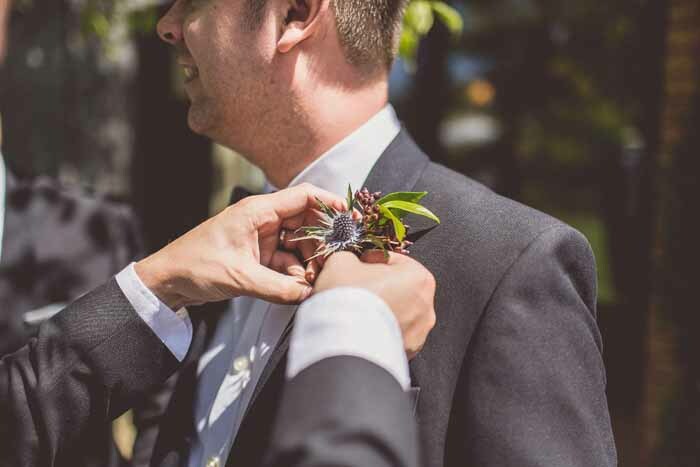 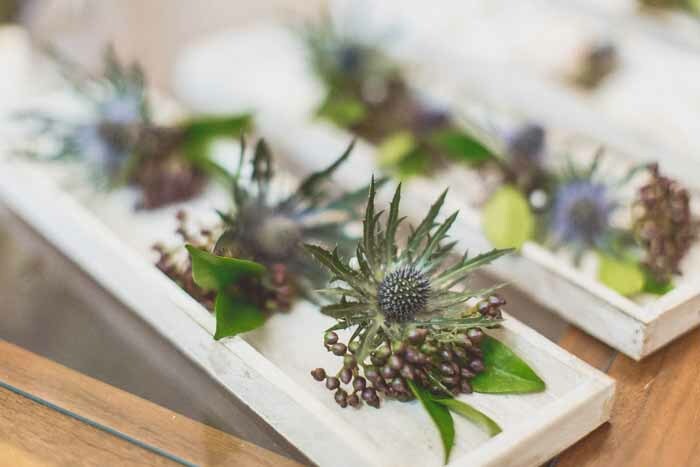 Thistles and viburnum berries created a relaxed look for the button holes for the groomsmen with rose bud and thistle wrist corsages for the girls. 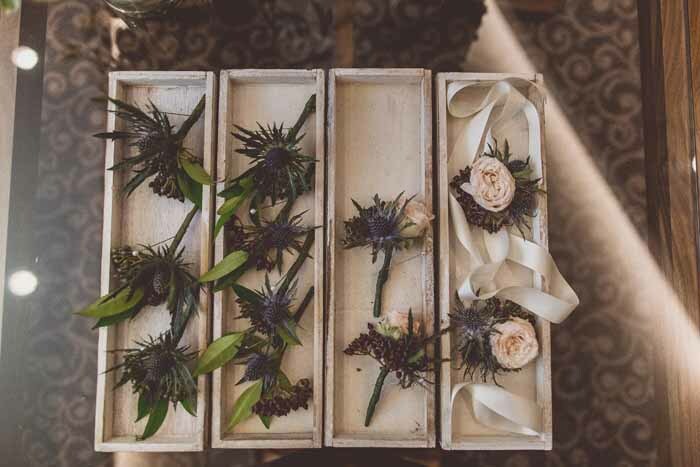 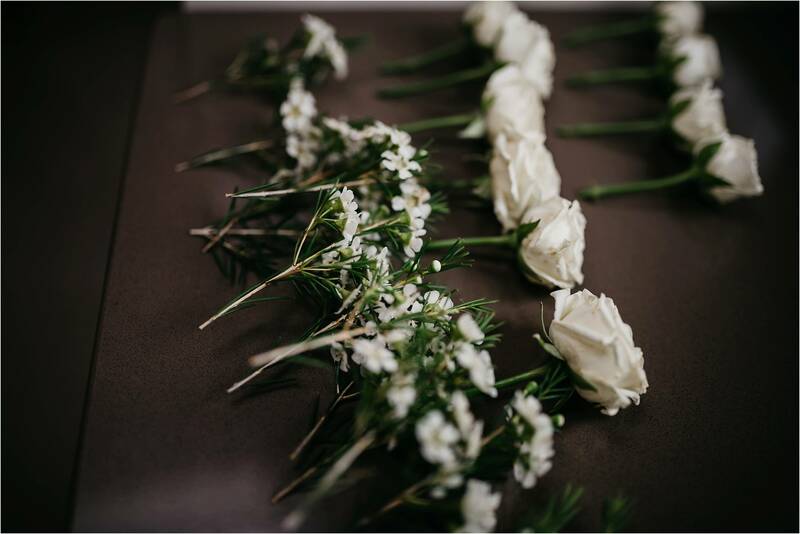 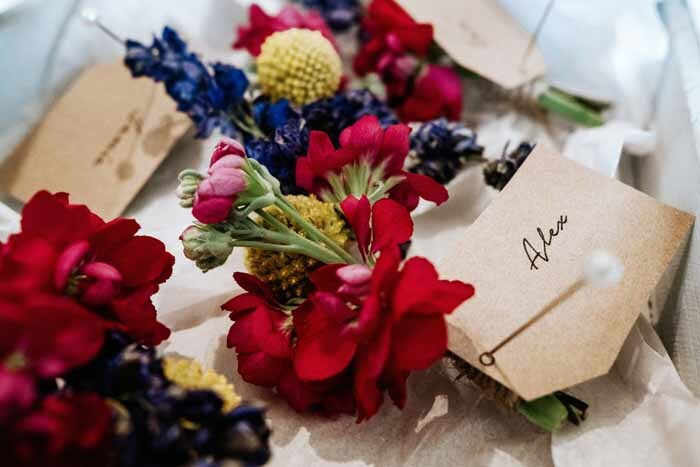 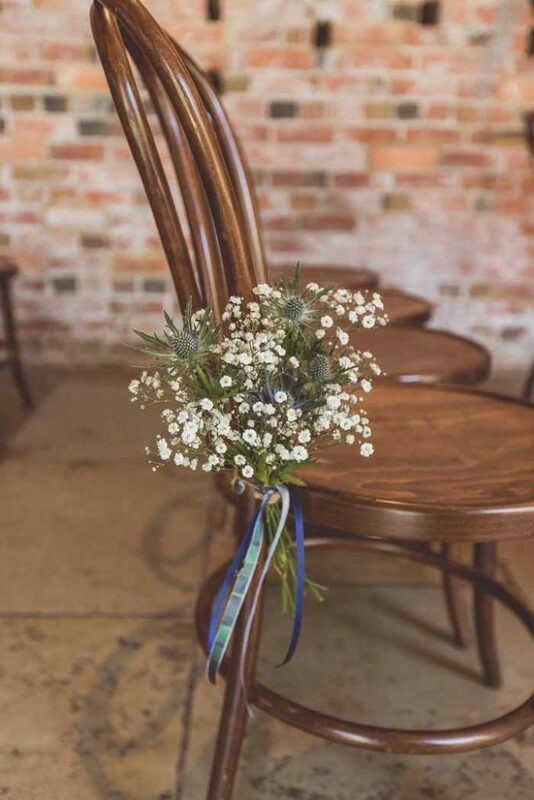 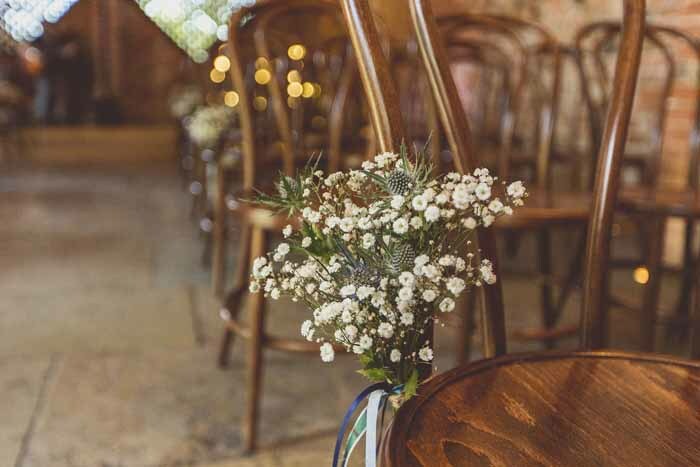 The aisle was simply decorated with bunches of gypsophila and thistle tied on with blue and tartan ribbons. 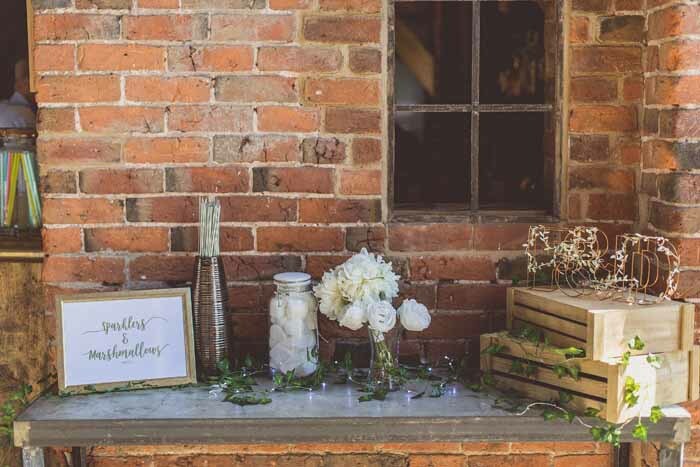 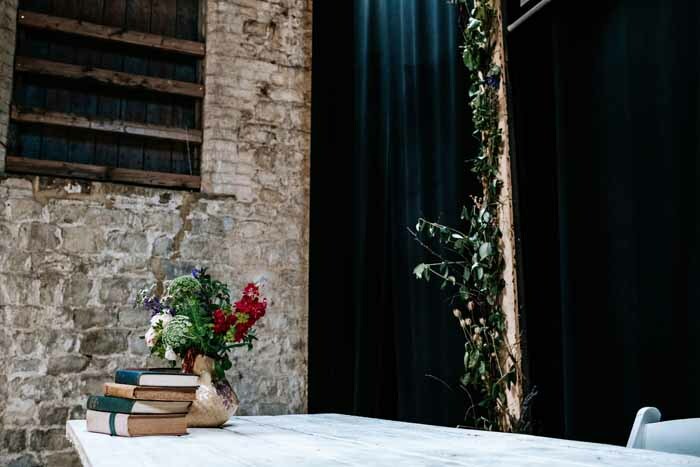 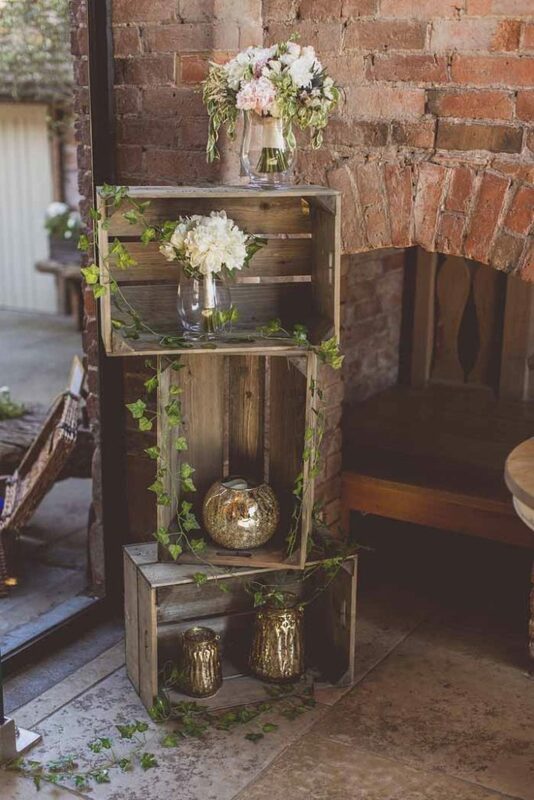 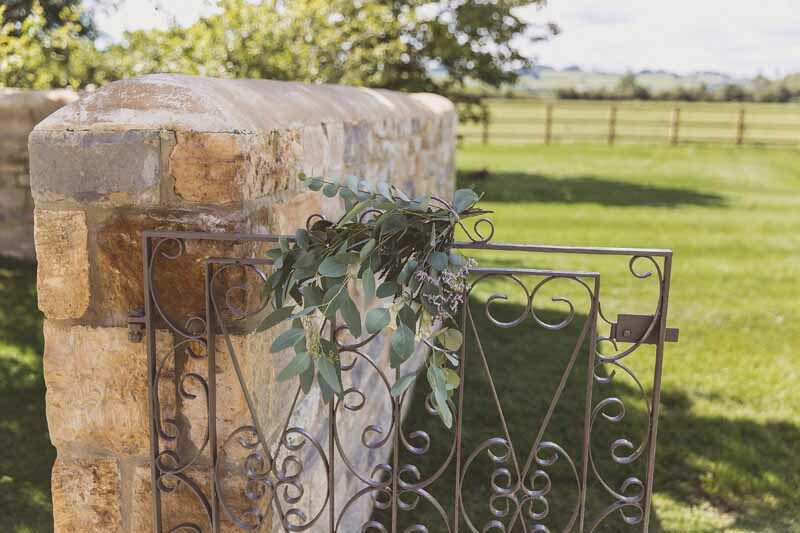 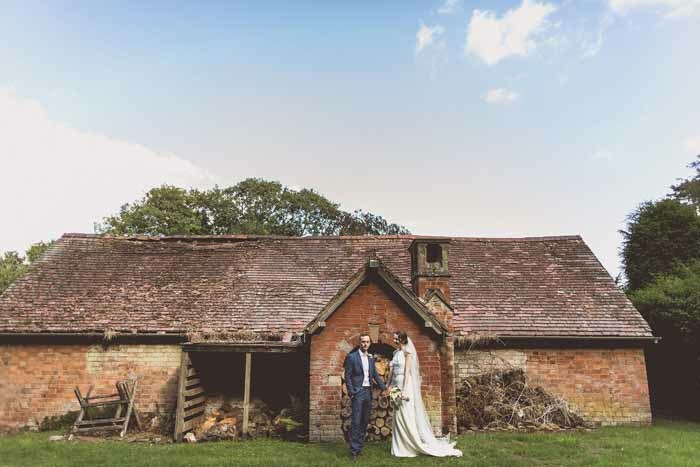 There are plenty of nooks and crannies to add rustic styling details at Shustoke Farm Barns, the brickwork is a really great backdrop for rustic decoration. 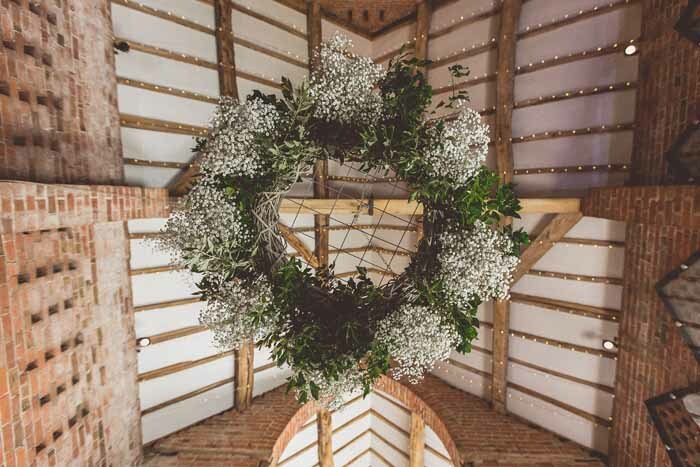 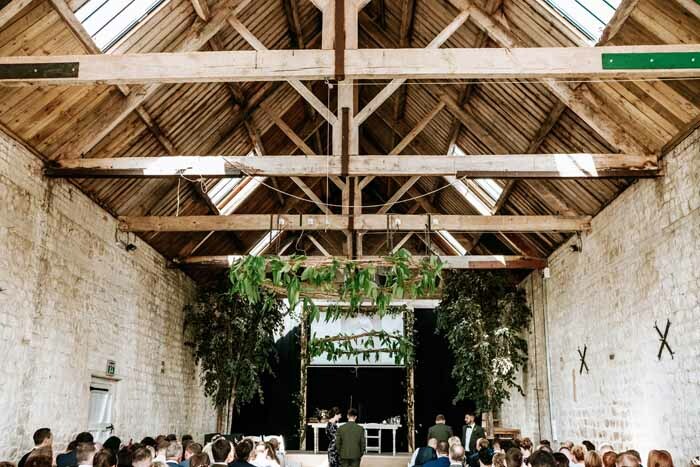 The Barn always benefits from over sized decoration and our large hanging hoops look great decorated to tie in with the colours and style of your wedding day. 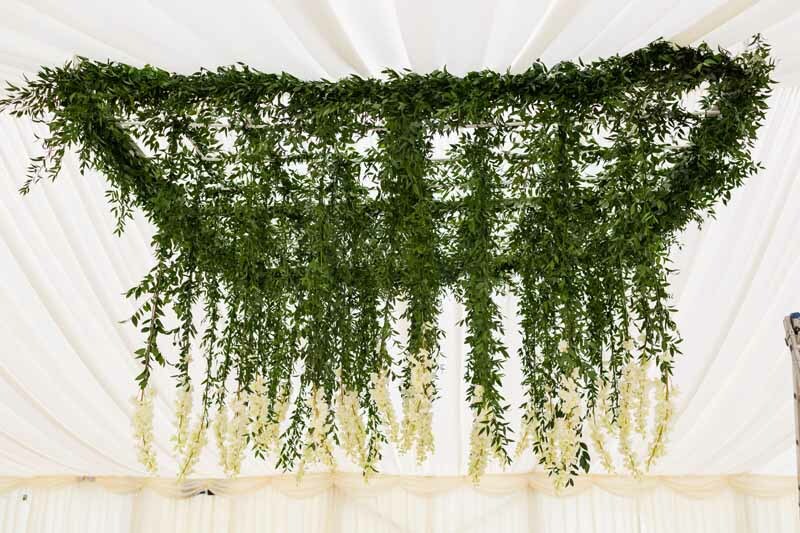 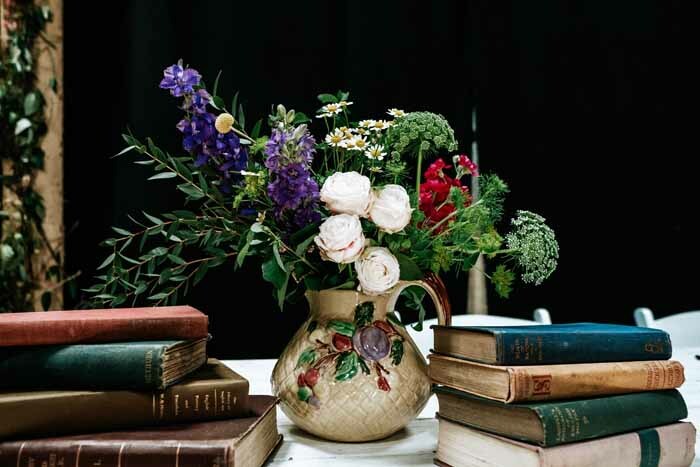 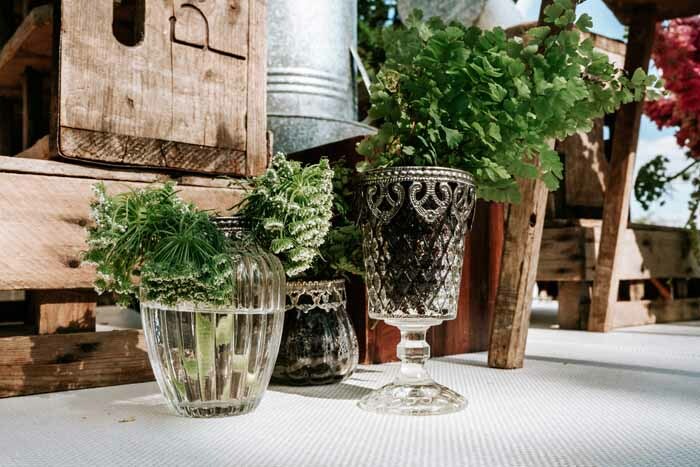 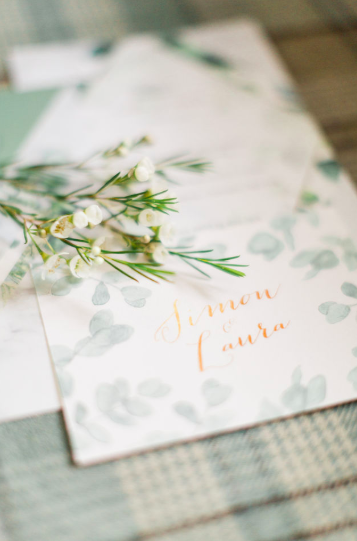 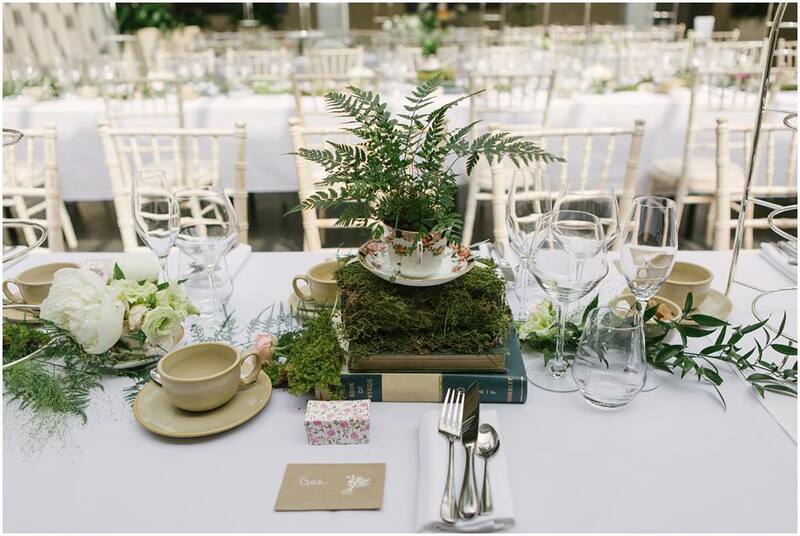 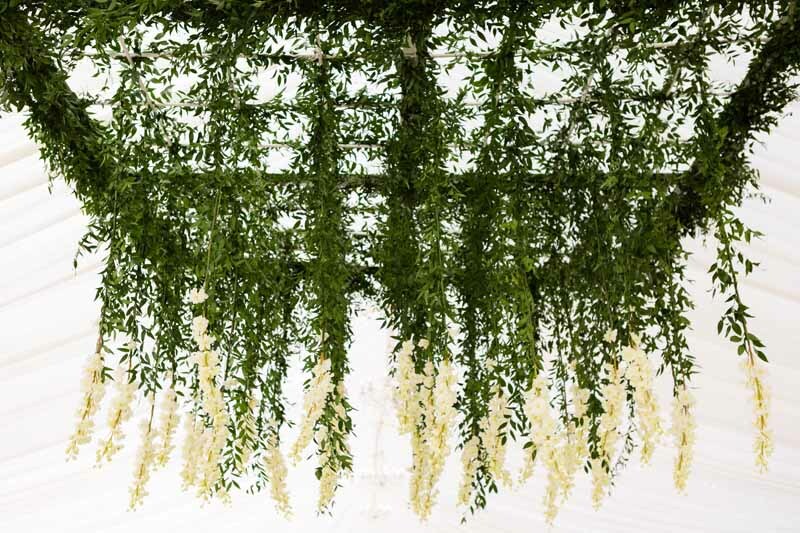 Here we included masses of foliage and clouds of gypsophila for a laid back look. 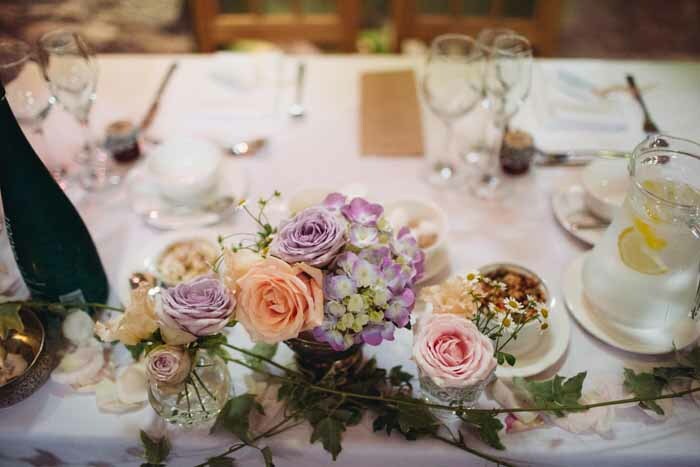 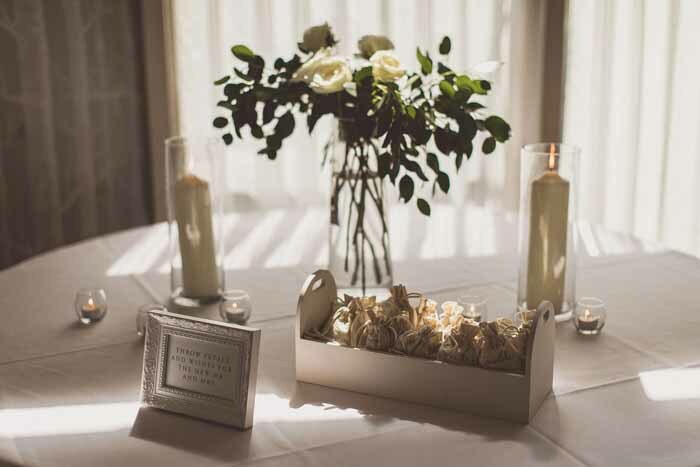 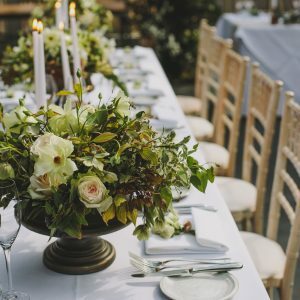 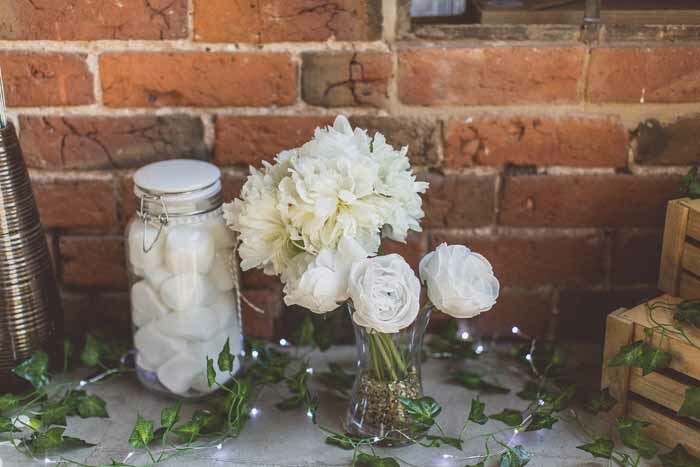 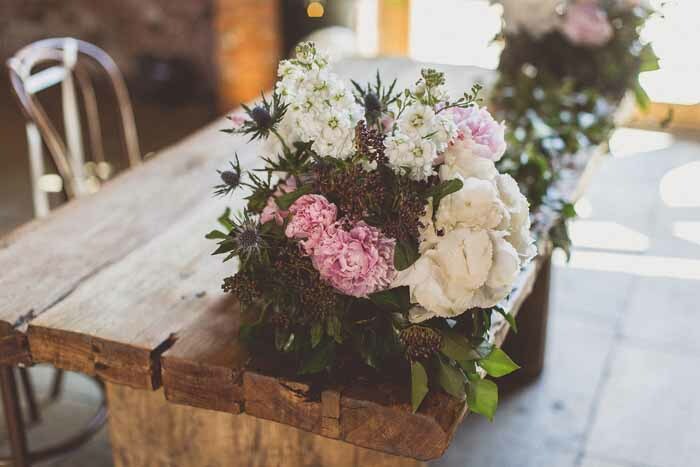 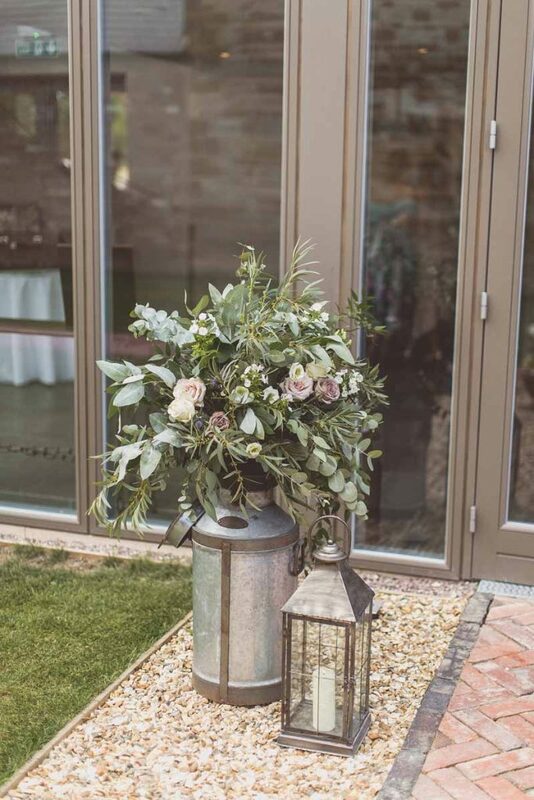 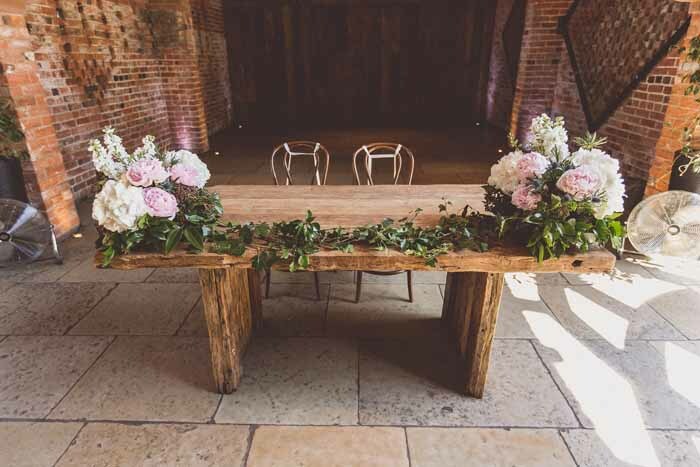 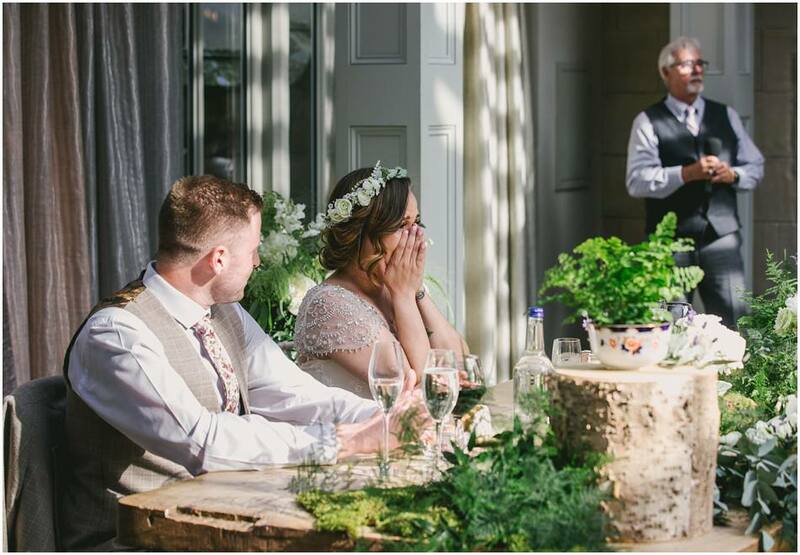 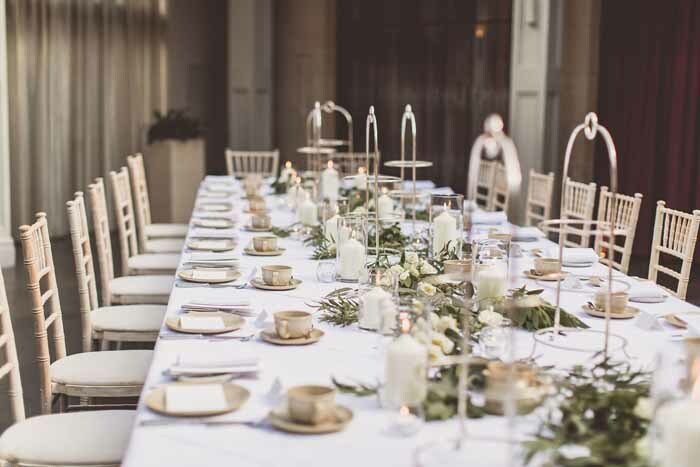 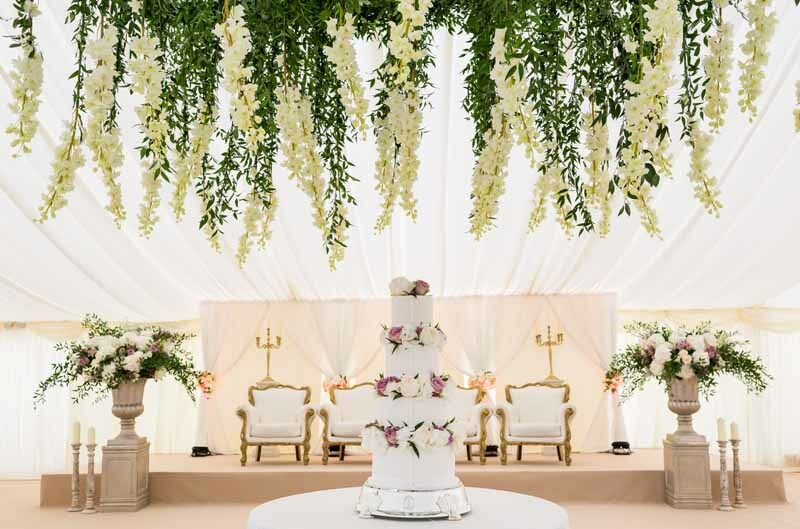 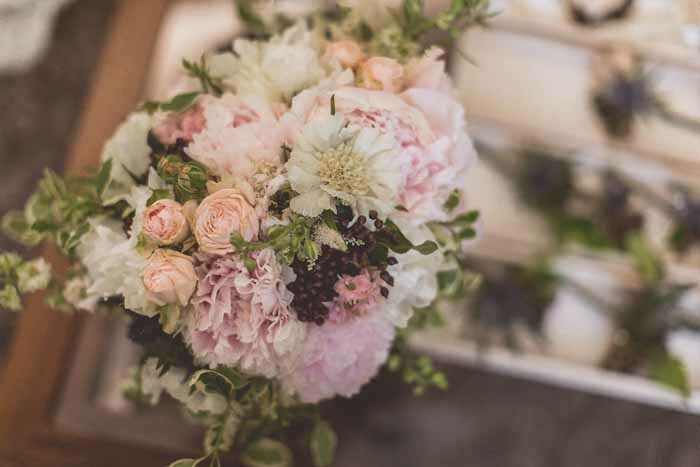 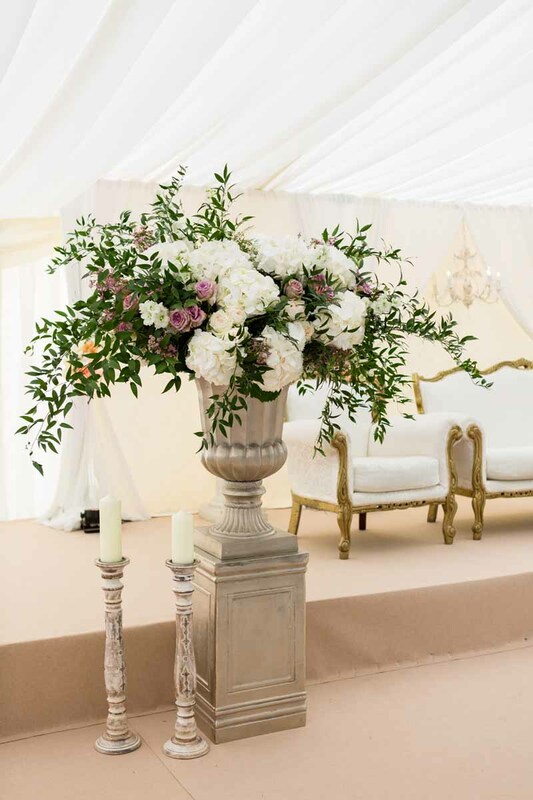 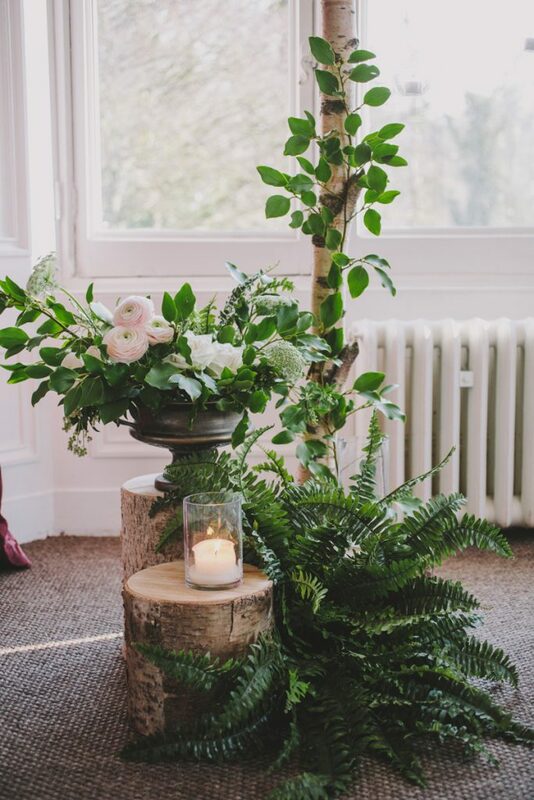 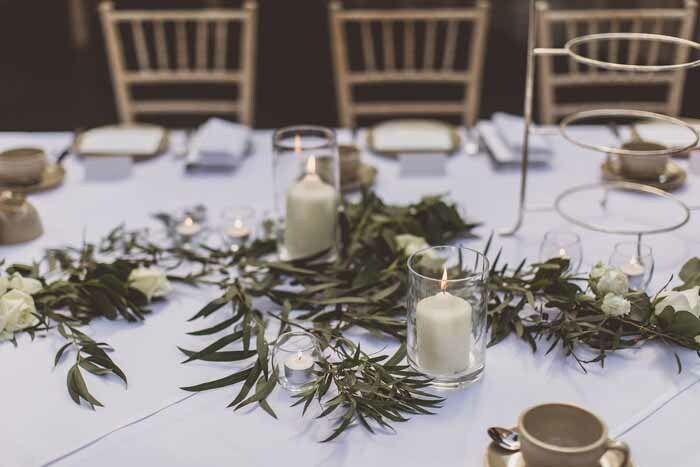 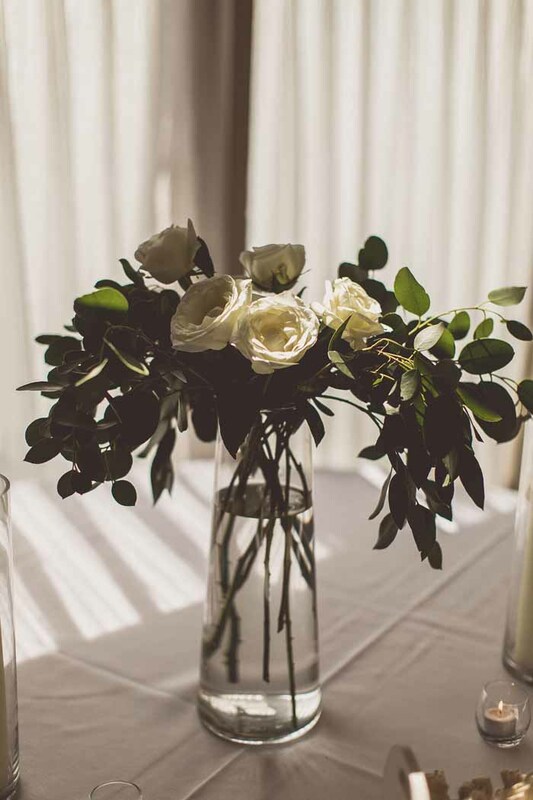 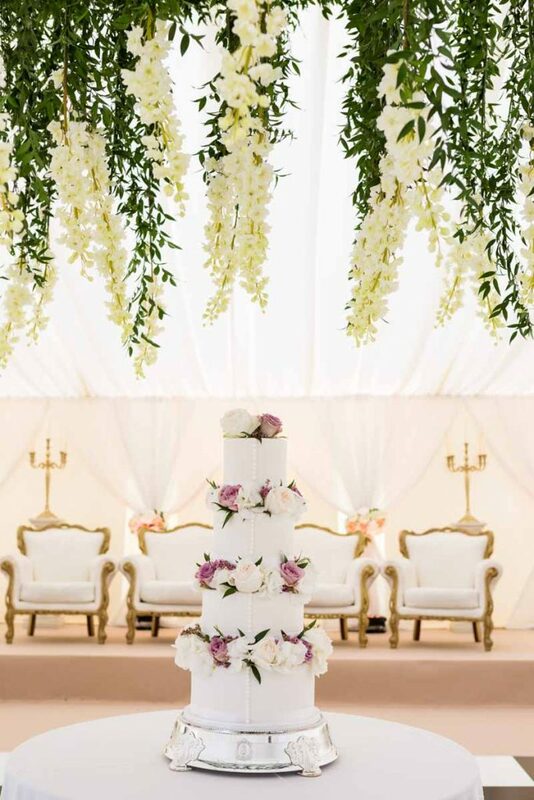 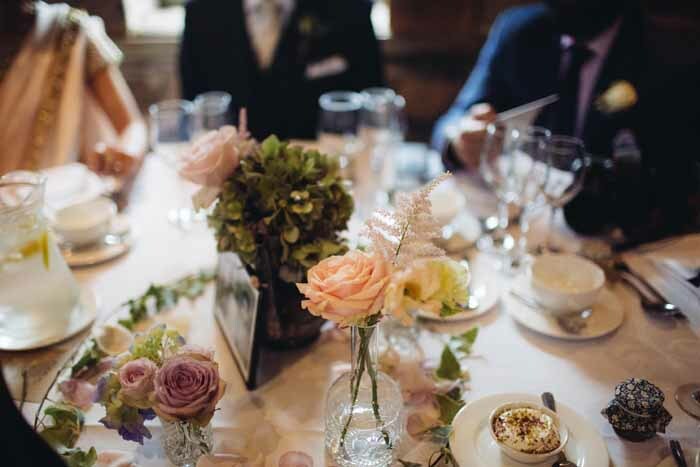 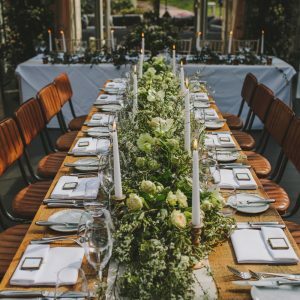 The ceremony table is a main part of the ceremony and looks good bedecked with laid back bunches of blooms from the day, scented peonies, stocks, hydrangea and lashing of foliage create the relaxed look required. 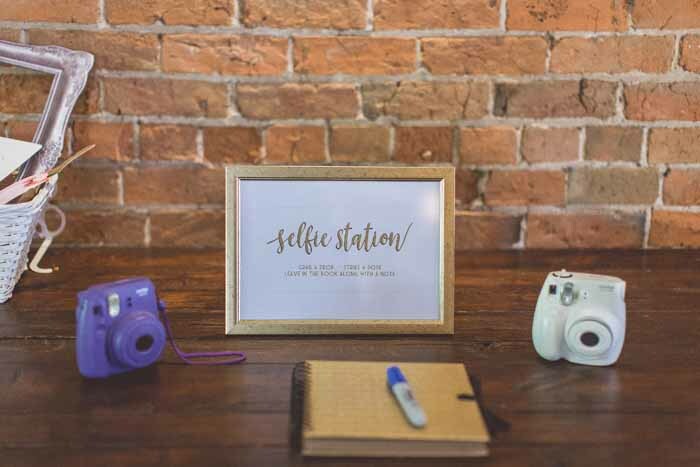 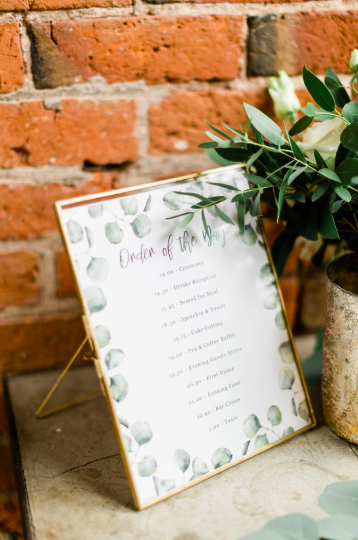 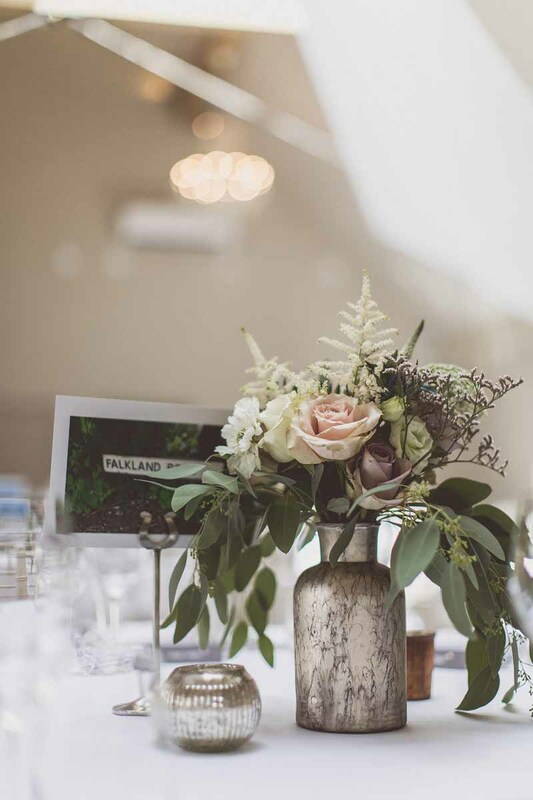 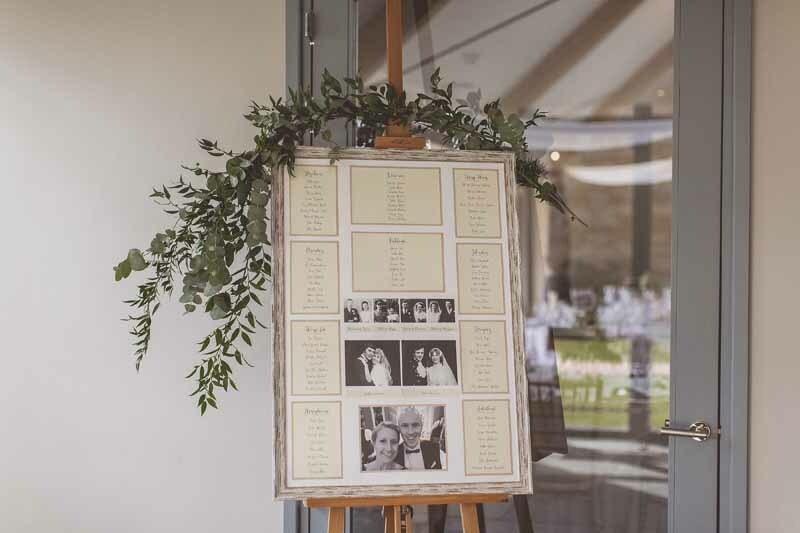 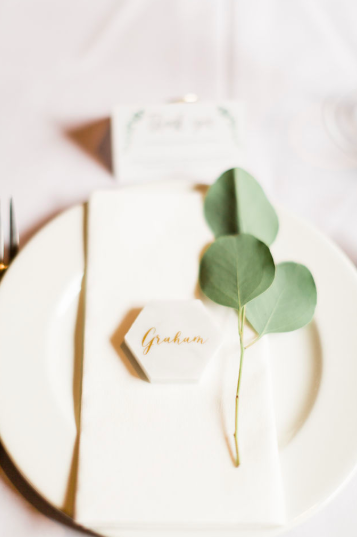 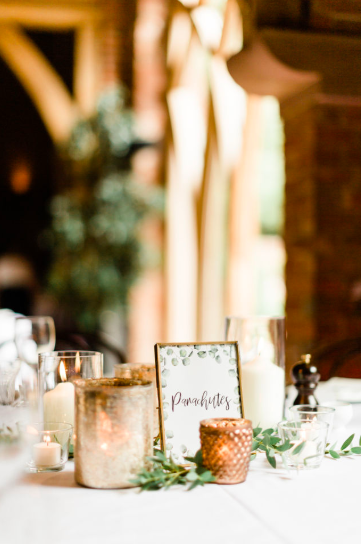 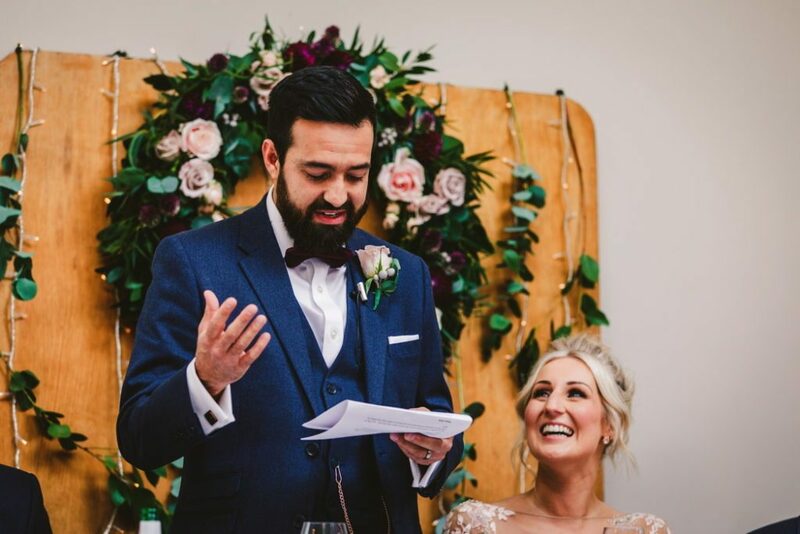 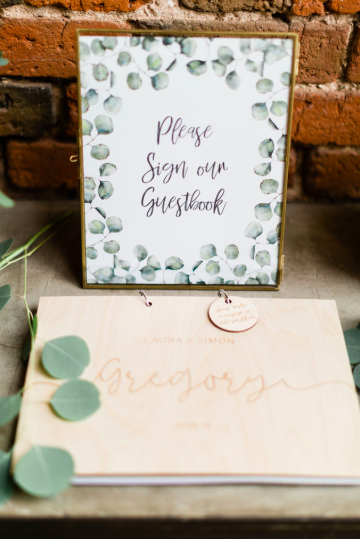 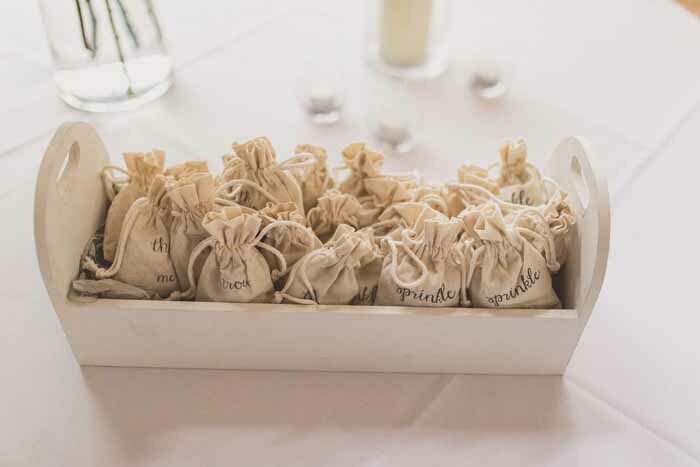 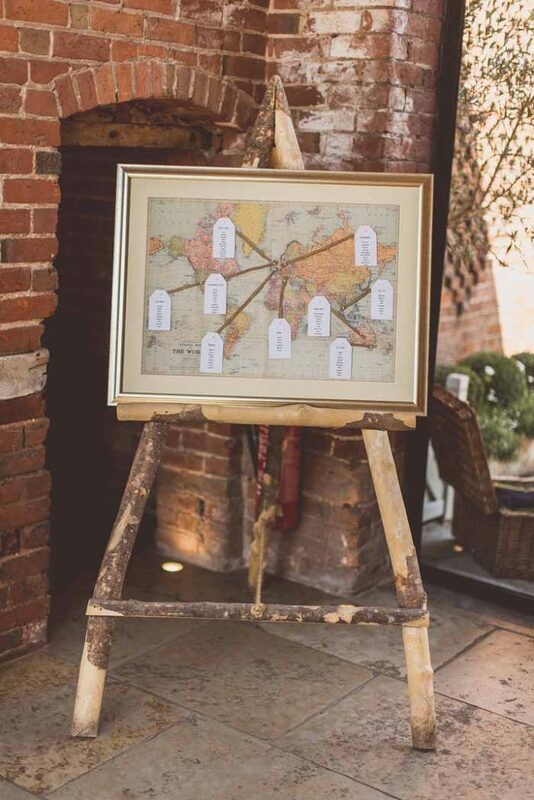 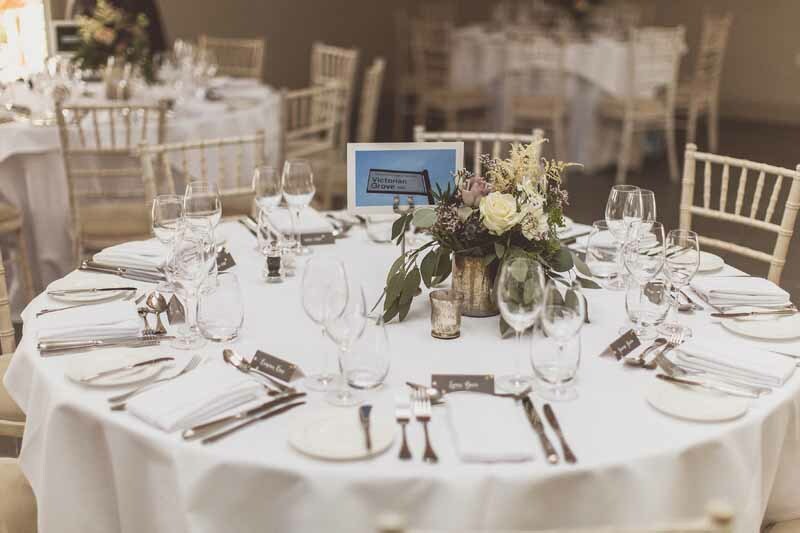 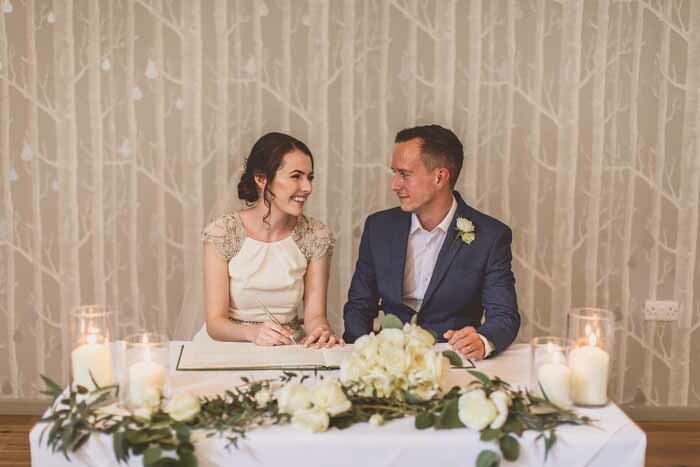 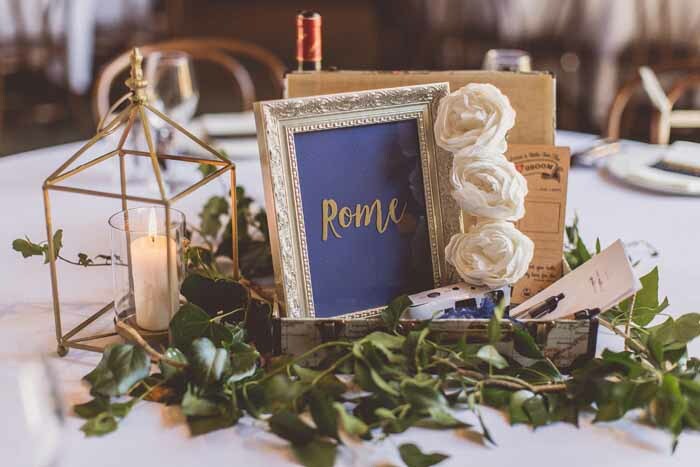 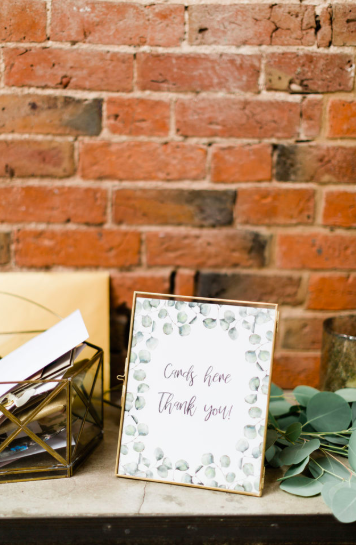 The world map table plan from the Wedding of My Dreams c]gave Fay and Andrew the chance to create a beautifully styled table plan for their guests. 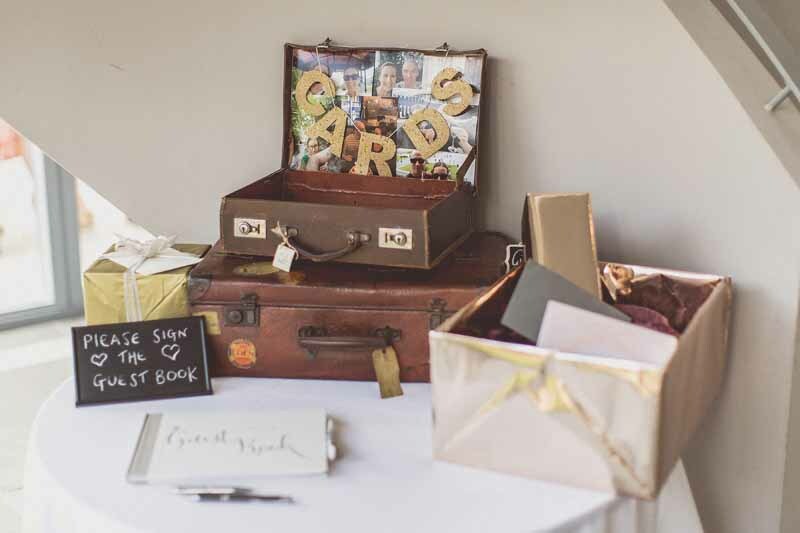 The couple continued the travel ideas with their fun, laid back centrepieces for the tables. 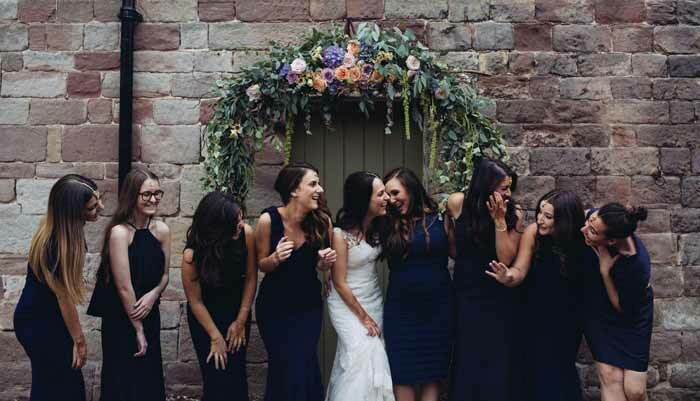 The courtyard is a fun place for family and friends to relax during the wedding day. 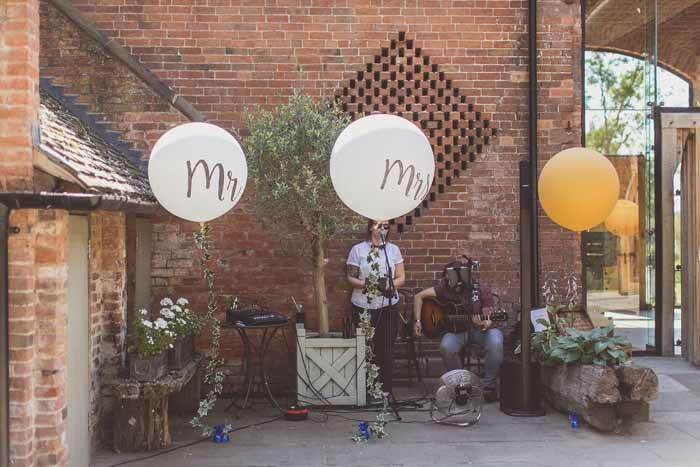 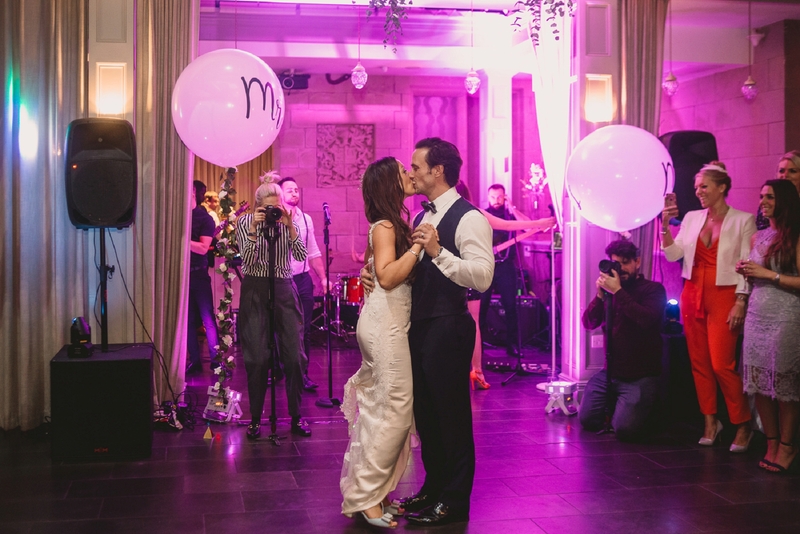 Here balloons from our other website The Wedding of my Dreams created a backdrop for the musicians.